Stock up on 6 bottles and 24 bottles of Electrolysis Enhancer for the month of September! Click HERE to shop today! 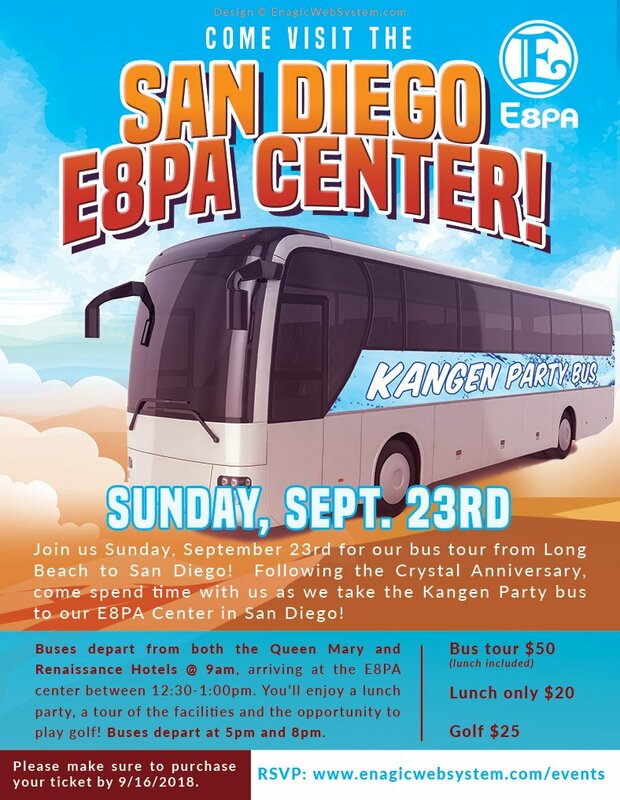 Exclusive Kangen bus trip to our San Diego E8PA Center! USA Crystal Anniversary Sales Campaign Extension! The game has been extended! Now there's even MORE of a chance for YOU to win big! We've extended the campaign deadline to SEPTEMBER 15th for our Crystal Anniversary Sales Campaign! We are happy to announce Enagic's E-Friends August 2018 Edition! Summer Success & Fun in the Sun! This new rules goes into effect for Enagic USA on August 1st, 2018. 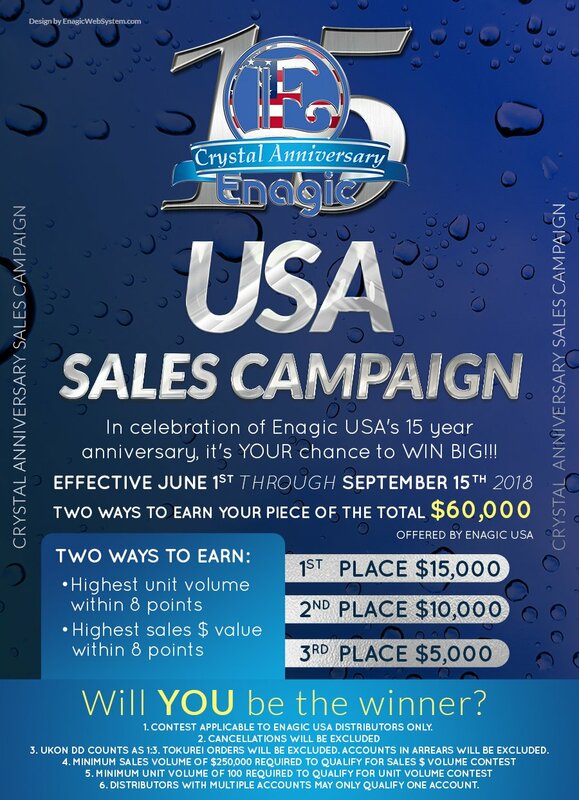 Enagic USA Crystal Anniversary, Sept. 22, 2018 - Get Your Tickets Today! Here's why you need to get your tickets ASAP!!! Don't wait! 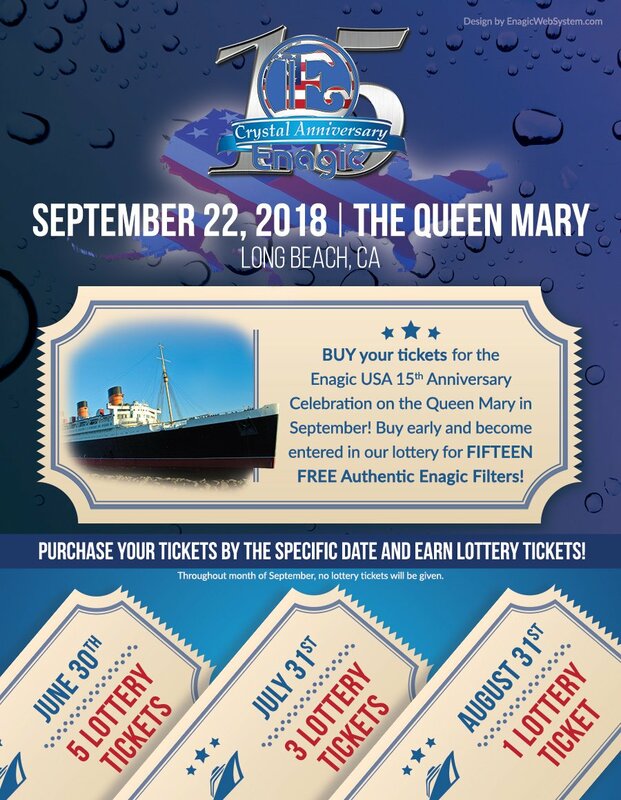 Instead, take advantage of YOUR opportunity to win by purchasing your tickets for the September 22nd, Enagic USA Crystal Anniversary on the Queen Mary! 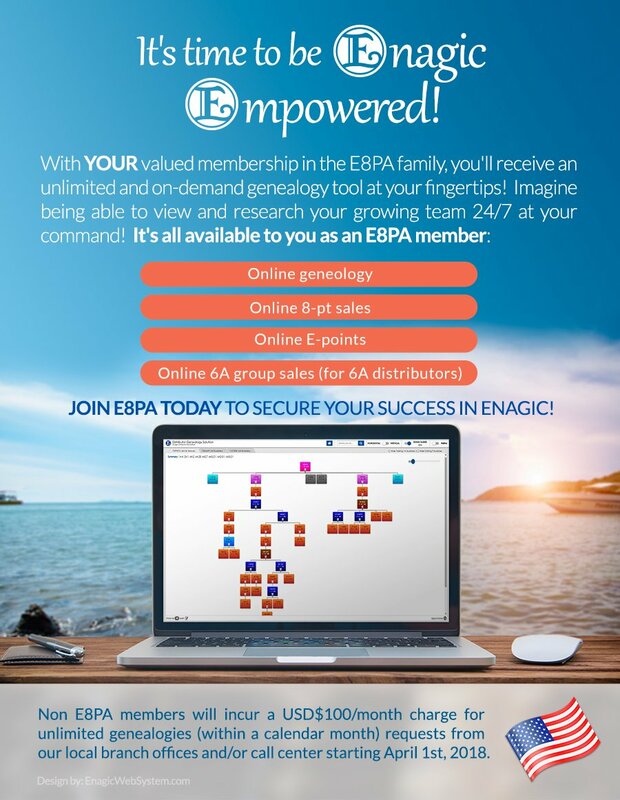 Our second installment in our series on using the Enagic E8PA Genealogy Solution! It's time to be Enagic Empowered! 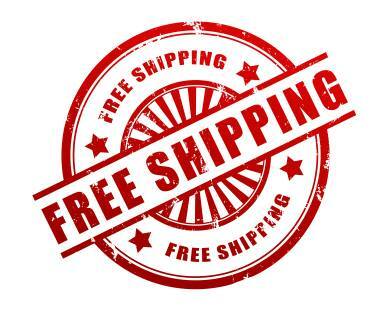 It's Free Shipping in March! View and download it here! It's Free Shipping in January! It's Free Shipping in December! We are proud to announce the opening of the new Enagic Europe branch in Germany starting from November 2, 2017, located in Charlottenstr. 73, 40210 Düsseldorf. Our AMAZING 2A Speedy Campaign is coming to a close! The most amazing sales campaign in the history of Enagic is coming to a close at the end of October 2017! How many people did YOU introduce to the magic of Enagic? 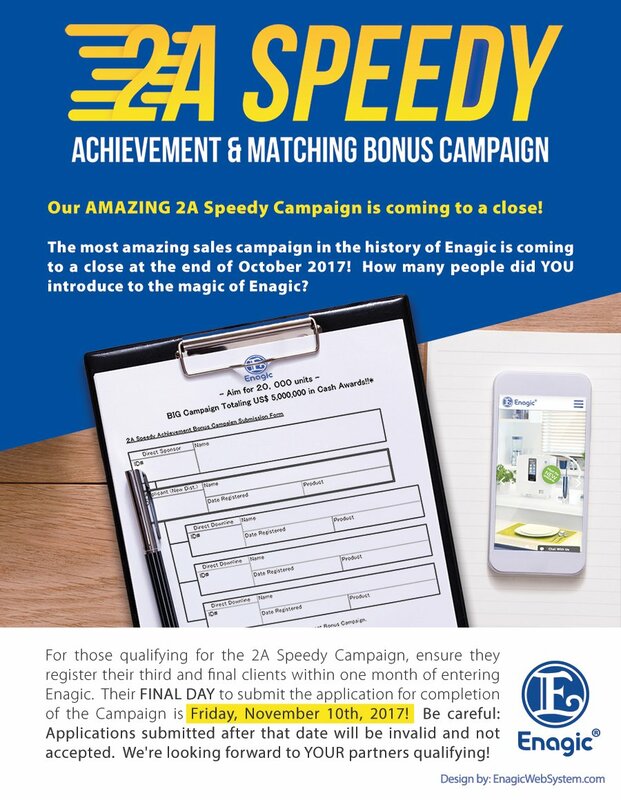 For those qualifying for the 2A Speedy Campaign, ensure they register their third and final clients within one month of entering Enagic. Their FINAL DAY to submit the application for completion of the Campaign is Friday, November 10th, 2017! Be careful: Applications submitted after that date will be invalid and not accepted. We're looking forward to YOUR partners qualifying! All U.S. Branches will be closed on Monday, October 9, 2017 for the Columbus Day holiday. Business will resume on Tuesday, October 10, 2017. All branches will remain open during regular business hours on Saturday, October 7, 2017. It's Free Shipping in October! *Valid on up to $20 of shipping fees. For orders with over $20 in shipping, $20 will be deducted from entire shipping fee. For orders with shipping fees under $20, no shipping fees will be charged. 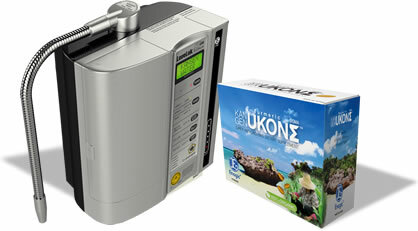 Additional clarification on Enagic's new Ukon SIGMA program! The Florida office will be CLOSED today (9/11/17) due to Hurricane Irma. We will post updates as we receive them. 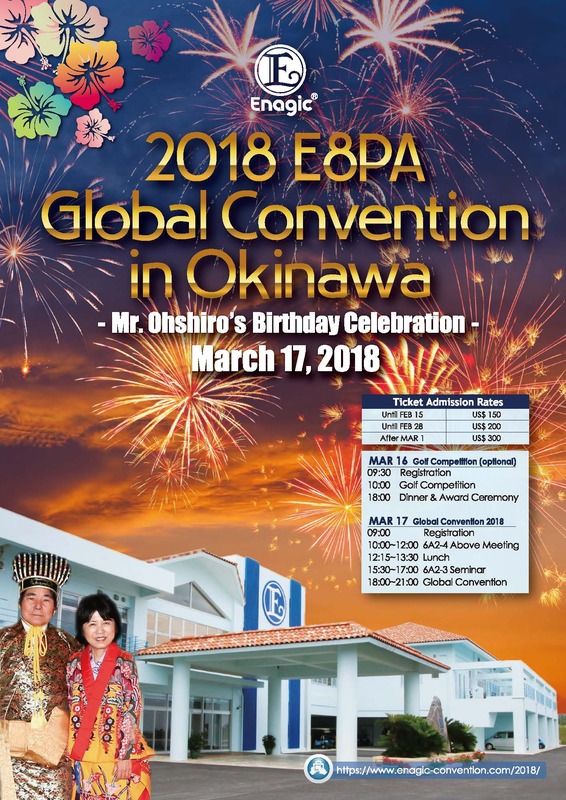 Important Announcements from Enagic Global Sales Headquarters (Okinawa)! 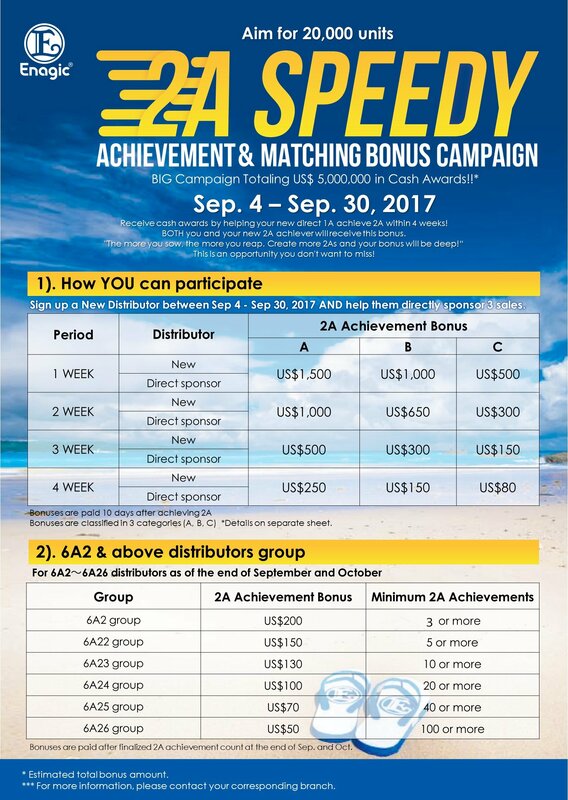 Effective September 4th, 2017, we will be introducing our new "2A Speedy Achievement & Matching Bonus Campaign," as well as our "Ukon ∑ New." The price for our Leveluk R will be increased. Additional information to be announced soon. The cost of trading just got even BETTER! 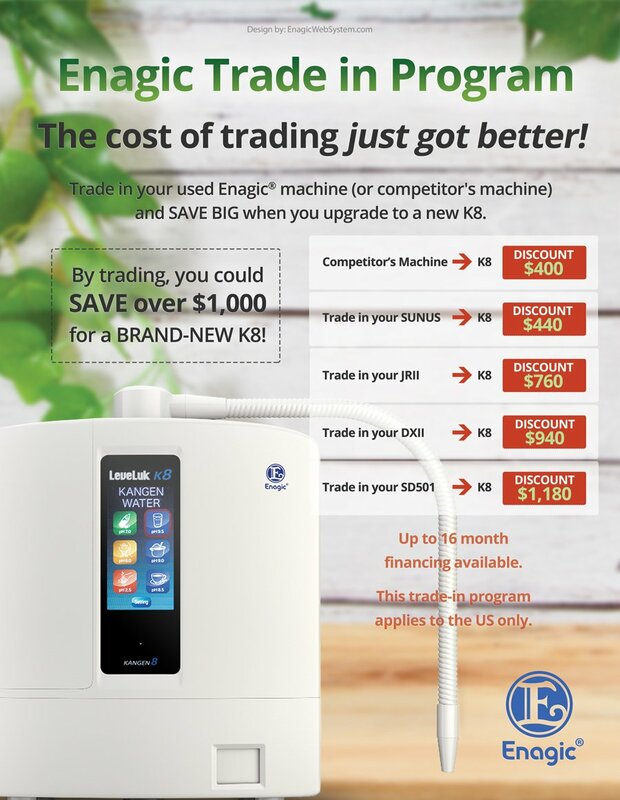 With the new Enagic Trade-In Program, you'll be able to trade in your old machine(s) and SAVE BIG on a brand new K8 or an SD501! 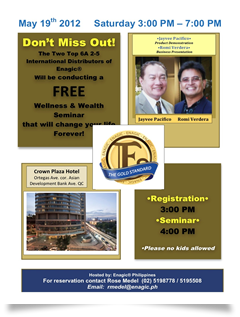 Hello Enagic family! We've got some EXCITING news! This new model features a larger ceramic cartridge, with an even greater amount of ceramic balls from the Futamata Radium Hot Springs and Chikutan. The new ceramic cartridge ensures the removal of almost 100% of residual chlorine! The ceramic balls from the Futama Hot Springs contain Tufa (extracted from the hot springs), which metabolizes when hardened and provides a relaxing and therapeutic hot spring effect. In other words, it'll feel like you're actually soaking at the Futamata Hot Springs in the comfort of your own home! The MIC stones within the ceramic balls is rich in minerals and purifies your water while absorbing toxic substances. These stones generate mildly alkaline water - which is beneficial for the skin. The Chikutan Ceramic balls help to clean the air while generating strong negative-ions that provide a relaxing and soothing effect. 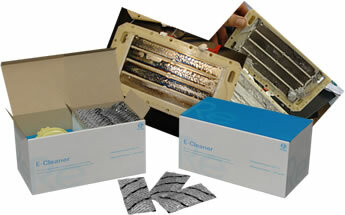 Furthermore, the base has been redesigned for a more efficient filter replacement process. All together, these features will work to protect your skin, hair, and will UPGRADE your beauty lifestyle to the next level! And for those of you who are still waiting on a backorder , you will receive the NEW Anespa DX at NO ADDITIONAL COST (once they arrive from our factory in Japan)! This $500 discount is only available for the month of July, so don't wait! ORDER NOW! 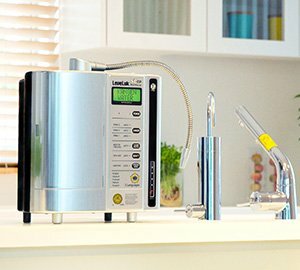 New Enagic Policies and Procedures have been released with the recent changes on our website, Distributor Area access and integration with EWS - Enagic Web System. 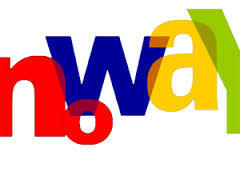 All marketing and online advertising must be done through an EWS site. This will assure all distributors get a professional and Company-approved presence on the Internet. 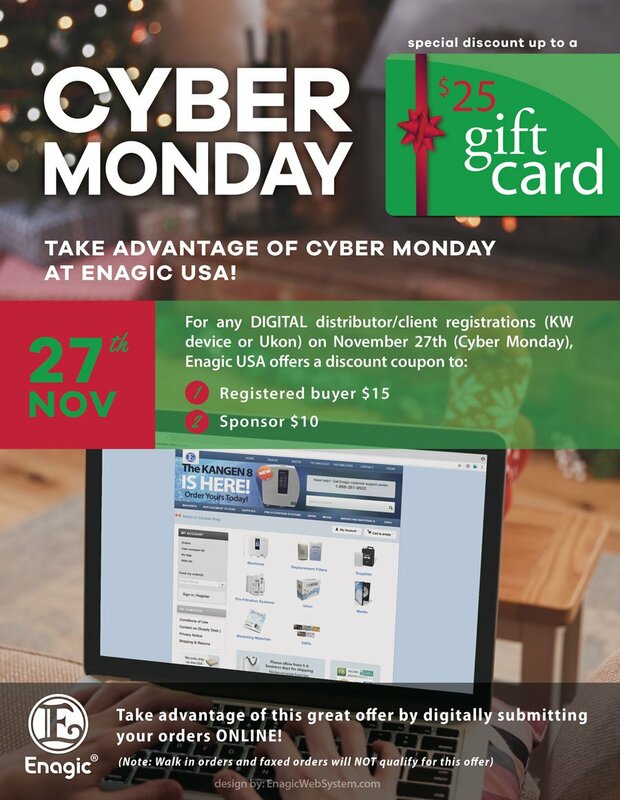 All Enagic Distributors get a Basic FREE EWS account. To get yours, simply go to the Login section in our website and register to create an account. 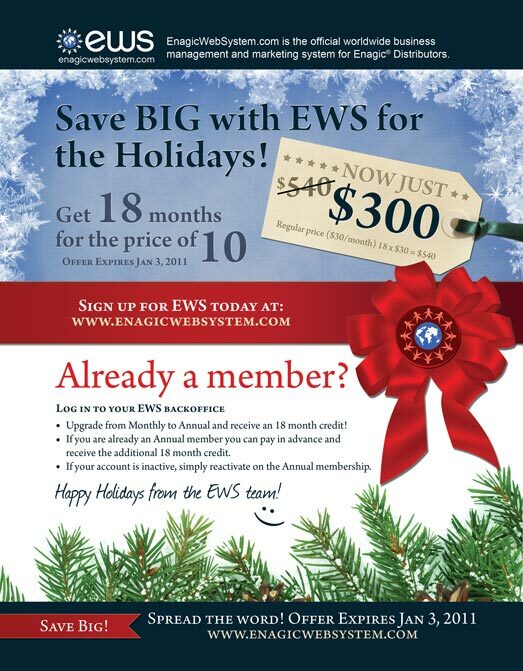 If you already are an EWS member, you don’t need to register. Simply login using your current username and password. Your Distributor Area is now integrated to your EWS Backoffice. To access it simply login to your new or existing EWS account. The EWS 21-day trial period for a $1 payment is no longer available. This is due to all Enagic Distributors now having a Basic FREE EWS account access. 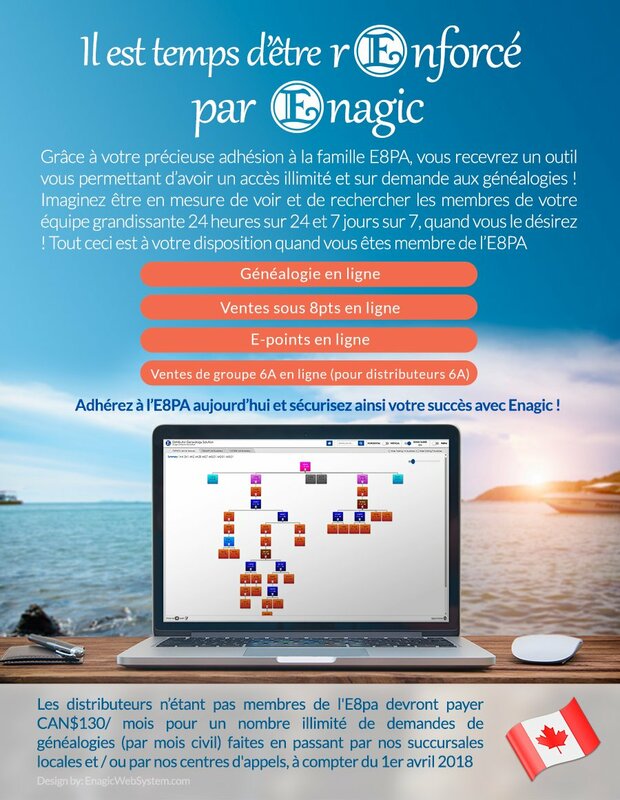 To get more features for your Enagic online business look for the new paid programs available and choose the one that best suits you. To see more details and learn more about these changes, please revise our Policies and Procedures document available in the Compliance Menu on your new Backoffice Distributor Area. We improve every day to make sure you make the most out of your business! Click here for current status! 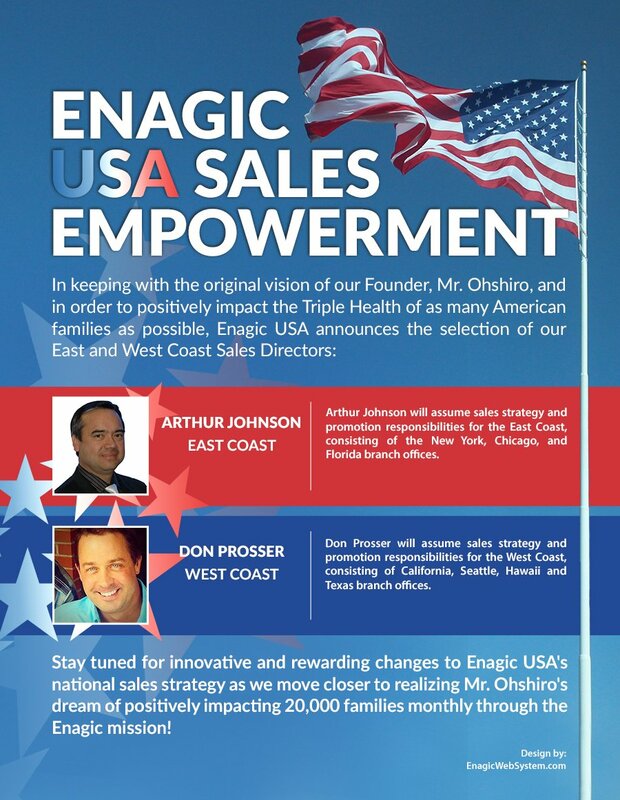 Enagic USA and Enagic Canada are proud to announce the empowerment of our sales leadership! Enagic USA is proud to announce our new and revised website! We've revised our Enagic USA corporate website to include the latest bells and whistles! 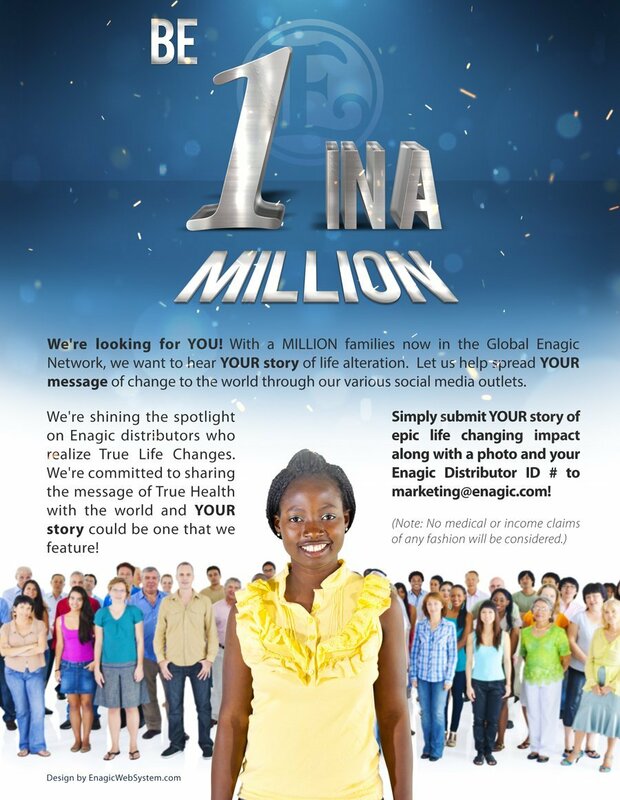 All in an effort to serve YOU better and more powerfully brand the Enagic Mission of True, Triple Health. Senior corporate management at our Japan HQ has decided the following in regards to the UKON DD rules. Effective April 15 2017, UKON DD commissions are paid out after being accumulated $200 or over (per Distributor ID number) on daily basis. E8PA members are entitled to receive an $80 loyalty discount upon signing up for UKON DD or its renewals. Each card type covers certain numbers of multiple UKON DD accounts for an $80 discount. It's Free Shipping in April! 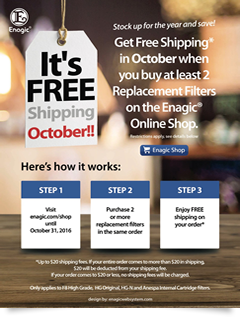 Get Free Shipping in April when you buy at least 2 Replacement Filters on the Enagic® Online Shop. * Up to $20 shipping fees. If your entire order comes to more than $20 in shipping, $20 will be deducted from your shipping fee. If your order comes to $20 or less, no shipping fees will be charged. Senior corporate management at our Japan HQ have decided the following in regards to the price increase for our Kangen Ukon products, effective April 3, 2017. Due to increased production costs, the price has been raised to $760. 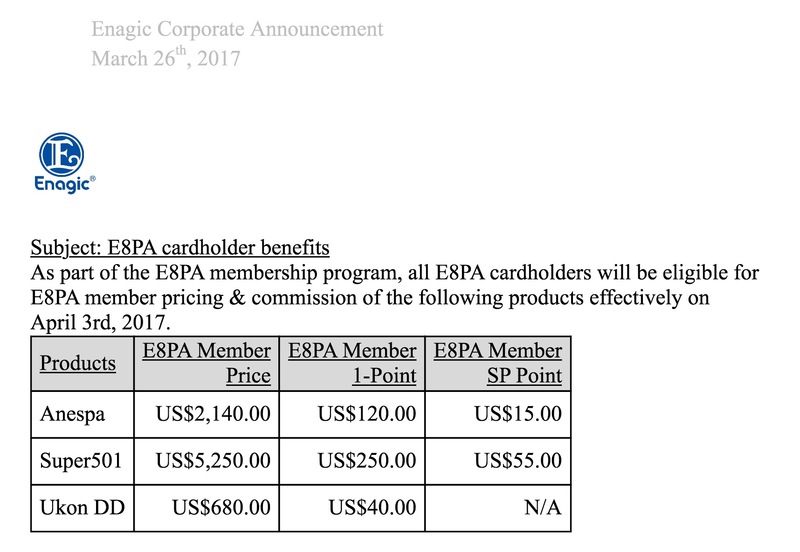 Member prices for other Enagic devices (Anespa, Super 501 and Ukon DD) have been discontinued. Enagic prides itself on offering the highest quality rendition of True Health globally. To that end, we are currently researching the most productive and effective means of revising our Kangen Ukon pricing. Our goal is to devise a constructive and comprehensible method to share these changes with you, our valued global network of distributors and customers. Recent announcements have preempted our final decision, resulting in unnecessary confusion. Rest assured Enagic aims at transparent communications and we are working arduously to bring that clarity to light. We appreciate your continued patience as we strive toward creating a continued, collaborative approach. May True Health be yours! The brand new Distributor Logo you have been hearing about is finally released! Download web and print asset packs HERE! 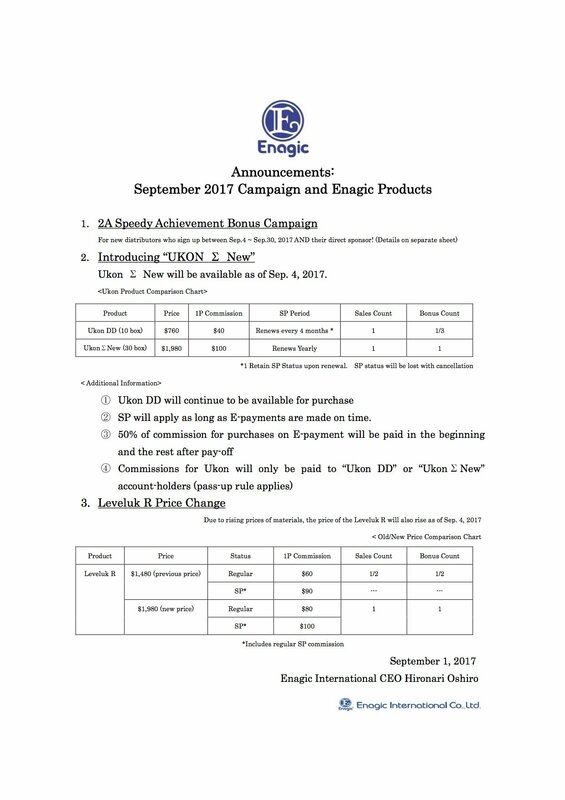 Take note, with this change, distributors are no longer permitted to use Enagic's logo in any of their marketing, all logos must be switched out to this new one! Our Policies and Procedures have been updated. Thank you for your cooperation! Please be aware that all of our US branches will be closed Monday, February 20th, 2017 in honor of President's Day. Visit the Enagic Osaka Factory! Visit the Enagic Factory to see how the Leveluk machines are built and meet the factory staff. 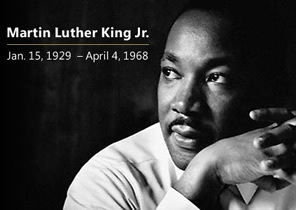 Enagic USA and its affiliated offices will be closed on Monday, January 16th for Martin Luther King Day. 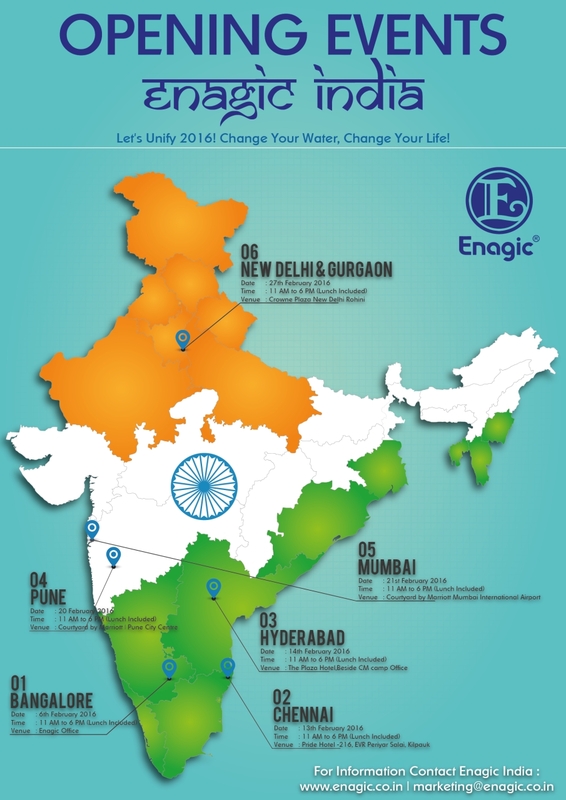 Enagic USA values the hard work and expansion of the Enagic brand by our network of independent distributors. 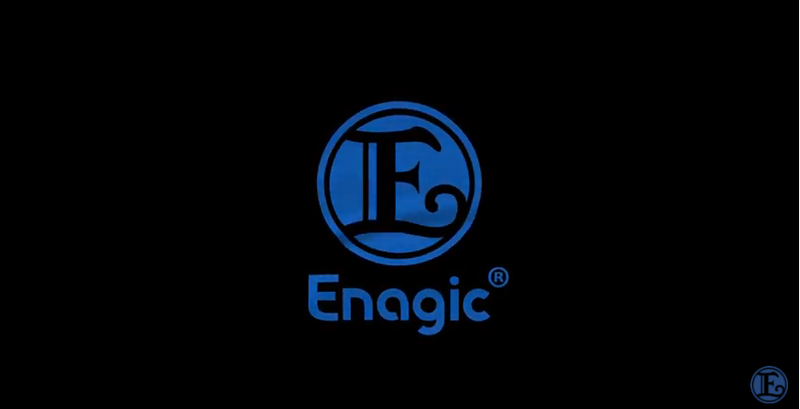 To that effect, we ask your understanding that any formal corporate announcements will ALWAYS come via direct reporting from our corporate website (www.enagic.com) and never from a particular employee. All announcements are universal in nature and are meant to be reported to the entire field. 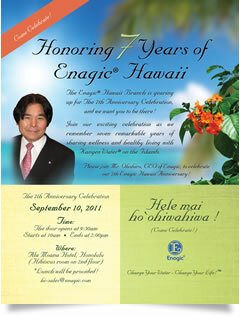 Enagic Hawaii will be renovating their office from January 30th through the entire month of February. We will be open for business during this period, but please be patient as our service may be slower than normal. Our main water station will be under renovation; however, we will have an available water station in the back of the office. If you would like to pick up water from our office for water trial, simply ask the staff and they will assist you. Due to our lack of multiple water stations, we will be limiting one gallon per person during this time. Apologies for any inconveniences this may cause. We kindly ask for your patience and cooperation during our renovation period. Happy New Year from Enagic! As we welcome in the advent of 2017, the Year of the Rooster, it's our opportunity to welcome YOU to the amazing and self-liberating year we're about to embark upon. In Asian mythology, the Rooster represents fidelity and punctuality, as it wakes people up on time and starts their day off well! 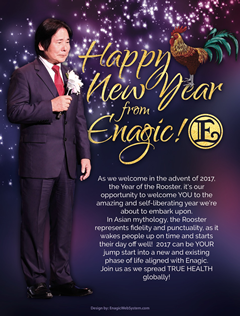 2017 can be YOUR jump start into a new and existing phase of life aligned with Enagic. Join us as we spread TRUE HEALTH globally! 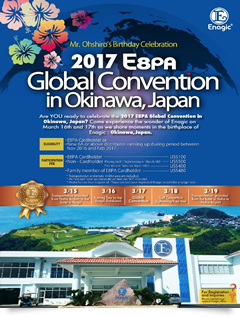 The 2017 E8PA Global Convention flyer is here! As always, thank you very much for your support in expanding the Enagic brand. We have a special announcement regarding the payment of Title Incentives for new 6A and above distributors between November 2016 and February 2017. 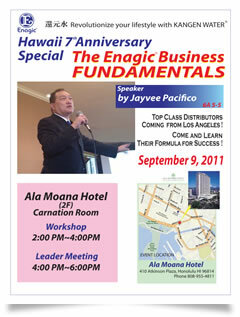 Title incentives for New 6A, 6A2, 6A2-2 distributors will be paid at regional Enagic branches on a regular schedule. 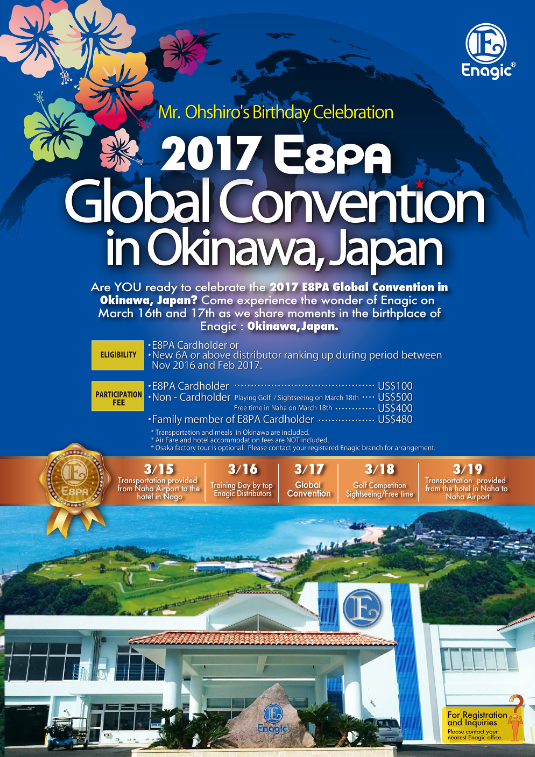 However, Title incentives for New 6A2-3's and above will be paid at the Global Convention in Okinawa, Japan on March 17. 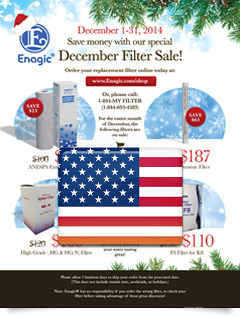 Enagic USA and its affiliated offices will be closed December 24th-26th and January 1st-January 2nd. 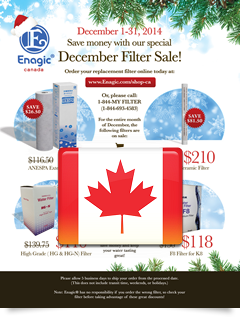 Enagic Canada and its affiliated offices will be closed December 24th-26th and January 1st-January 2nd. Enagic USA and its affiliated offices wish to thank YOU for all your support throughout the year and express our THANKS! We'll be closed Thursday-Sunday, November 24th-27th. Enagic USA follows a strict "no claims" policy as stated in our Policies and Procedures. As such, the act of "check flashing," to include posting envelopes or statements that insinuate or hint at potential financial earnings is strictly prohibited, regardless of rank or stature within Enagic. Any distributor found making such financial claims either through the overt or insinuated act of flashing checks will be warned and/or disciplined to include termination of their distributor status. Please help us adhere to the highest standards of ethical conduct. We will close all branches and departments in the U.S. and Canada on October, 10, 2016 (Monday) due to Columbus Day in the US and Thanksgiving Day in Canada. CHICAGO branch will be open 10:00a.m. - 2:00p.m. FLORIDA branch will be open 10:00a.m. - 2:00p.m. HAWAII branch will be open 10:00a.m. - 2:00p.m. LA Outbound will be open 10:00a.m. - 5:00p.m. LA Sales will be open 10:00a.m. - 6:00p.m. LA Service will be open as regularly scheduled. NEW YORK branch will be open 10:00a.m. - 2:00p.m. SEATTLE branch will be closed. TEXAS branch will be closed. VANCOUVER branch will be closed. TORONTO will be open 10:00a.m. - 4:00p.m. 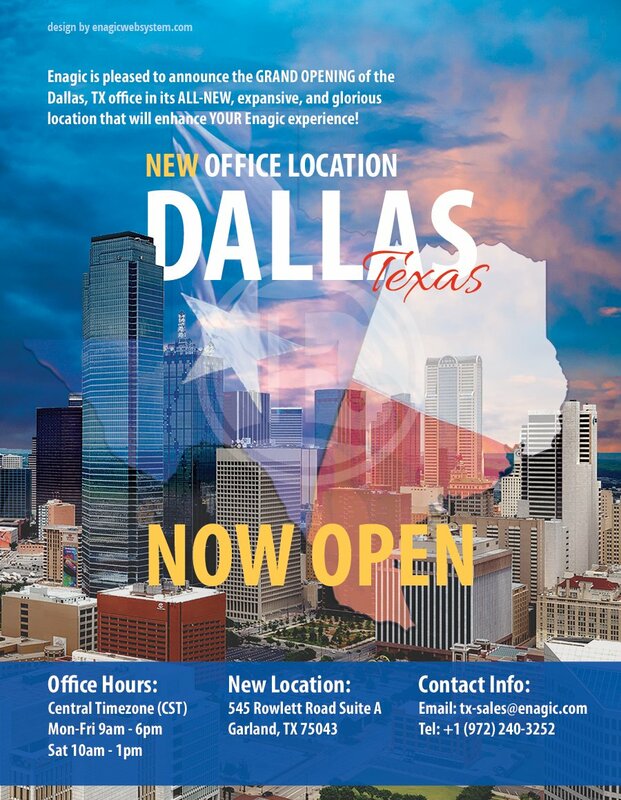 We're proud to announce to re-opening of our new Enagic Seattle office! 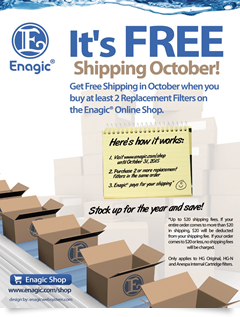 Get Free Shipping in October when you buy at least 2 Replacement Filters onthe Enagic® Online Shop. 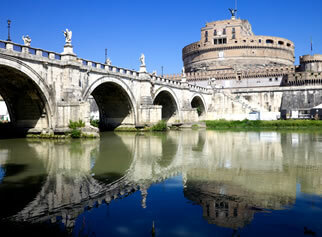 Where in the World is Enagic? Enagic is a true global company. Our growth knows no bounds and our borders are limitless. Our mission is simple: To spread true health to every person on planet Earth. 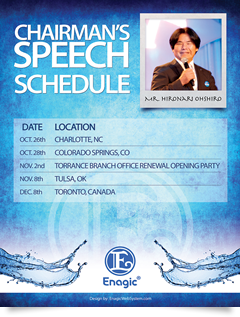 With the help of the Enagic distribution force, this remarkable company has expanded from one office in Japan to world-wide locations.And this is only the beginning! 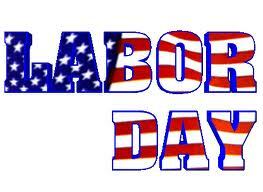 Enagic USA and its affiliates will be closed on Monday, September 5th for Labor day. Furthermore, all the USA offices will be closed Saturday, September 3rd, with the exception of our Torrance, CA office. 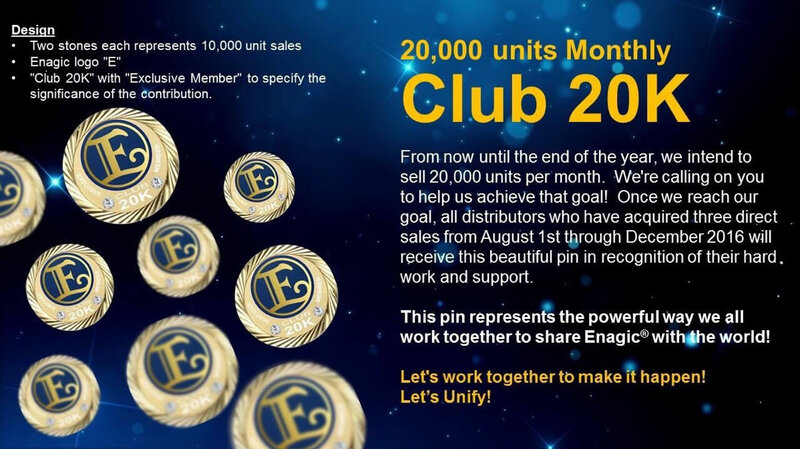 You will receive a Club 20K pin for each 3 machines sold between August and December, if Enagic reaches monthly sales of 20,000 units. 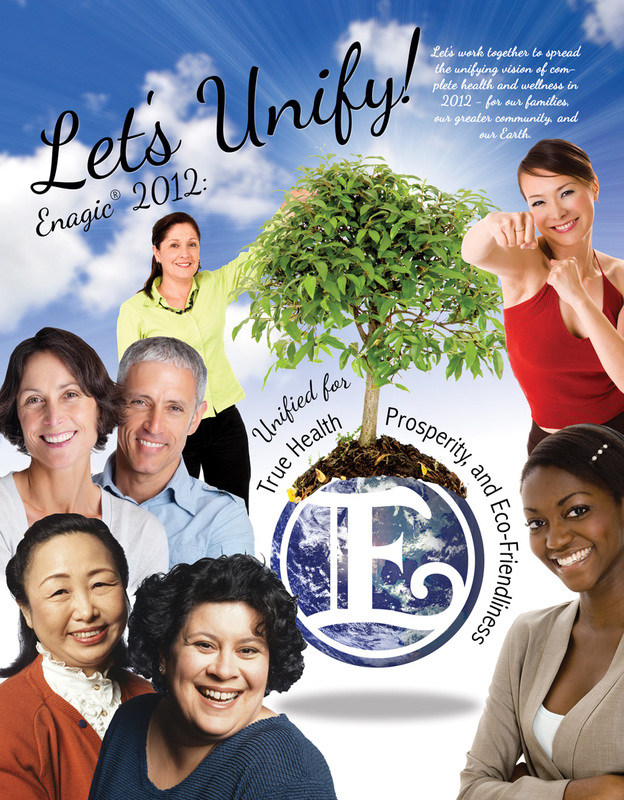 This pin represents the powerful way we all work together to share Enagic with the world! 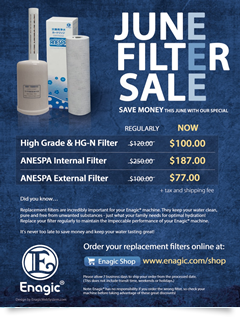 The semi-annual Enagic Filter sale is ON! May 30th (Monday): In observance of Memorial Day, all branches/departments in the US will be closed. May 28th (Saturday): The following branches/departments will be open for their distributors and customers. LA Sales Plaza will be open regular hours 10:00AM to 6:00PM. LA Service Dept. will be open as regularly scheduled for Saturday. 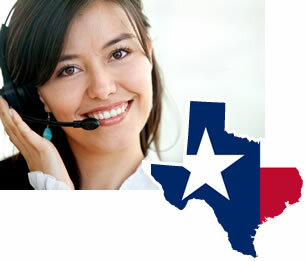 LA Outbound/Call Center will be open 10:00AM to 5:00PM. NY Branch will be open 10:00AM to 2:00PM. Chicago Branch will be open 10:00AM to 2:00PM. Florida Branch will be open 10:00AM to 2:00PM. Hawaii Branch will be open 10:00AM to 2:00PM. Thank you very much for your continued support of the Enagic mission, using our products, and sharing Kangen water & its business with others to realize true health. It was brought to our attention that there are distributors making income claims as recruitment practice. We also have confirmed that such claims imply achieving certain rank and promises of earning a lifetime income. 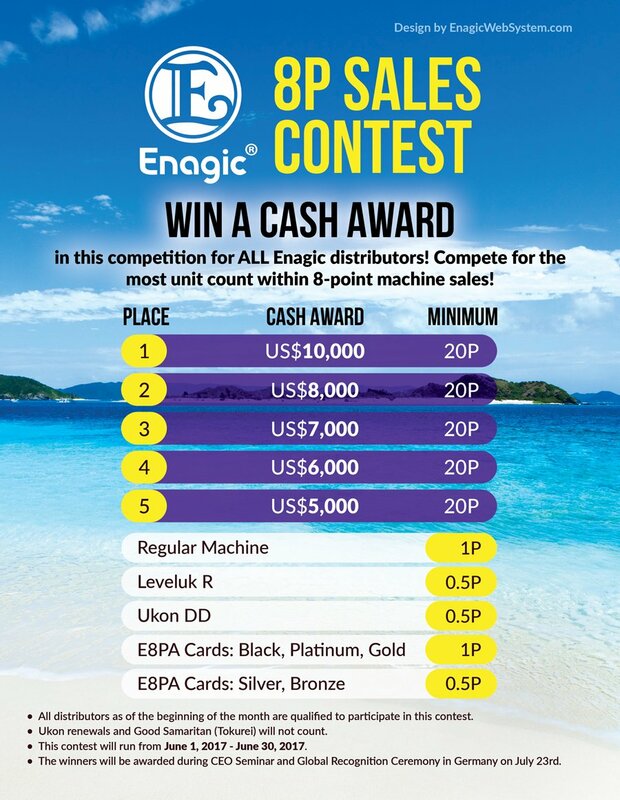 As you may already know, Enagic employs the 8-Point commission structure and, moreover, pay certain ranking distributors Monthly Incentive (Shoreikin) and Quarterly Incentive (Shoreikin). However, since the Incentives (Shoreikin) are at the absolute discretion of the company and they are subject to change at any time, Enagic does not guarantee any kind of income for life. Enagic is very concerned about the situation as income claims are prohibited not only by Enagic's P&P (Policies & Procedures) but also by industry standards. To propel proper recruitment and sales activity, please report to us promptly if you hear or see any income claims or health claims (ex. websites, video sites, SNS, presentations, or other formats). Furthermore, Enagic Headquarters requests you to remove such claims if they are used in your presentations, sales tools, or any other medium. If we do not see any improvement, termination of distributorship would be considered. 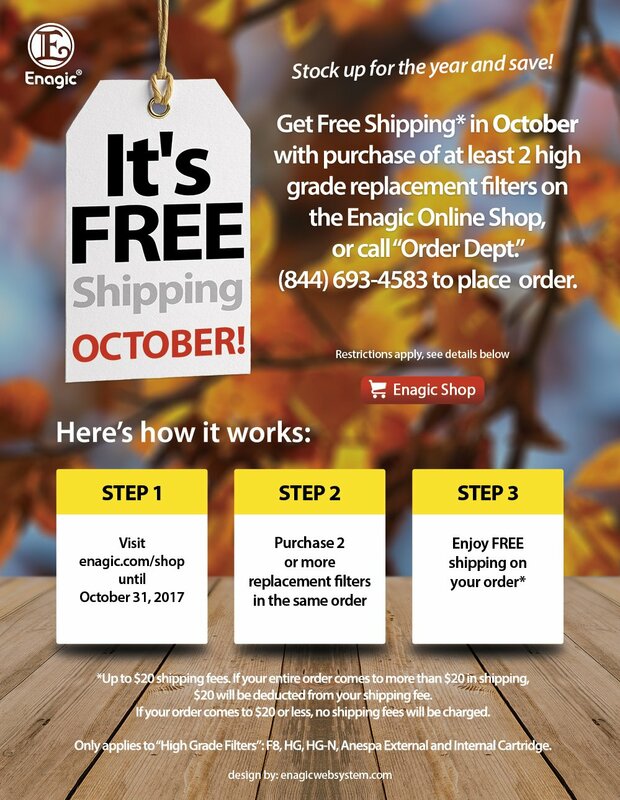 If you know of people that search online to purchase Enagic products and think they've found a "great deal," they are in for a surprise! Enagic markets our products ONLY through our network of dedicated and recognized Enagic distributors. 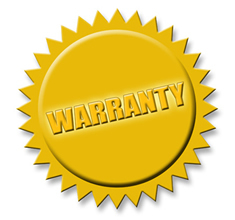 What's more, warranties are non-transferable. Therefore, any sale and purchase on the secondary market would void the warranty. Stay smart, stay safe and stay protected! Enagic would like to announce a change to the hours of operation for the LA Plaza. Get Free Shipping in April when you buy at least 2 Replacement Filters onthe Enagic® Online Shop. Join us at the 2016 Enagic Global Convention in Las Vegas! 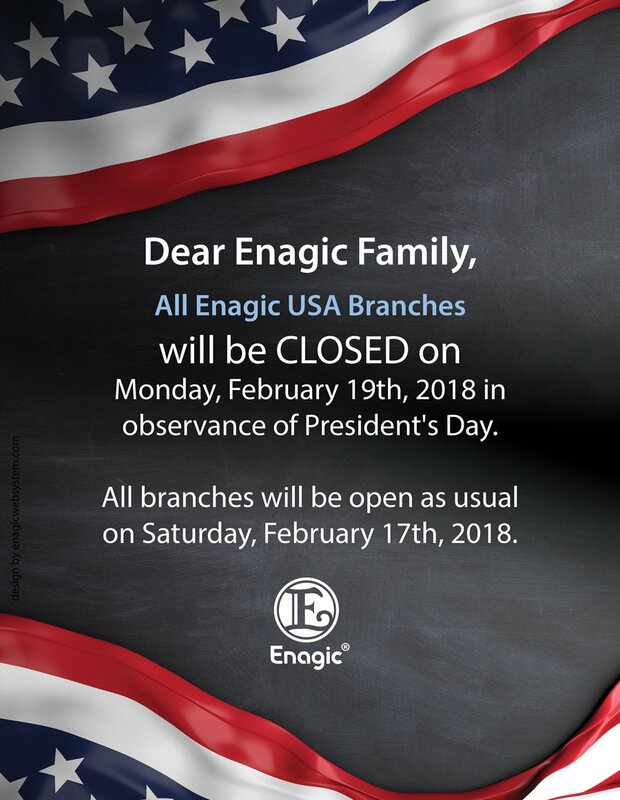 Enagic USA and its affiliated offices will be closed Monday, February 15th in honor of Presidents' Day. February 13 (Saturday): The following branches/departments will be open for their distributors and customers. LA Sales Plaza will be open from 10:00AM to 6:00PM. LA Service Department will be open as regularly scheduled for Saturday. LA Outbound (Filter) Call Center will be open from 10:00AM to 5:00PM. New York Branch will be open from 10:00AM to 3:00PM. Chicago Branch will be open from 10:00AM to 2:00PM. Florida Branch will be open from 10:00AM to 3:00PM. Texas Branch will be open from 10:00AM to 2:00PM. Hawaii Branch will be open from 11:00AM to 3:00PM. Seattle Branch (WA) will be closed. 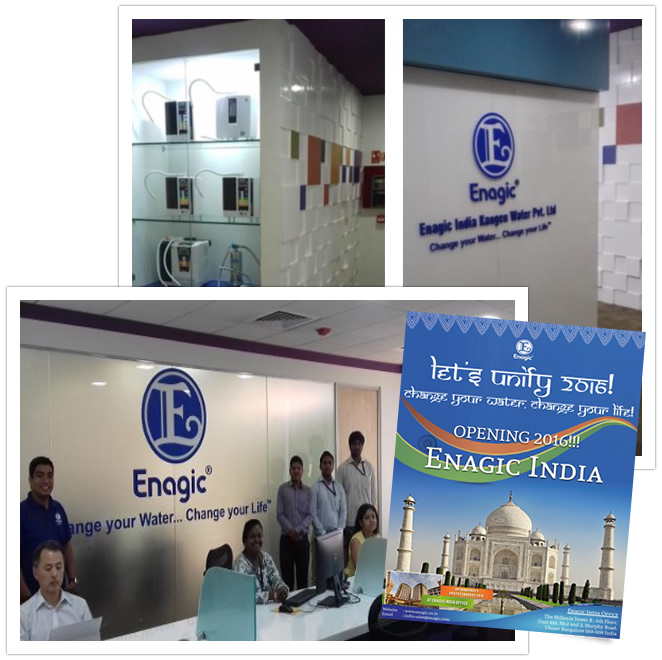 We are proud to announce the Grand Opening of Enagic® India! Effective 1 March 2016, LeveLuk R sales will count as 0.5 units in regards to Title Incentives, 6A qualification and bonuses. *Sales made up to the month of February will count as one unit. 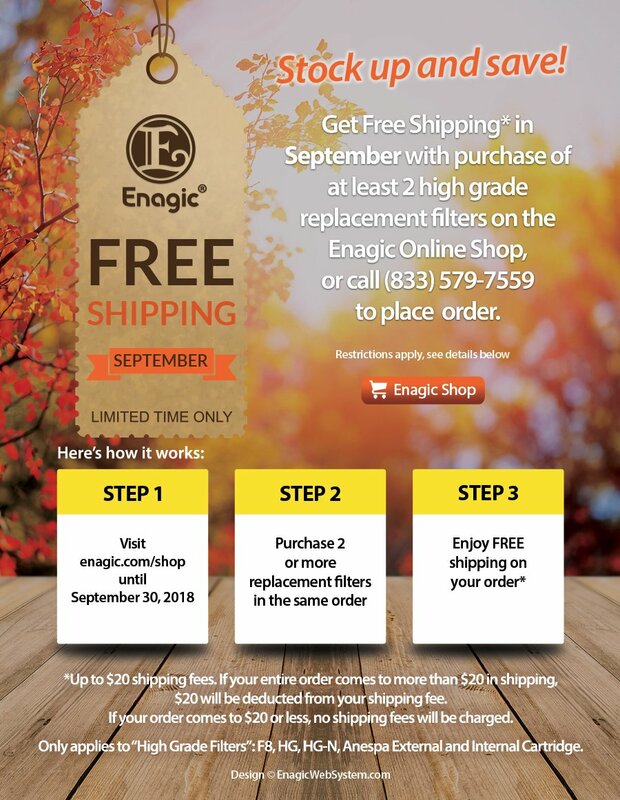 ENAGIC Global delivers yet AGAIN! Are YOU up for the challenge? Our newest monthly success contest might be YOUR chance to totally change your financial health! Please see flyer for additional info! January 18 (Monday): All US offices US will be closed. January 16 (Saturday): The following branches/departments will be open for their distributors and customers, accordingly. Hawaii Branch will be open from 10:00AM to 2:00PM. And, Texas Branch and Seattle Branch (WA) will be closed. Enagic USA and its affiliated offices will be closed on December 24th and 25th in honor of the Christmas holiday. LA (Torrance) office will be open as per regular Saturday operations. Hawaii Branch will be open from 12:00PM to 4:00PM. New York, Florida, Texas, and Seattle Branches will be closed. We wish you, your families and your friends the happiest of holiday moments! 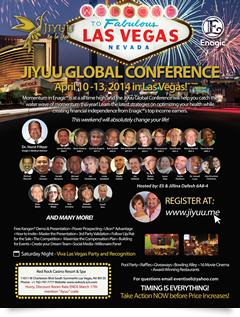 Join us next year at the 2016 Enagic Global Convention in Las Vegas! Enagic USA and its satellite offices will be CLOSED Monday, October 12 in honor of Columbus Day. 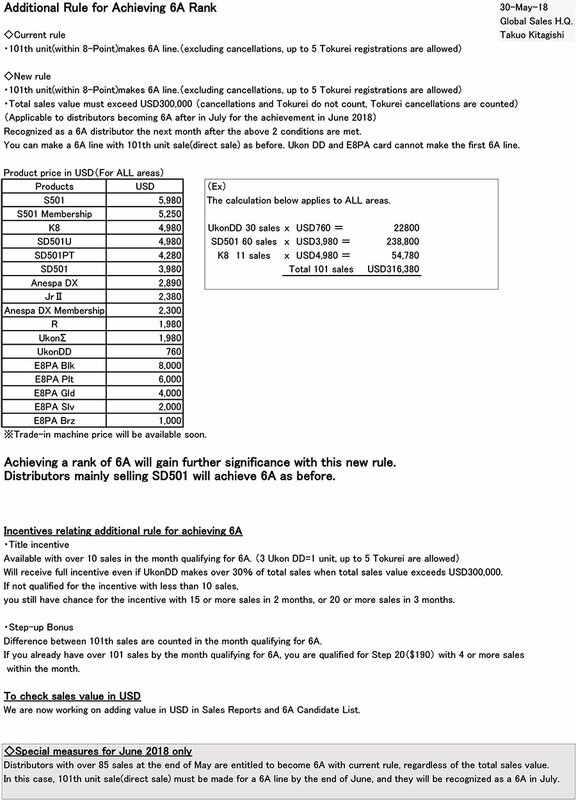 Effective 1 October 2015, Enagic has changed the 6A and above Incentive plan. New 6A's have one month to generate 10 sales in their qualification month to receive the 6A bonus. Furthermore, in the second month of qualification, they must generate 15 sales. In the third qualification month, they must generate 20 sales. If a new 6A takes two or three months under the above qualification to rank as a 6A and receive the 6A Title Incentive, the upline 6A2 and higher shall NOT receive the upline Title Incentive. Only in the case where a new 6A generates 10 or more sales in their first qualification month will upline 6A2 and above distributors receive their respective Title Incentive(s). 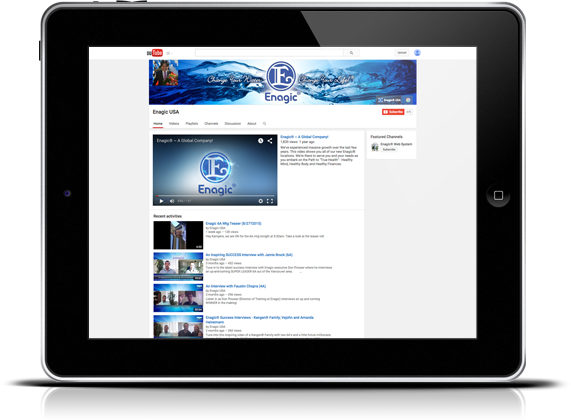 Did you know Enagic has a YouTube Channel all for YOU? 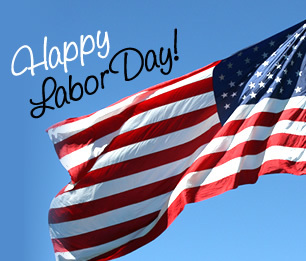 Enagic USA and its satellite offices will be CLOSED next Monday, September 7th in honor of LABOR DAY. Our Torrance will be OPEN this Saturday, the 5th. Have a SAFE and HEALTHY Labor Day weekend! 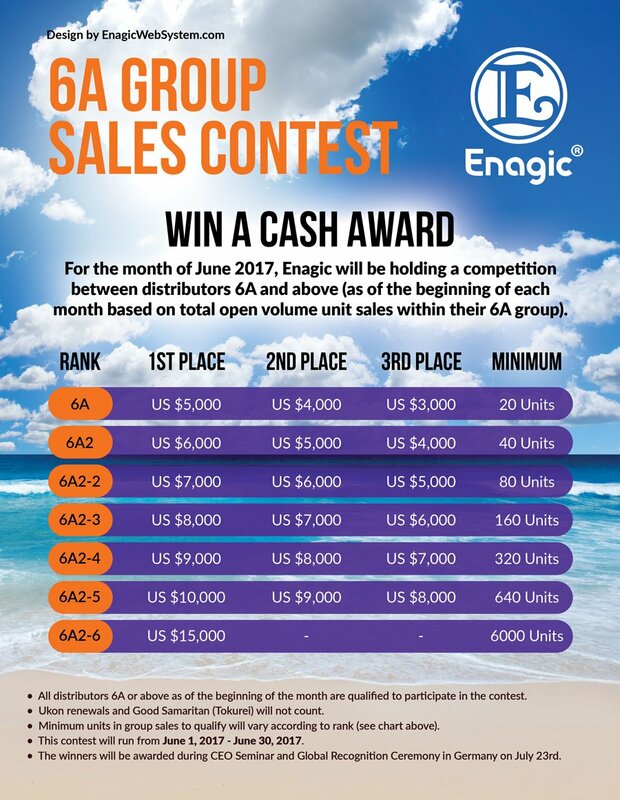 The summer months are bringing continued success to Enagic and its team partners across the globe. We're happy YOU'RE part of that success! As you can imagine, as the name Kangen Water® and Enagic® grow globally, there is the opportunity for miscommunication with regards to the spread of our mission. 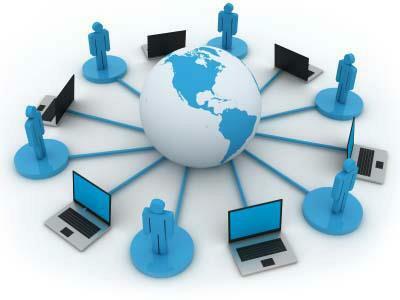 We have a very powerful product and that product is centered firmly on the PEOPLE of our network. We offer the world TRUE HEALTH by way of True Bodily Constitution, True Financial Fitness and True Serenity. Our independent distributors are tasked with ethically explaining the mission of the firm, one person to one person. 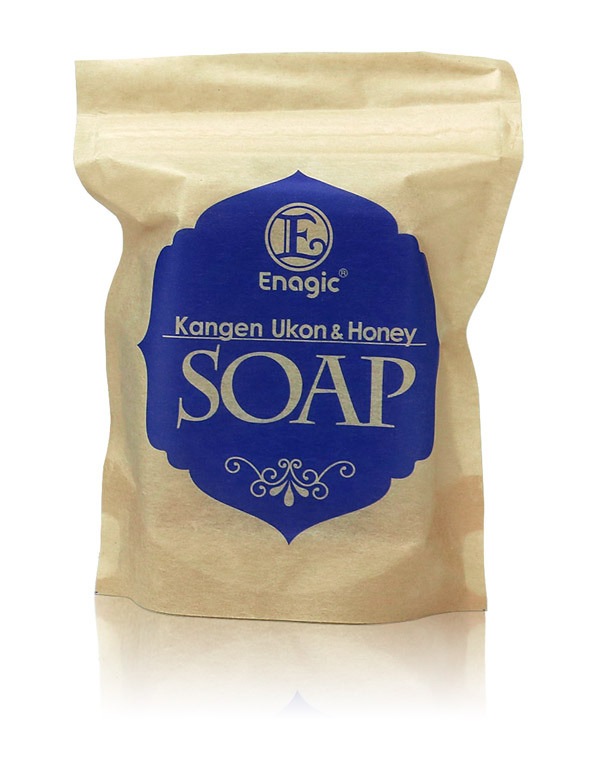 At times, they may misquote how Enagic® goes to market. At these times, we feel it necessary to publish messages such as this in order to alert our independent distributor base about certain situations that can and should be corrected. In particular, it has come to our attention that certain independent distributors may be utilizing "robocalls" which also make use of alleged endorsements by public figures and/or entities. We do not condone the use of "robocalls" nor the use of anyone's name or likeness without their express written permission. At this time, we do not have any public endorsement deals in place with any sports teams, noted public figures, or other entities. Our belief is in fostering a true understanding and appreciation for our product which requires a deep relationship with the ultimate consumer. We want our consumers to live the Kangen® life through their own research into our product benefits rather than the through the sway of endorsements. Our base market is composed of the people in YOUR communities. As such, there is no extra requirement for Kangen Water® or the True Mission of Enagic to be endorsed by anyone other than YOU. YOU are our biggest marketing ally and YOUR endorsement is the only one that counts. As always, may True Health be YOURS! 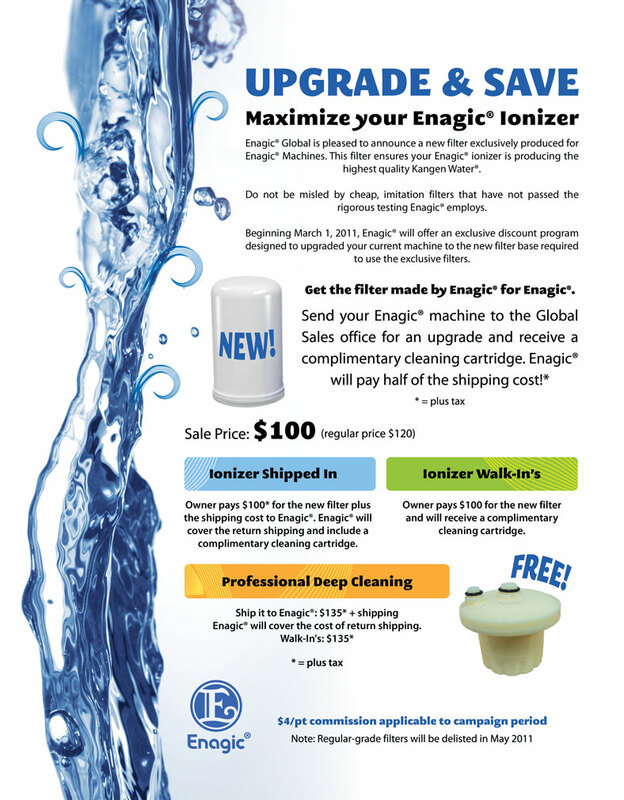 Attention Enagic Distributors! New FA0 ruling. FA0 distributors are those distributors without direct sales for over two (2) years and earning zero commissions. To approach and encourage those distributors who have not been active in their sales activities for over 2 years and to give them a chance to become active again so that the company can reach the global total sales goal of 20,000 units per month. What is the FA0 Program? 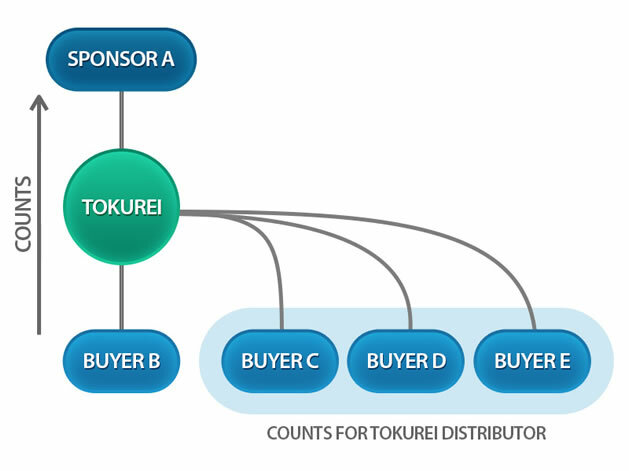 It is a system which will allow distributors who have not made a "direct sale" for over two (2) years to re-activate their business activities under a different group by purchasing a "Machine" or "Ukon". FA transferring within your own group is NOT allowed. Upon moving to a different group (under a new sponsor), you may keep your previous rank with the number of sales you currently have to start your business, however you cannot bring people in your previous group with you. TOKUREI (Good Samaritan) cannot be transferred unless they CANCEL their TOKUREI (Good Samaritan) status, which means paying off their account. After transferred, you can "Rank-Up" and will be eligible for "6A Title Incentive"(*) if you meet following the requirements. (*) See Additional Information for details. However, it will NOT affect the Up Line distributors for their Rank Up or Qualification for any incentives. "Name Change" is NOT allowed after FA transferred. 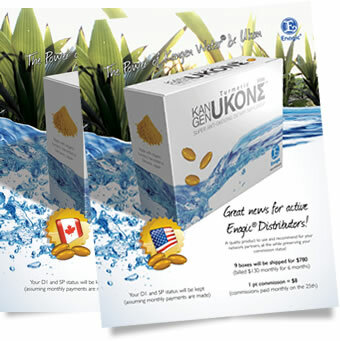 No "Starter Kit" is allowed, but by purchasing UKON DD or a Kangen Water® machine, you may re-activate. Even if your rank was above 6A before becoming FA, you need to be qualified to become 6A again. You need to have at least 30 sales in 6 months (within 8 points) after you transferred to be qualified for 6A again. (This may qualify you to become 6A but it does NOT qualify you for a "6A Title Incentive" unless you create two (2) 6As in two, separate legs, then you will become 6A2 and will be eligible to receive "Title Incentive" upon meeting the requirement. If you were below 5A or transferred with under 70 units, you will be eligible to become 6A and to receive 6A Title Incentive under the current requirements. If you were over 70 units, you still need to have at least 30 sales in 6 months (within 8 points) to be qualified as a 6A and for "6A Title Incentive". For all of the above conditions, it will NOT affect the "Rank UP" for the Uplines. Our US branch offices will be closed FRIDAY & SATURDAY (July 3rd and 4th) with the exception of our Torrance, CA office which will be open Friday, July 3rd, but CLOSED Saturday, July 4th. 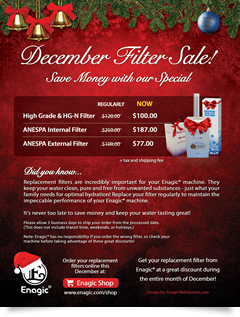 Applies to F8 High Grade, HG Original, HG-N, Anespa External and Anespa Ceramic Replacement filters. 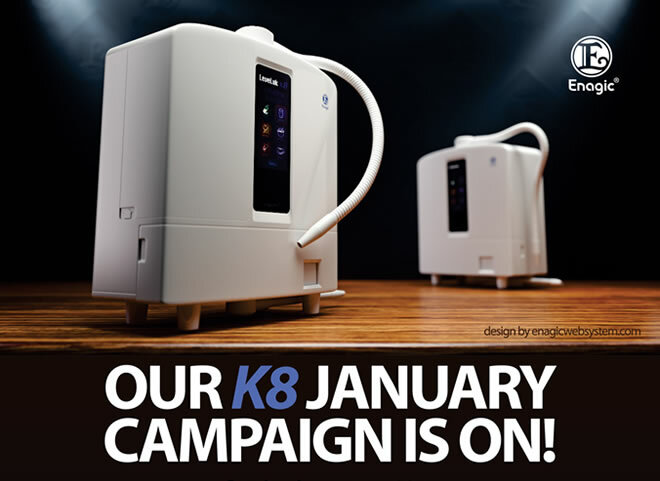 Get Ready for the K8 January Campaign! The first 300 K8 units sold in 2015 will receive 2 special gifts with the machine purchase. 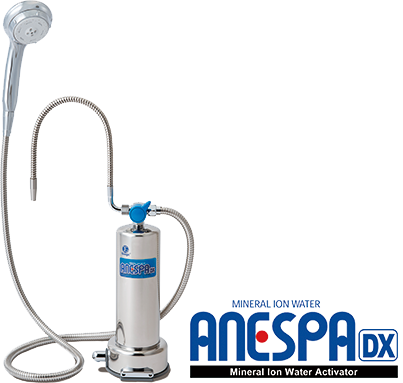 Enagic® will send 1 Kangen Water® Kor Bottle and 1 Beauty Water Spray Bottle to the first 300 K8 customers of the year. 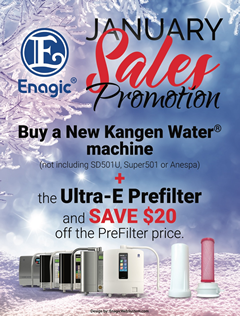 Make sure your prospects know that the New Year is the BEST time to buy the Mighty Kangen® 8! Our DXII model will be discontinued once all stock has run out at our various branches. Therefore, prior to submitting any orders for DXII machines, please check with your local sales office for inventory. Not sure where to find your local branch? Check Here. 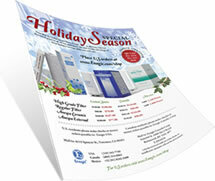 The Enagic® Web System Holiday Sale is going on now! 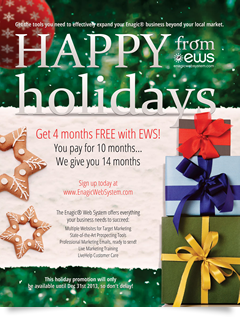 EWS is offering 4 months of services completely free when you prepay for your 2015 membership. You'll get all the websites, prospecting tools, and online marketing training you need - and save up to $300! Act now - offer expires December 31. 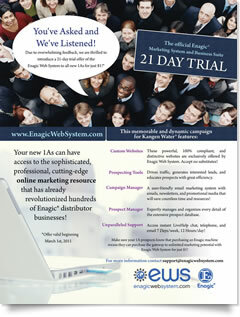 For new members, visit enagicwebsystem.com to sign up. Month-to-month members can upgrade and save by paying ahead for their 2015 membership in their Backoffice account. Current annual members can simply renew their plan by clicking here. 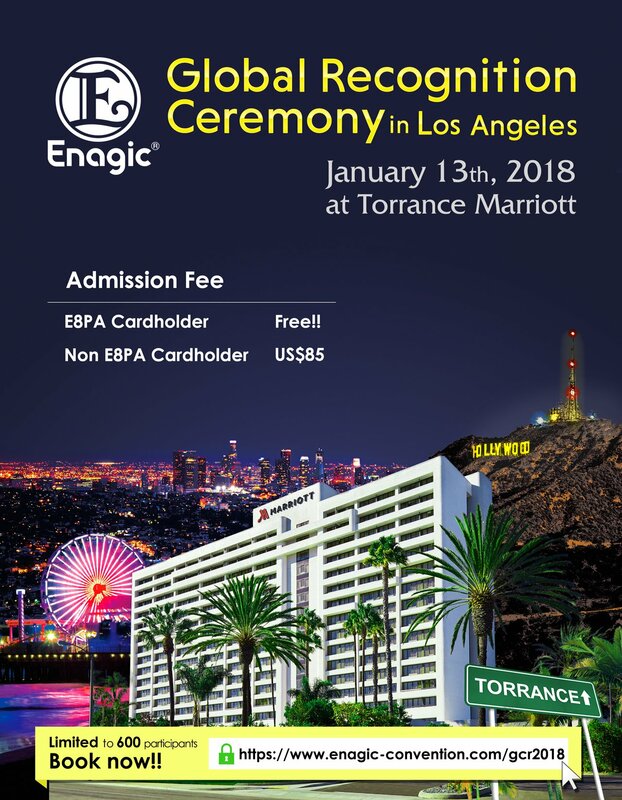 Come experience the ENERGY and EXCITEMENT of Enagic in beautiful southern California! Fantastic news for those close to our NY office; extended hours of operation! The next-day, fast-pay system announced last August will be terminated at the end of September 2014. 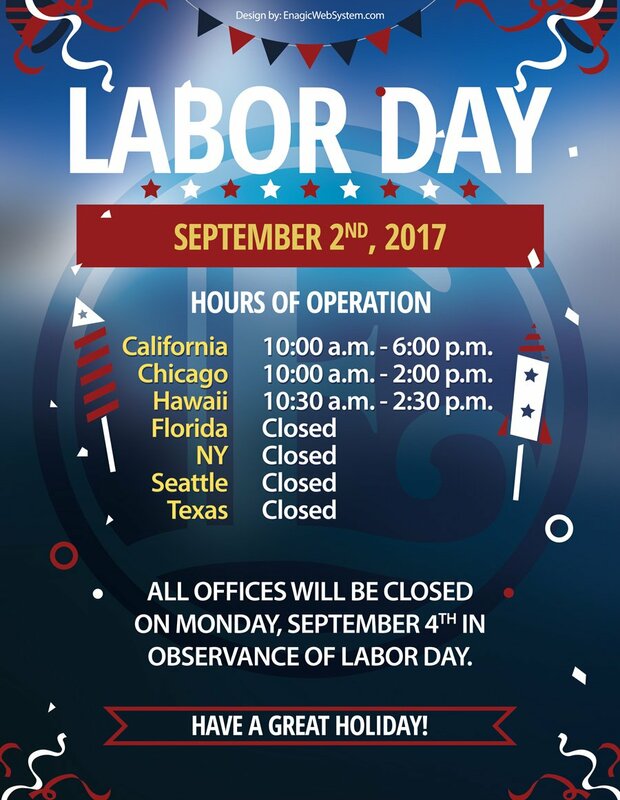 Enagic USA and its affiliate offices will be closed Monday, September 1st in honor of Labor Day (our Torrance, CA office WILL be open the previous Saturday & Sunday). We appreciate all YOUR labor on behalf of the Enagic success story! 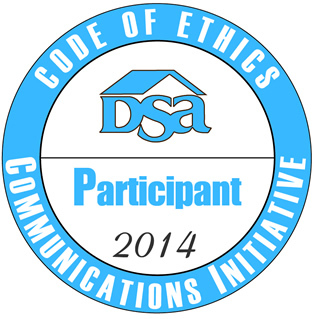 Did you know that Enagic USA is a participant in the DIRECT SELLING ASSOCIATIONS (DSA) Code of Ethics? We sure are! It's an opportunity for YOUR company to display the commitment to high ethics within our industry and to support fostering advances ethics in our interactions. The "8 Level 1 Cell Monthly Bonus Program" has been renamed as "8 Level 1 Cell Daily Bonus Program" and will be paid to distributors on a daily basis. For cell bonus equal to US$100 or above, a US$20 handling fee deduction applies. For cell bonus below US$100, a US$10 handling fee deduction applies. We ask for your patience as we update the contents on this page. Thank you very much. 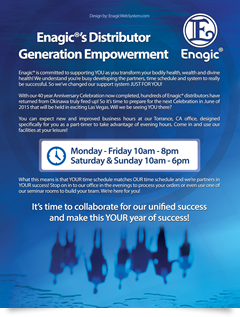 Enagic is committed to supporting YOU as you transform your bodily health, wealth and divine health! We understand you're busy developing the partners, time schedule and system to really be successful. So we've changed our support system JUST FOR YOU! 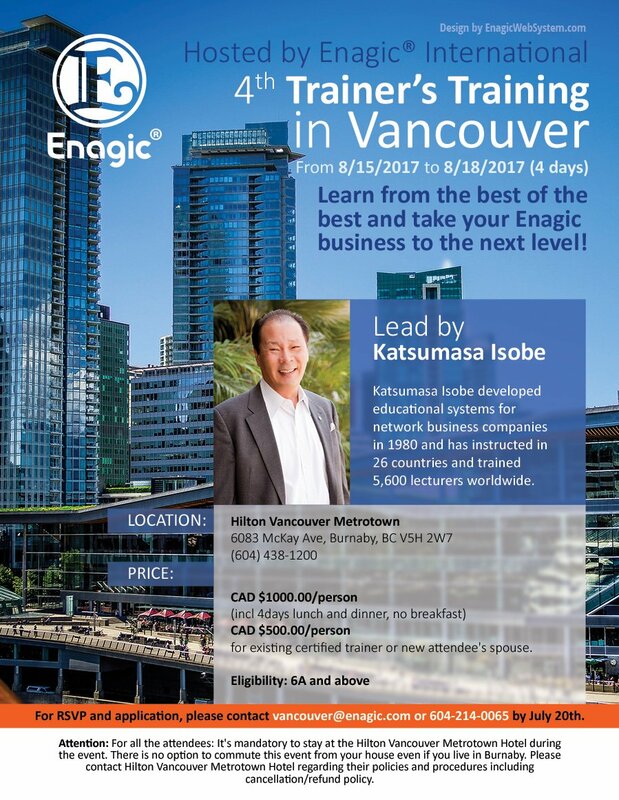 Join Don Prosser (Professional Education), Steve Trapp (Enagic® Osaka factory expert) and Go Hamagawa (Enagic® Sales) for a special 1 Day Seminar. 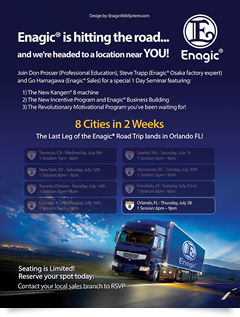 The Last Leg of the Enagic® Road Trip lands in Orlando FL! Announcing the Chairman's Seminar - New York and Los Angeles! Have you heard? 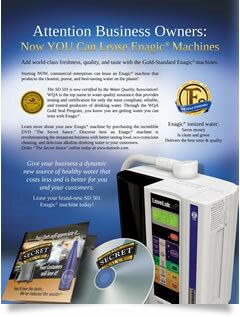 Enagic® has just released their most powerful antioxidant Kangen Water® machine to date. The new Kangen® 8 features 8 robust electrode plates - which means improved ionization, increased antioxidant production potential, and greater surface area. 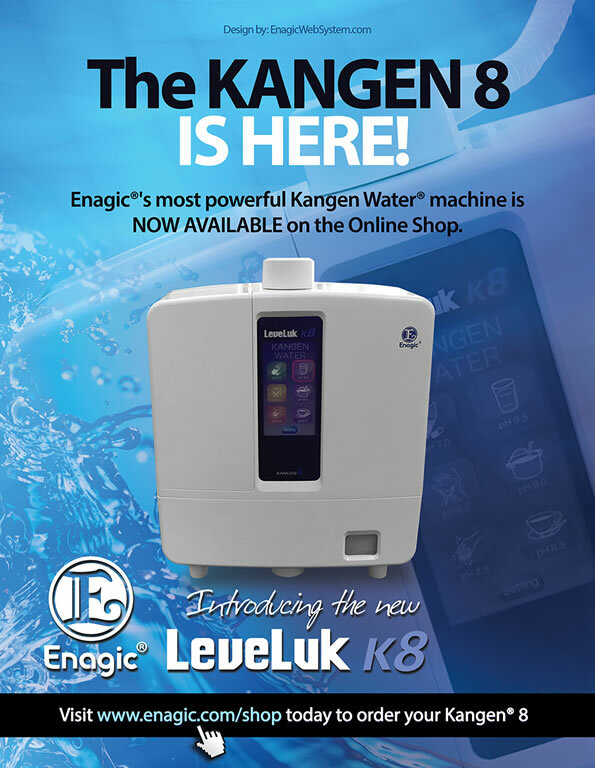 And we didn't stop there... head on over to the online shop to learn all about the new versatile and user-friendly features of the Kangen® 8. Have you heard the announcement about the ADDITIONAL 8-Level 1-Cell Bonus program announced last week? If not, have a look here and zap any questions to your local sales manager. It's on through the end of 2014 so there's no time to waste! *Please note that $10 (USD) for bonuses above $100 (each machine) or $5 (USD) for bonuses below $100 (each machine) will be deducted for handling. 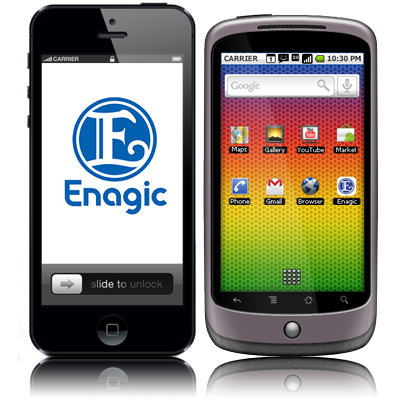 The new ENAGIC mobile phone app is YOURS! Our Düsseldorf, Germany office will be closed Thursday, June 7th in honor of Corpus Christi. Our Australia office will be closed Monday, June 11th in honor of the Queen's Birthday. 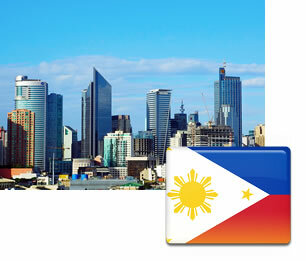 Our Philippines office will be closed Tuesday, June 12th in honor of Independence Day *(Araw ng Kalayaan). 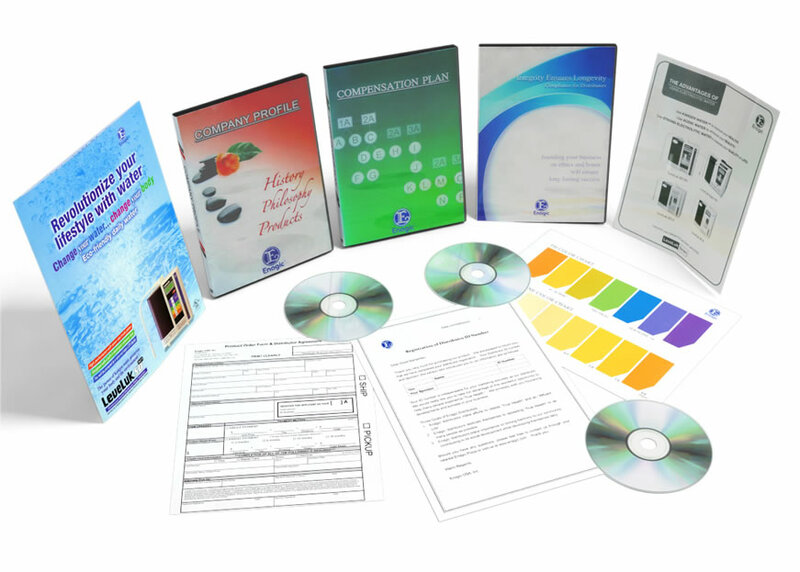 Experience Enagic® Excellence Video - Brilliant Customer Follow-Up! Turn your happy Kangen® Customers into team members with the brand new Experience Enagic® Excellence Video! This exciting Youtube video informs, educates, and entertains as customers learn about the Kangen® Water Business Opportunity. Don't miss your opportunity to recruit more team members - share this follow-up youtube video every time! The 1x1 Campaign Graphical Movie shows you how to make it happen! 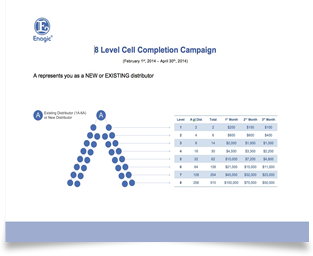 You've probably already heard about Enagic®'s new 1x1 Campaign - where you and everyone in your downline add 1 new team member every month in an 8-month sprint to 6A. Now we are unveiling a helpful Graphical Movie to explain the details of the Campaign, step by step and month by month. Check out the movie for yourself, and share it with your team! Mr. Ohshiro donates financial support to the Okinawa-shogaku High School and Misato Industrial High School, which will join the National High School Baseball Championship as representatives from Okinawa. 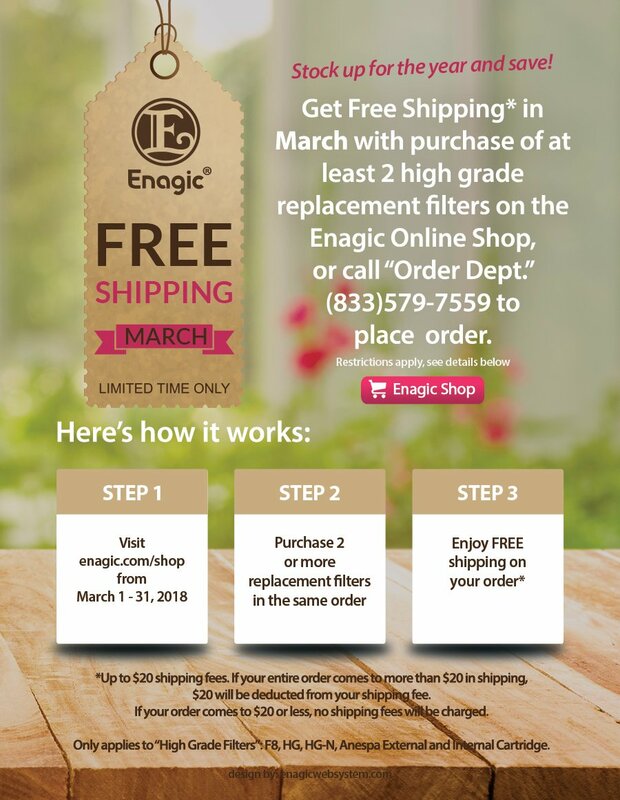 Enagic's One Week One Cell Completion Campaign is live (February 1st, 2014 - April 30th, 2014) and it's YOUR chance! Just like our bodies are composed of cells, your Enagic team can best be built using our unique, One Week One Cell building philosophy. Getting your new partners motivated QUICKLY is the key. Make sure they jump on board powerfully! 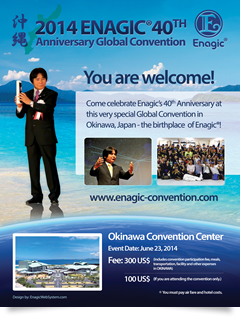 The 2014 Enagic 40th Anniversary Global Convention will be held in beautiful Okinawa, Japan this year! Come experience the wonder and success that is Enagic. Our global convention homepage is now open and available here. 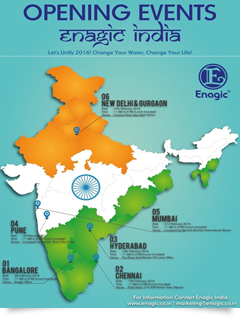 Enagic is expanding GLOBALLY!! Come celebrate with us in Indonesia! 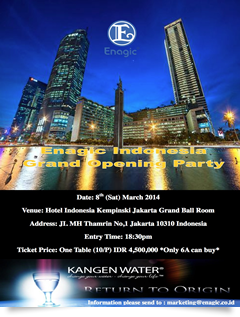 Join us on Saturday, March 8th at the luxurious Hotel Indonesia Kempinksi to celebrate the Grand Opening of the NEW Jakarta, Indonesia Enagic® Office. This will be a beautiful night to remember! Available to 6A's and above. Enagic USA and its affiliated offices will be closed Monday, January 20 in honor of Martin Luther King Jr's day. Enagic USA and its affiliated offices will be closed New Year's Eve (Tuesday, December 31st) and New Year's Day (Wednesday, January 1st). Our offices will reopen Thursday, January 2nd. 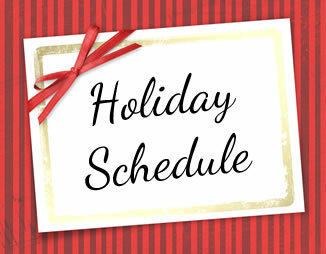 Enagic USA and its satellite offices will be closed Tuesday and Wednesday, December 24 & 25th in honor of Christmas. We wish you and your family the peace of the holidays. Our offices will reopen Thursday, December 26th. Did you know? 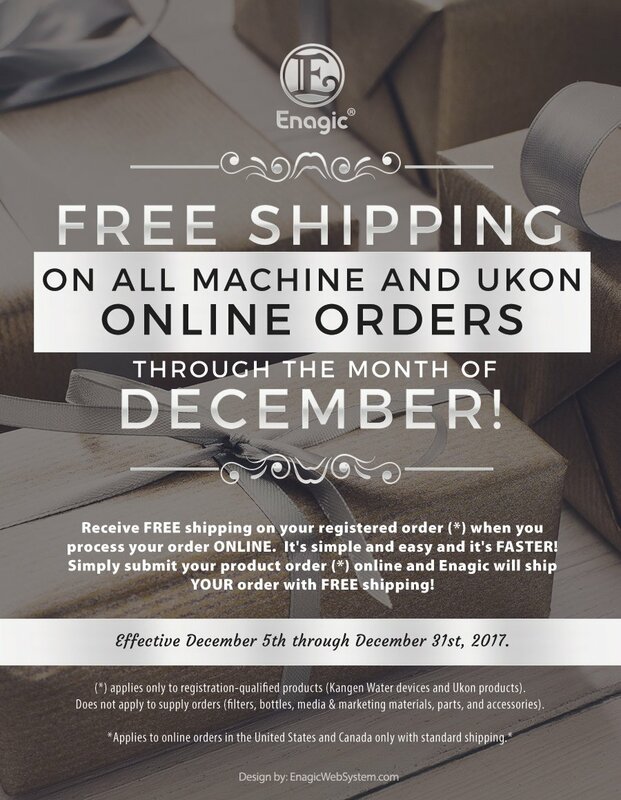 All through the month of December 2013, any NEW Kangen Ukon orders will receive FREE SHIPPING! Get the word out! 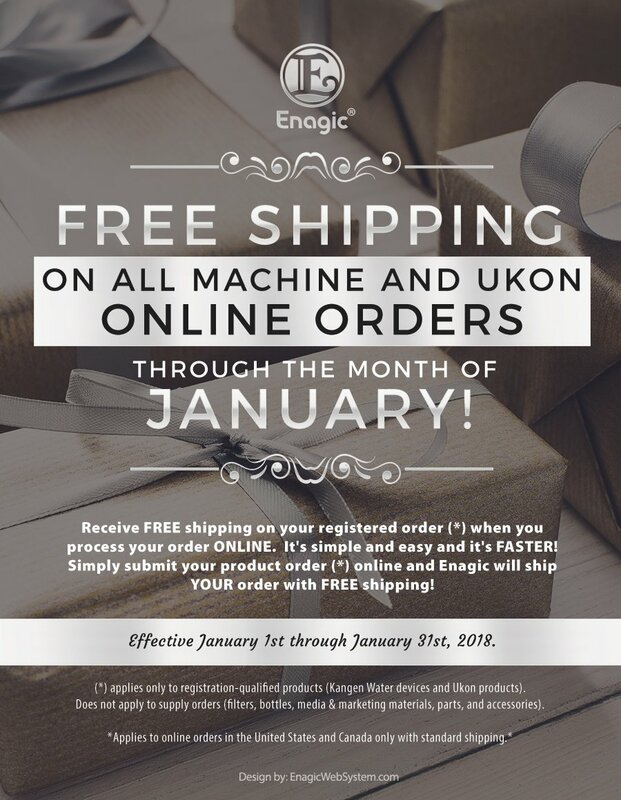 Effective 1 January 2014, Enagic's flat-rate shipping rates will increase +$5 for machine orders and +$3 for all Kangen Ukon orders. Take advantage of the promotion today! 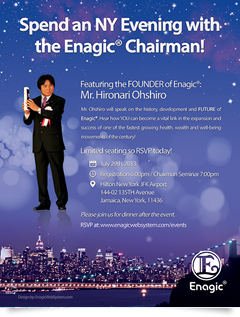 Enagic USA is extremely pleased and excited to announce the ascension of Mr. Katsumasa Isobe as President and CEO of Enagic USA. Mr. Isobe hails from a long and fulfilling career within the network marketing arena, having taken many firms from good to amazing. He is a man that can take Enagic to that next level... and beyond. 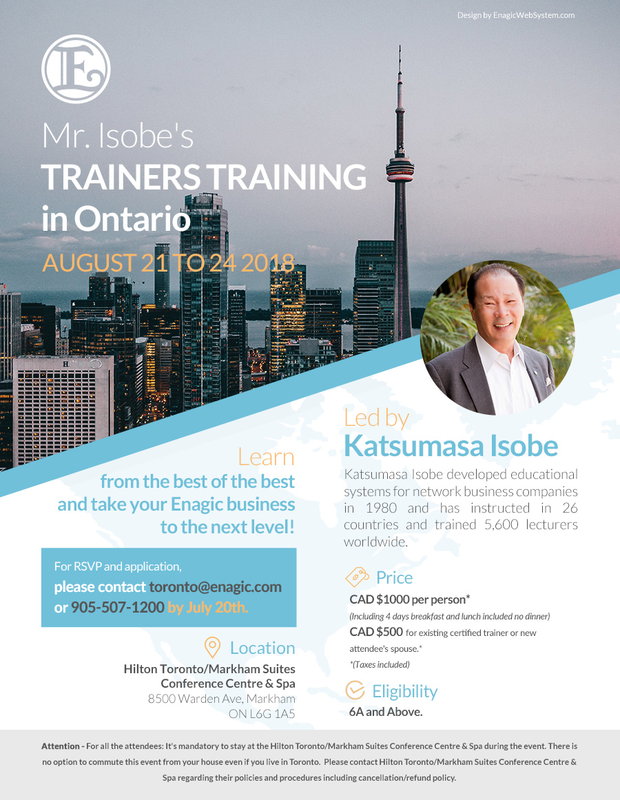 Look forward in the coming weeks and months to direct input from Isobe-san on precisely how he intends to propel Enagic into the destiny that awaits. 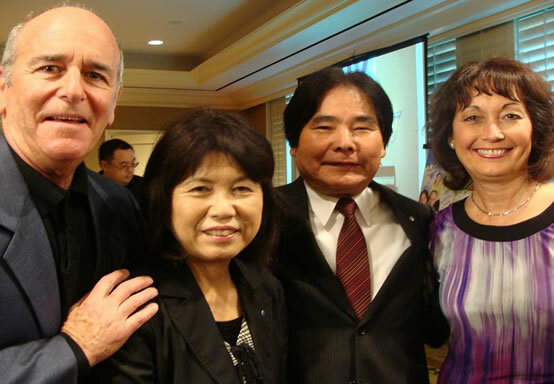 We hope you'll join the entire staff of Enagic USA in warmly welcoming Isobe-san into the Enagic fold. 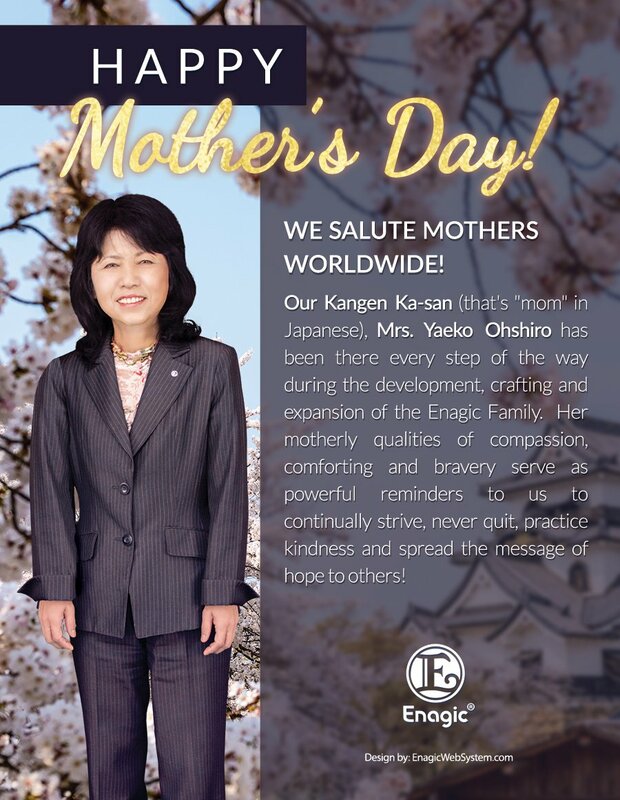 Let's create the perfect environment for Isobe-san to interact with you on the best level possible, integrate your ideas and prowess and raise high the successful flag of ENAGIC globally. Please be aware that our US offices will be closed, Saturday, October 12th through Monday, October 14th in honor of Columbus Day. Please be aware that our Enagic Hong Kong office will be closed on September 20th and 21st in honor of the Mid-Autumn Festival. Here's YOUR chance to START OFF RIGHT with the Enagic life-changing mission! Take advantage of Enagic's "ONE WEEK ONE CELL" plan. Don't get passed up.... SIGN UP! Make sure you're receiving 100% of your indirect Ukon™ commission! 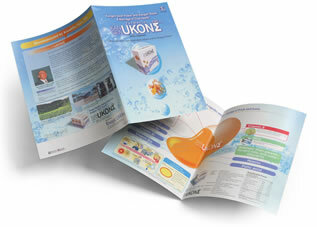 Effective September 1, 2013, Ukon™ DD will be a pass-up item. That means you need to be enrolled in the Ukon™ DD program in order to receive commission from sales made in your downline. If you aren't in the Ukon™ DD program, the regular tri-annual income will pass you up. So get signed up today! 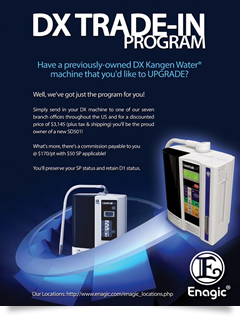 In regards to deep-cleaning or repairs to Enagic Kangen Water® machines, as of 8/12/2013, if you are not the registered owner of your machine extra charges will apply for deep cleaning and repairs. The warranty is not covered if you purchased your machine from a third party. 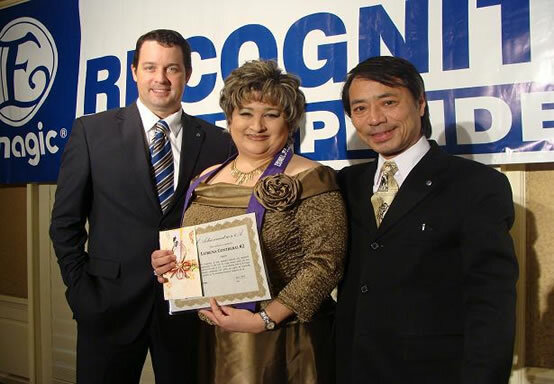 YOU'RE the most important person in Enagic! 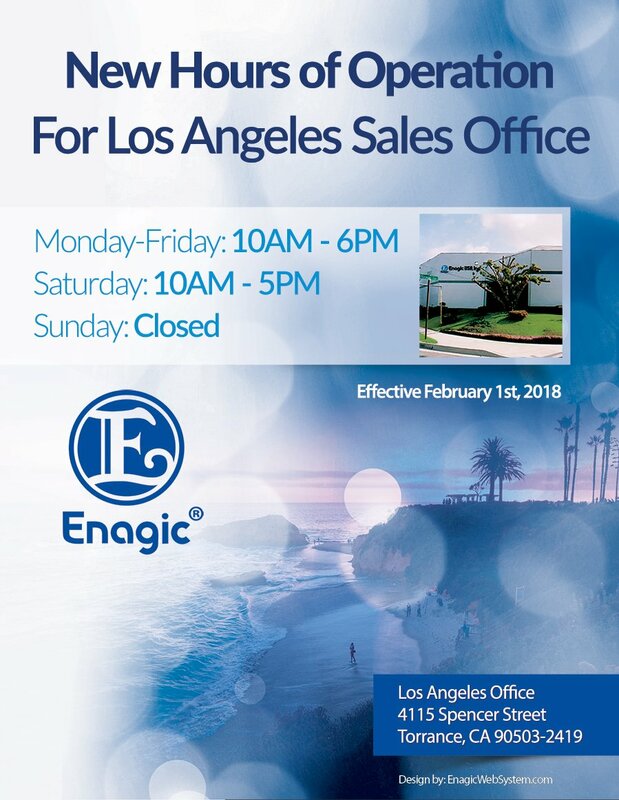 To help YOU spread Kangen Water across the globe, our Torrance, CA office will now be open 9am PST - 8pm PST, Monday through Saturday starting August 1, 2013. 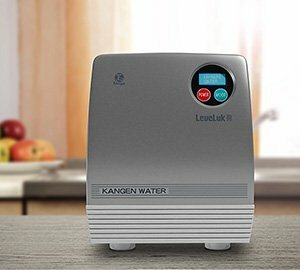 Due to the dynamic popularity of Kangen Water® internationally, there has been an influx of fan sites, articles, and other materials that wish to demonstrate the wonderful benefits of our products. These materials have been produced by many unaffiliated individuals touched by our products in meaningful ways. While we appreciate the sentiment behind these materials, we must emphasize that only materials available on our website or published by Enagic are accurate representations of our products. We do not condone any testimonials or other information disseminated through unauthorized sites (or individuals associated with those sites). In particular, we would like to note that there are certain individuals purporting to be scientific experts on subjects that relate to Kangen Water® or alkaline ionized water generally. We do not sponsor, nor are we in any way affiliated with, these "experts". Our own panel of scientific experts is explicitly endorsed on our website and in materials published by Enagic. If they are not explicitly endorsed, we ask our valued clients to refrain from associating with these individuals as they may be attempting to use our trusted name for their own gain. Quite often, the credentials for these individuals are non-existent or otherwise fail under scrutiny. No donations should be made to any organization or individual purportedly associated with Kangen Water® or Enagic®. We thank all those who support our incredible products as we "Kangen Water the world"! 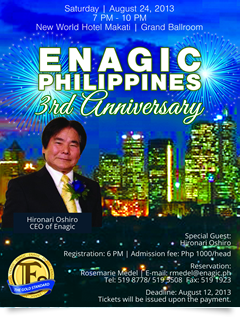 THREE YEARS ago the Enagic Philippines office was created. Come celebrate with us! Enagic USA and its satellite offices will be closed Thursday, July 4th through Sunday, July 7th in honor of Independence Day. 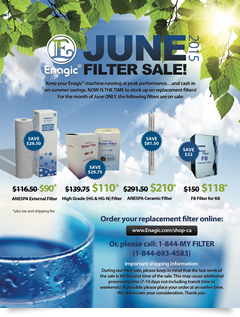 Have you already purchased your Enagic filters for the next year? There is no better time than RIGHT NOW to stock up and SAVE on the replacement filters you need to keep your Enagic machine working at its peak performance all year long. Order online today! Come to our Friday, May 17th 6A Recognition Event at the Jiyuu Event. Coming to the event? Make sure to RSVP ASAP! 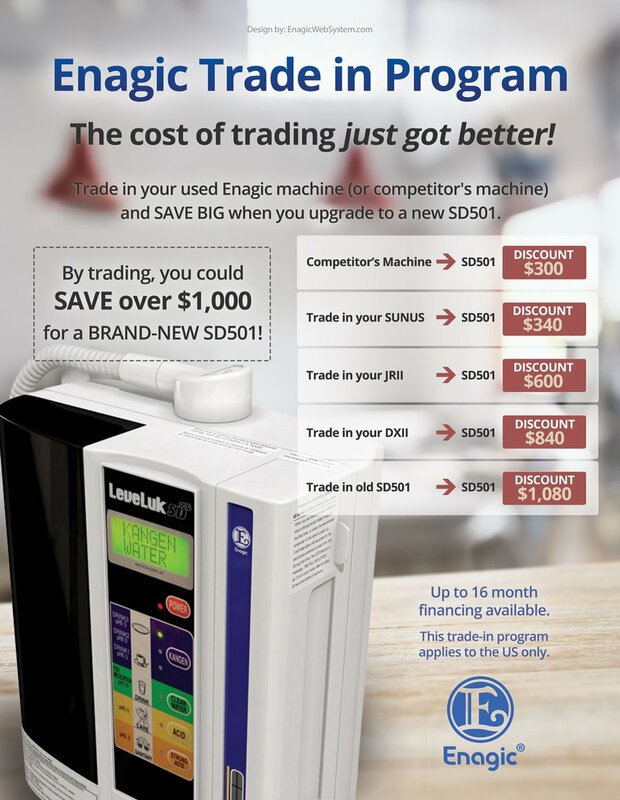 Announcing the Enagic Trade-In Sale! The cost of trading up just came down. Make the switch to a NEW SD501, and you could save up to $840! 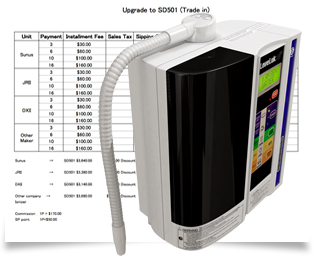 Trade in your used Enagic machine (or competitor's machine) and SAVE BIG when you upgrade to a new SD501. Our previous Sunus model, now having been discontinued, gives rise to the all new R Model. So what's different between these two models? Take advantage of the Leveluk R model today ($1,480; $60 commission + $30 SP)! 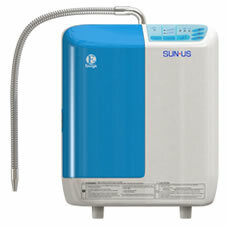 Enagic USA has halted sales of the Sunus machine effective Monday, April 15th, 2013. Please stay tuned for additional information to follow. LIMITED to 100 rooms! Be fast! If you book yourself, please also send flight confirmation sheet to Uyehara Travel. Please fill out the form for your credit card information and email to Enagic USA for the cost of stay. Price listed above. You have now booked your stay in Japan. See you there! When you book your flight please be sure to arrange the following. Flights have to be paid by distributors, estimated costs from LAX vary from $1500-$2000. Book this through Uyehara Travel (see link on website) or yourself. Hotel in Okinawa, local transport, meals, sightseeing tours and event in Okinawa. Okinawa Incentives: Many high cash prizes might be waiting for you, so come to Okinawa! Enagic cannot withhold these incentives to cover your trip expenses! You can either book the flight yourself or book through our partner Uyehara Travel. If you book yourself, you must inform Uyehara Travel about your flight schedule and you take all responsibility yourself. Check your Passport! 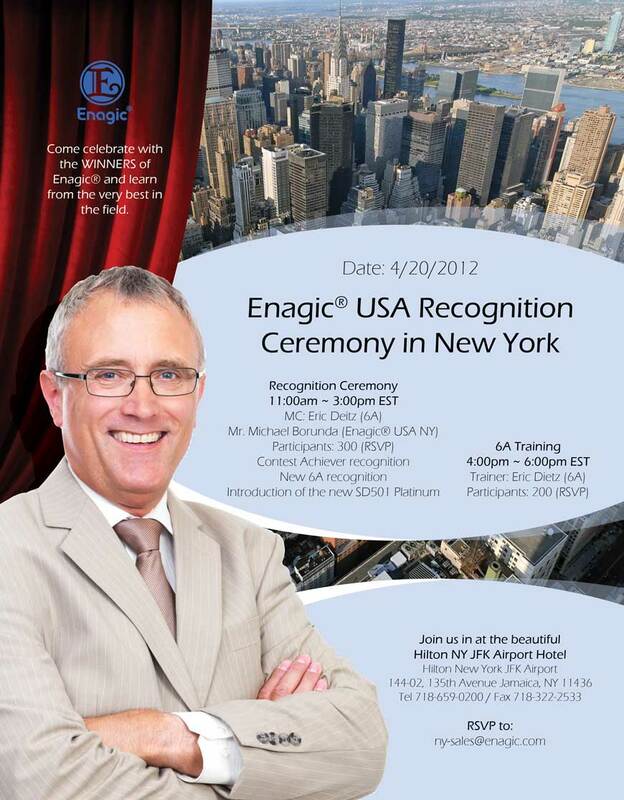 If you need help with a Visa, Enagic USA can provide you with an invitation letter. Just let us know! Once booked, it is not possible to cancel and get a refund. Changes to the flight (name etc…) are charged. If you wish to extend your stay or arrive sooner, you take all responsibility and incur expenses for the extended stay. E-Cleaner Sale - Only $20 (for a Limited Time)! 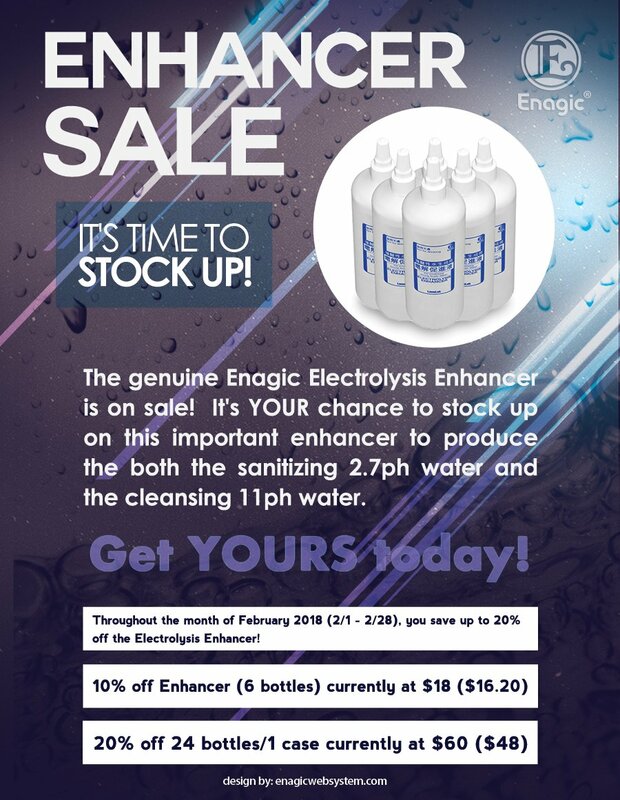 Maintain your Enagic machine and your overall health with the E-Cleaner ... for only $20 this March! 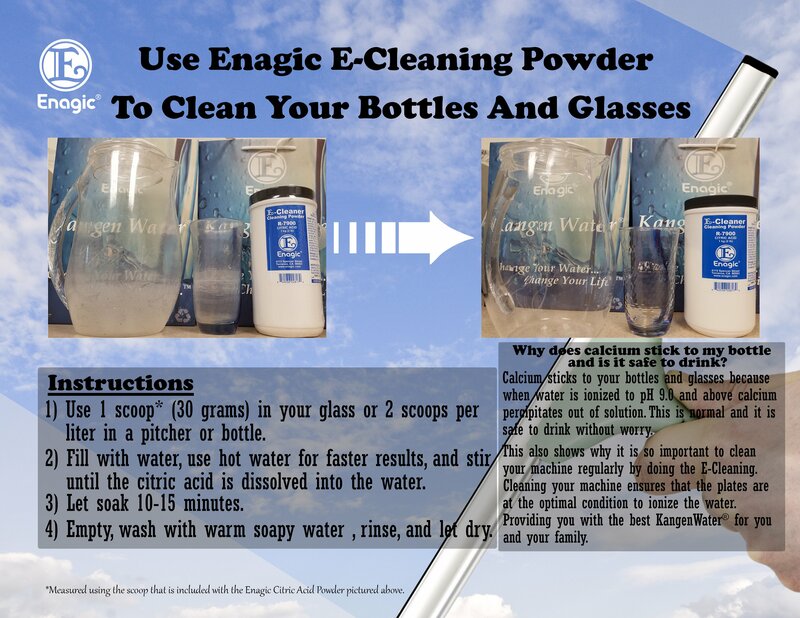 Enagic recommends using the E-Cleaner Cleaning Powder every 1-2 weeks to fight calcium build-up, keep your machine operating at peak performance, and help extend the life of your machine and filter. 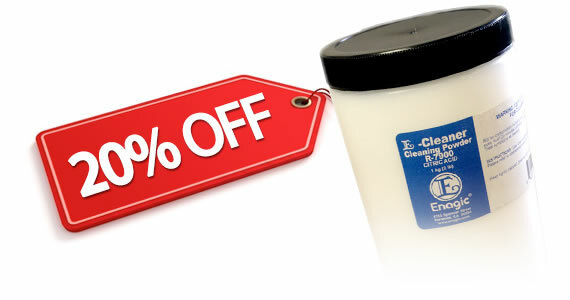 Enjoy 20% off the Enagic E-Cleaner from March 1 - 31, and keep your machine clean all year long! Will YOU be among the 500 going to sunny Okinawa this June? The welcome mat is set for you to attend the Enagic Global Conference in gorgeous Okinawa, Japan this June. You'll want to arrive on or prior to June 21st so you can attend the main event on June 23rd. Interested in attending? 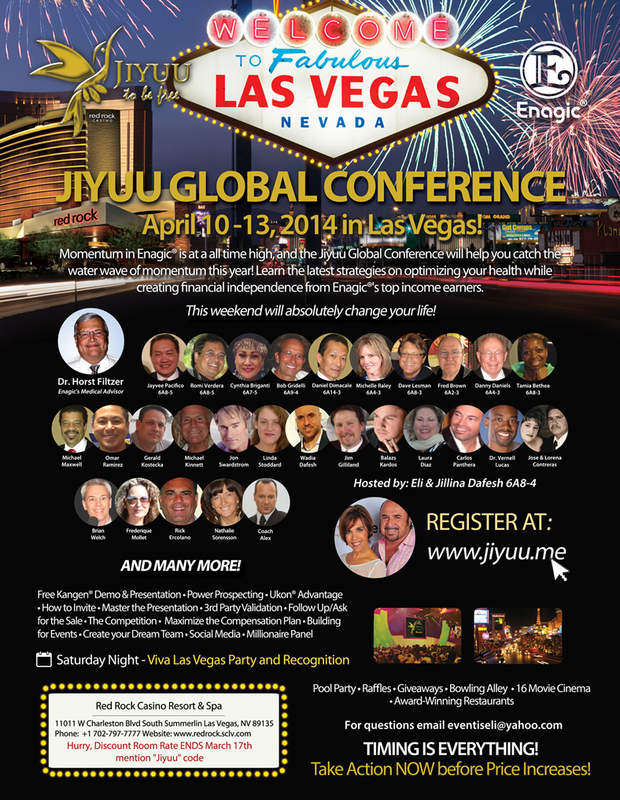 Make sure to connect with your upline 6A2-3 (not sure who that might be, just connect with your regional sales manager who can get YOUR name on our list to attend. This year, distributors are required to pay their own air travel. It's YOUR opportunity to return to the birthplace of Enagic and discover the REBIRTH of the Enagic Energy! Have you ever changed the internal filter inside your Anespa? Assuming 220 gallons a day, the internal filter should last about three years and the external filter should last about one year. So take advantage of our SPOTLESS cleaning service! 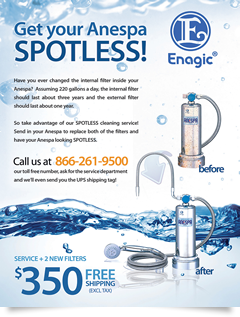 Send in your Anespa to replace both of the filters and have your Anespa looking SPOTLESS. Call us first at our toll free number, asking for the service department (866-261-9500) and we'll even send you the UPS shipping tag! Enagic USA and its affiliate branch offices will be closed Monday, January 21st in honor of the Birthday of Martin Luther King, Jr. 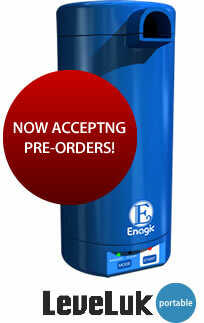 Interested in HOW best (and quickest) to process your client's orders for Kangen Water® machines? It's best to send your orders to our regional sales offices as they can provide you with a quicker turnaround time. Make sure to stay up to date with all our regional office data. As we at Enagic USA celebrate our 10th Anniversary this year (2003-2013), we are pleased to announce the nomination and succession of Don Prosser as Vice President of Enagic USA. Don has served alongside Mr. Ohshiro, the company's founder, for the past 5 years in a variety of positions - most importantly as Director of Marketing, Director of Operations, and Vice President of Sales. No matter which position he held, Don has always played a critical role at Enagic USA with his passionate leadership and proven commitment to Enagic. 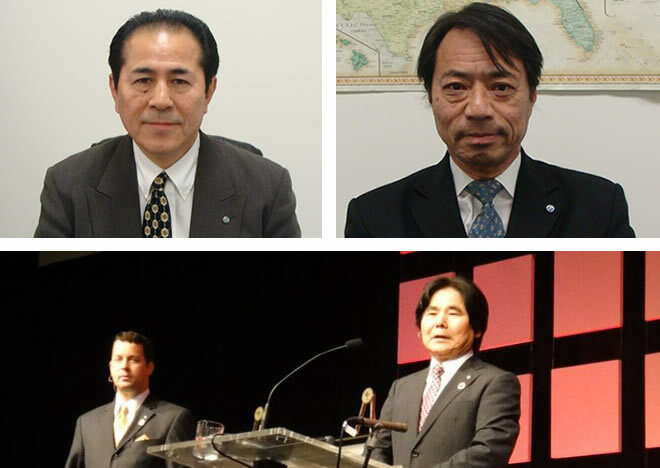 Mr. Ohshiro's selection of Don as Vice President represents an exciting new shift and commitment to the continued growth and prosperity of Enagic USA. After a full decade of soaring success, Enagic USA is poised to confidently approach the coming decades with an empowered vision of true prosperity and True Health. 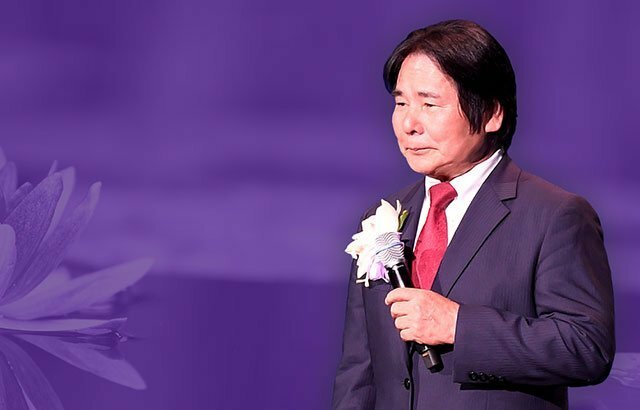 "Mr. Ohshiro's vision is so radical, unconventional, and unequivocally unique that it is able to penetrate the hearts of people worldwide in a variety of different manners. We are standing at the point of history-making, looking out over the vast expanse before us and asking ourselves, 'What will I do to be part of this magnificent and life-transforming story?' This is our destiny moment, our chance to pierce the veil of all challenge and deliver the excellence that awaits us!" Through diligence and steadfast commitment to Enagic's core message of compassionate empowerment, our distributors represent the pinnacle of network expertise.  These highly skilled and versatile independent business partners have helped spread the company's mission to more than 36 countries around the globe. How much more can we expand in the coming years? The possibilities are endless! As 2013 dawns and a new era awaits Enagic USA, we call upon YOU to join hands with us as we continue this journey of personal discovery, preservation of True Health, and quest for deep, inner peace. Enagic USA and its affiliate offices will be closed Tuesday, January 1st, 2013 in honor of New Year's Day. We'll resume operations Wednesday, January 2nd. We value ALL your efforts in helping us develop a KANGEN™ WORLD! Enagic USA and its affiliate offices will be closed on Monday, December 24th and Tuesday, December 25th in honor of the holidays. 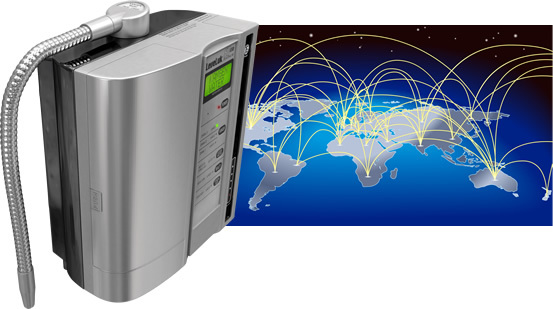 Have you ever wanted to share with a client exactly HOW to install a Kangen Water® machine but been far away? Now you can share our installation video with anyone, anywhere! Webinar Cancelled - Will be rescheduled at a later time. 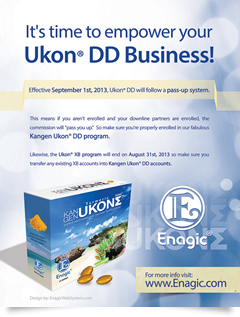 All the answers to all YOUR questions about Enagic's exciting new Ukon™ DD and Kangen Water® marriage! Hop online with us this Friday, December 21st at 3pm PST with Arthur Johnson & Takashi Fukuda. See you then! 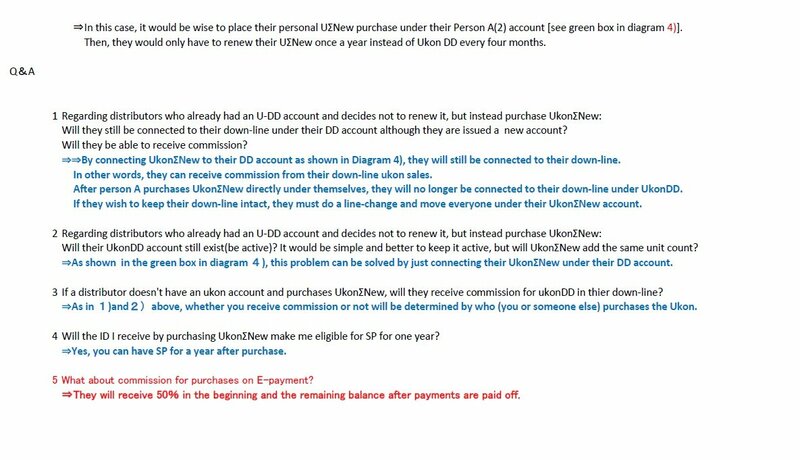 All Ukon™ DD orders will contribute to your total sales for any linked accounts. 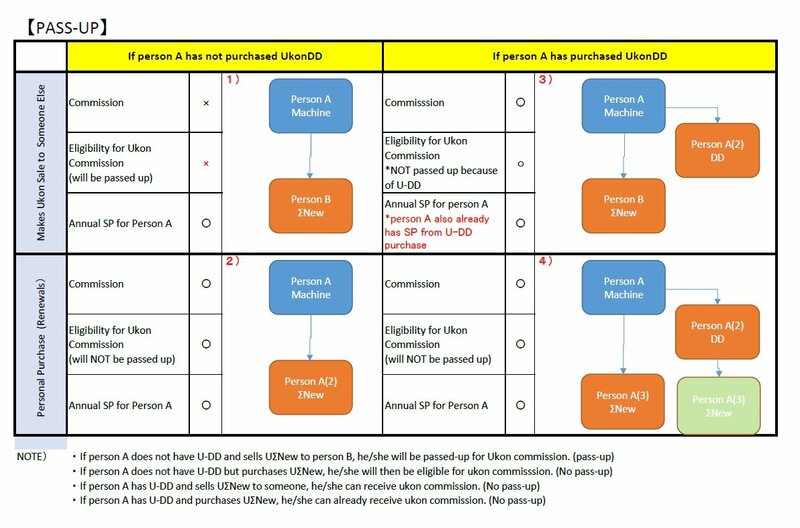 Generally, every three (3) Ukon™ DD orders will be equivalent to one (1) machine order. Ukon™ orders will qualify as step-up sales for the ranks of 2A through 5A, as long as one sale is direct. To qualify as a 6A distributor, your step-up sale MUST be a direct machine sale. Good news for all you Kangen Water® & Ukon™ DD luvers! They've married! Now, any Ukon™ DD sales you make count as full unit sales at a 3:1 ratio for all your promotions. Due to voter approval of Proposition 30, the California statewide sales and use tax rate will increase one quarter of one percent (0.25%) on January 1, 2013. 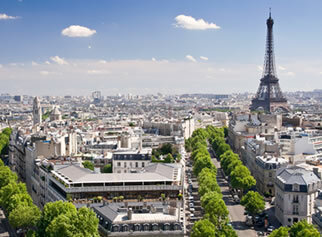 The higher tax rate will apply for four years - January 1, 2013 through December 31, 2016. Check HERE for more information. 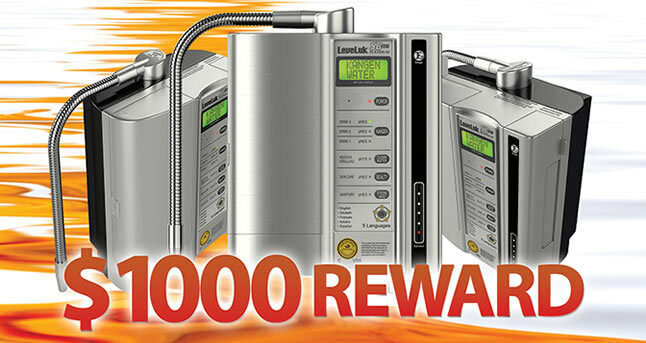 So NOW'S the time to order your Kangen Water® water ionizer! 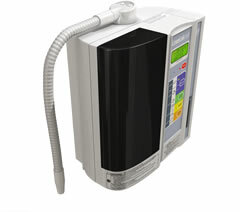 Own an Enagic DX ionizer? Always hoped to upgrade to an SD501? Well, now's your chance! Simple send us your previous DX machine along with a new product order form and for a discounted price, a new SD501 is YOURS! Our Philippine office will be closed Friday, November 30th in honor of Bonifacio Day. 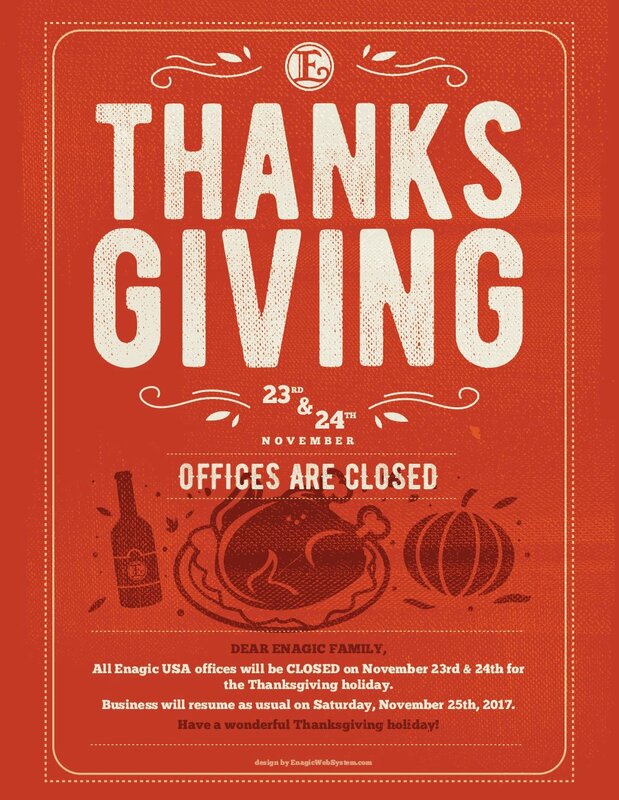 Our US offices will be closed in honor of Thanksgiving Thursday, November 22nd through Sunday, November 25th. Effective December 1st, 2012, the installation fee will increase from $60 to $75, with an additional $1.50/mile mileage rate (minimum 15 miles). Maximum distance to travel for an installation is a 45 mile radius. (This does not apply to under-the-counter installations). 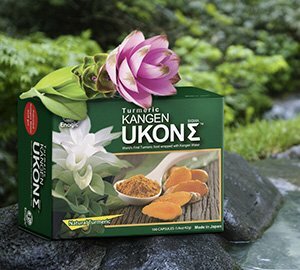 You can order Kangen Ukon DD online now! Hop on board! Check this out! Our own boat race in Okinawa! 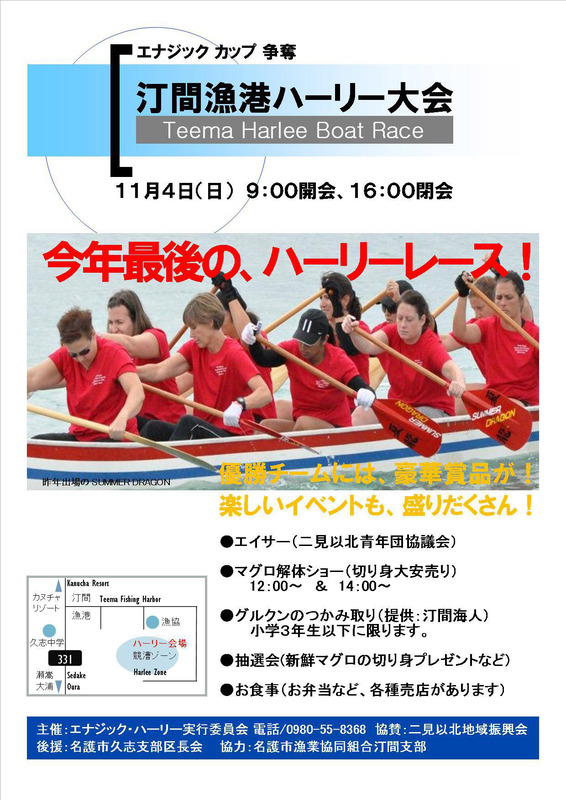 Okinawa's final harlee competition for the season will be held on November 4th (Sun) from 9am at the Teema Fishing Harbor in Nago City. As of October 29th, the number of teams has already exceeded 40. 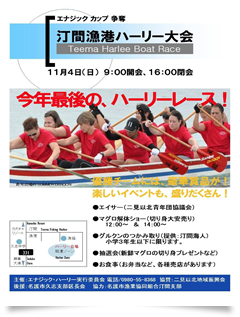 With foreigners living in Okinawa also participating in this global boat race, it looks like we will have a big competition to cap the season. There will be Eisa dancers, a tuna disassembling performance, Bananafish catching game (for 3rd graders and under), a drawing to win tuna fillet and many other prizes, just to name a few. In addition, there will be locally grown produce, food stands, super cheap draft beer, an ukon tea store and more! From the young to old, there's no doubt you'll enjoy it with the whole family! So, who's going to take this year's luxurious prize and Enagic Cup?? Come find out and enjoy as you listen to music selected by our DJ and watch the final harlee boat race of the year! Our Malaysia office will be closed Tuesday, Nov 13th (in honor of Deepavali) and Thursday, Nov 15th (in honor of Awal Muharram). Our EU offices will be closed this Thursday, November 1st in honor of All Saints' Day. For the quickest processing of your orders, please feel free to fax your orders to the branch closest to you. We'll be sure to expedite your order, ensuring your client gets their Kangen Water® machines as quickly as possible! Our Malaysia office will be closed Friday October 26th and Saturday October 27th in honor of Hari Raya Haji. 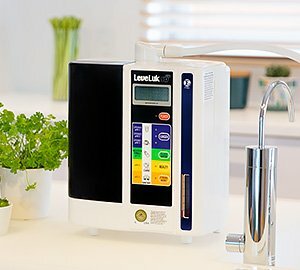 We're excited to announce that effective today, Tuesday, October 23rd, we're looking forward to accepting Kangen Water® machine orders by telephone. Just call our information center at 310-542-7700 or 1-866-261-9500 where we'll be happy to fulfill your order. Our Philippine office will be closed Friday, October 26th in honor of the Mulsim holiday of Eid_al-Adha. Our Taiwan office will be closed Wednesday, October 10th in honor of National Day. 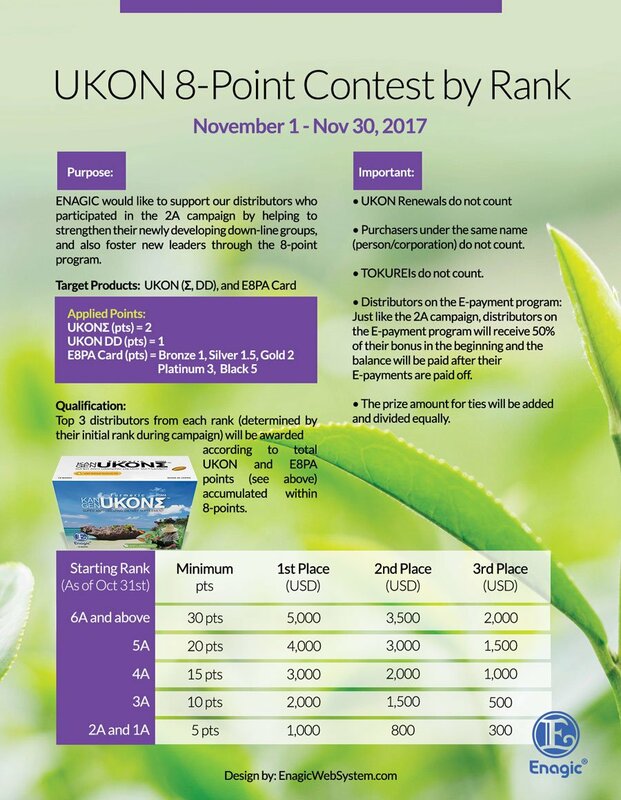 For the month of October, if you are 6A2 and above, you will automatically be qualified for the monthly incentive by selling a certain number of UKON DD. 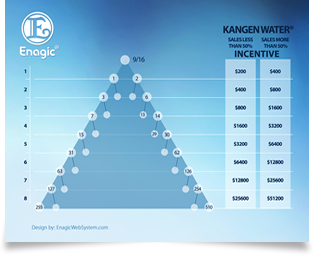 Please note how the number of sales counts in UKON DD program is different from how it is counted in your Kangen Water business. For example, you are trying to achieve the position of challenger. Let's say you have 3 legs with group sales of 30, 20, and 15. From the largest leg you'll receive 1/2 of the requirement of 51 which is rounded to 25, then you need a total of 26 from the other 2 legs to qualify. A=25 + B=20 + C=15 = 60, which is more than 51. Congratulations you are a challenger! Another example: 3 legs 400, 150, and 200. The largest leg is 400. The nearest position of qualification is 1/2 of 501 = 250 This is for 6A Gold. 6A Gold needs 501-1,000 to qualify. A=250 + B=150 + C=200 = 600 , which is greater than 501. Congratulations you are a 6A Gold! 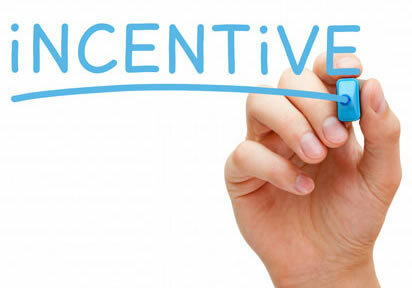 You must keep your position for 2 months in a row to receive the title incentive bonus. Please take advantage of this opportunity. If you're expanding this to your downline partners you should be able to qualify this month. Our US operations will be closed Monday, October 8, 2012 in honor of Columbus Day. 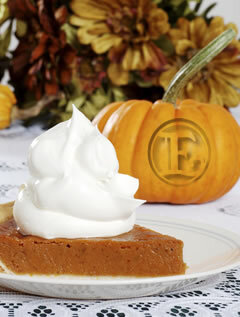 Furthermore, our Vancouver, Canada and Toronto, Canada offices will be closed Monday, October 8, 2012, in honor of Thanksgiving. Our office in Germany will be closed Wednesday, October 3rd in honor of German Unity Day. Monday, October 1st in honor of the day following the Mid-Autumn Festival. Tuesday, October 2nd in honor of the day following the National Day. Tuesday, October 23rd in honor of the Chung Yeung Festival. 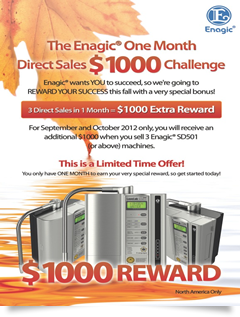 Take the Enagic North America One Month Direct Sales Challenge! 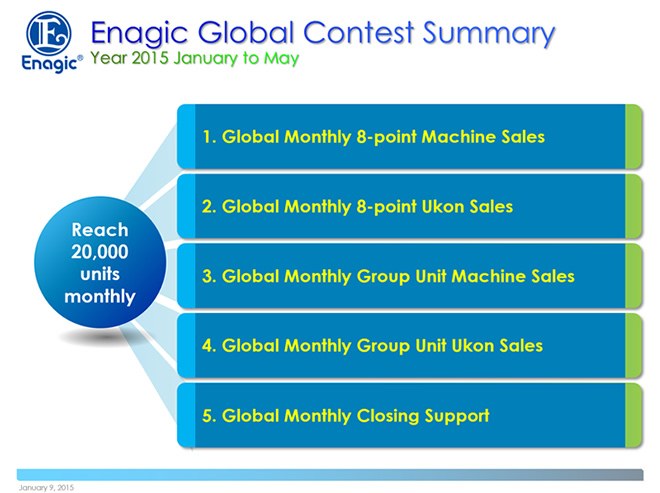 Enagic invites you to join the One Month Challenge: Sell 3 SD501 (or above) machines in ONE MONTH, and receive a $1000 Extra Reward - in addition to your regular commission! This special promotion is only happening in September and October 2012, so don't delay! 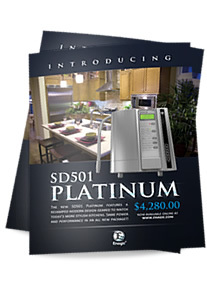 Start selling your 3 SD501 machines, and we look forward to rewarding you soon. For NEW clients signing up, you have 30 days from the date of your signup to directly sell three (3) qualifying machines in order to qualify. 1. Do all machine orders count? 2. If I sell 2 qualifying machines in September and 1 qualifying machine in October, am I qualified to receive the $1,000 promotion? A. No. There are Two opportunities to qualify with 3 sales. Once in the month of September and once in the month of October. The two months are divided into two separate qualification periods. 3. If I sell 3 machines in Hong Kong, am I qualified? No, only qualifying machines sold in North America (Canada, United States and Mexico) qualify. Both the buyer and distributor must be in North America. 4. When will the $1,000 promotion be paid? 5. Do tokurei (Good Samaritan) orders count? Are you ready to take your Enagic business into the STRATOSPHERE? 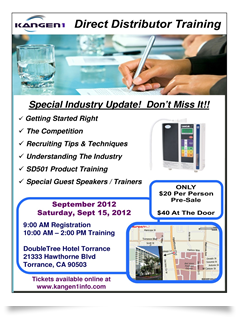 Then come join us this Saturday, September 15th for training of the highest caliber! 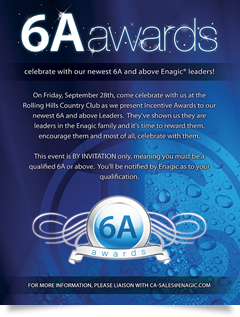 Come celebrate with us at the Rolling Hills Country Club as we present Incentive Awards to our newest 6A and above Leaders! September 5th is Kangen Water Day! Celebrate healthy alkaline hydration with 9.5pH Kangen Water on 09/05! 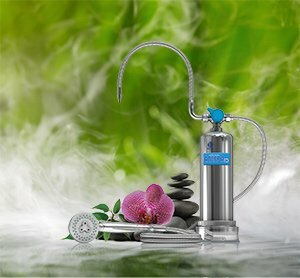 In honor of international Kangen Water Day, Enagic will be giving away 1 free Enagic Kor One Bottle with every Enagic machine purchased between September 1st, 2012 and September 8th, 2012. This exclusive water bottle is a $30 value, and will make a refreshing - and stylish - accessory for any Enagic machine. 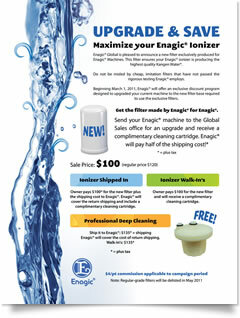 Order your Enagic machine on Kangen Water Day to take advantage of this exciting free gift! Enagic USA and its affiliate offices will be closed Saturday, September 1st through Monday, September 3rd in honor of Labor Day. Our Malaysia office will be closed August 31st through September 3rd in honor of Malaysian Independence Day. Our Malaysia branch office will be closed Monday, August 20th and Tuesday, August 21st in honor of Hari Rayah. 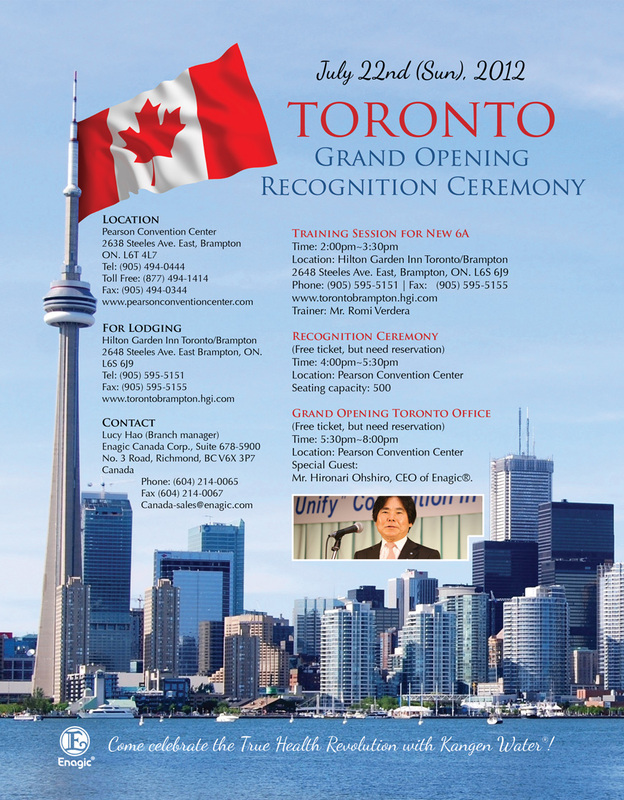 The next Enagic Global Celebration will be held in our newest expansion city, Toronto, Canada on July 22nd, 2012! 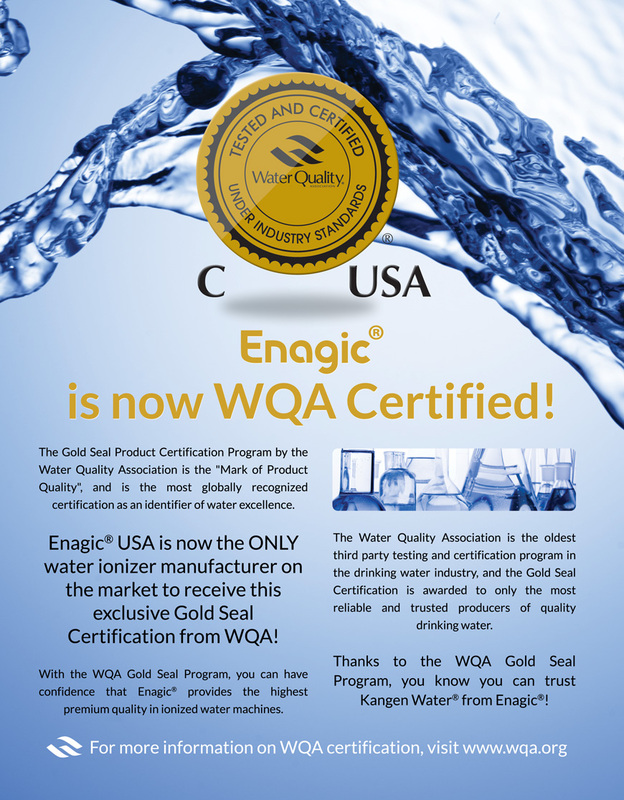 Enagic prides itself on its commitment to providing safe and reliable Kangen Water products globally. To that end, please rest assured that ANY and ALL products manufactured by Enagic from Japan are completely safe and free of radiation concerns. Enagic takes very seriously its involvement in your TRUE HEALTH! 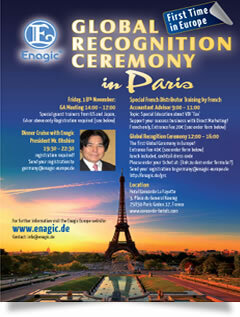 You are invited to the Enagic Paris Office GRAND OPENING CELEBRATION and Global Recognition Ceremony! 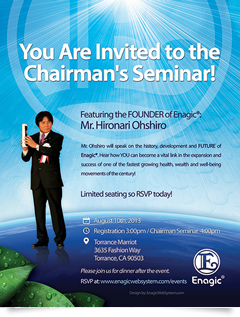 Please join us on Friday, September 21st for this exciting event at the luxurious Hotel Concorde La Fayette...with special guest Mr. Hironari Ohshiro - President and CEO of Enagic. 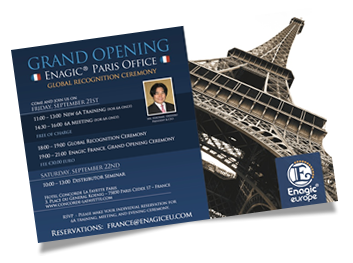 Friday will feature a 6A Training Session and 6A Meeting, the Global Recognition Ceremony where we will honor the success of outstanding Enagic distributors from all around the world, and the Grand Opening of our new Paris Office! 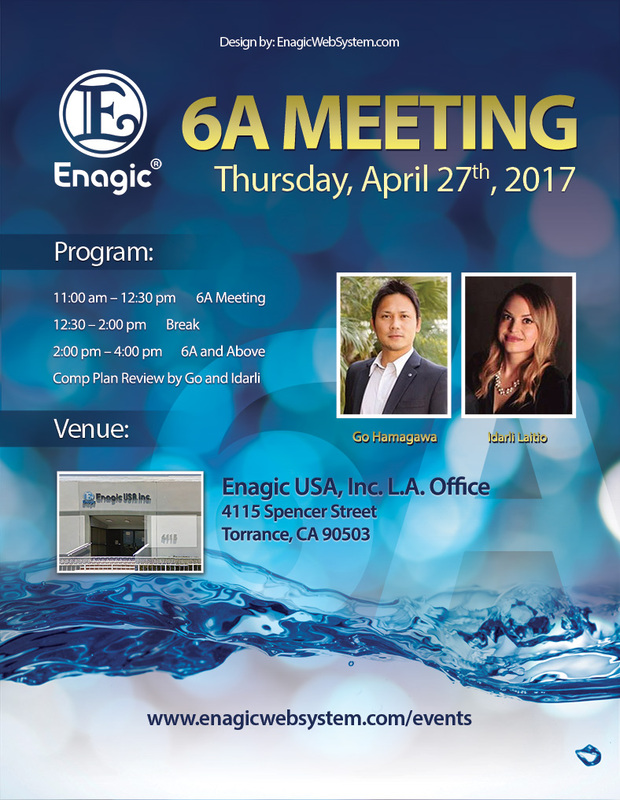 Then don't miss the Saturday morning Distributor Seminar, where Enagic's top leaders will share the company's philosophy and business model. Join us for this magical evening with Enagic in La Ville-Lumière. 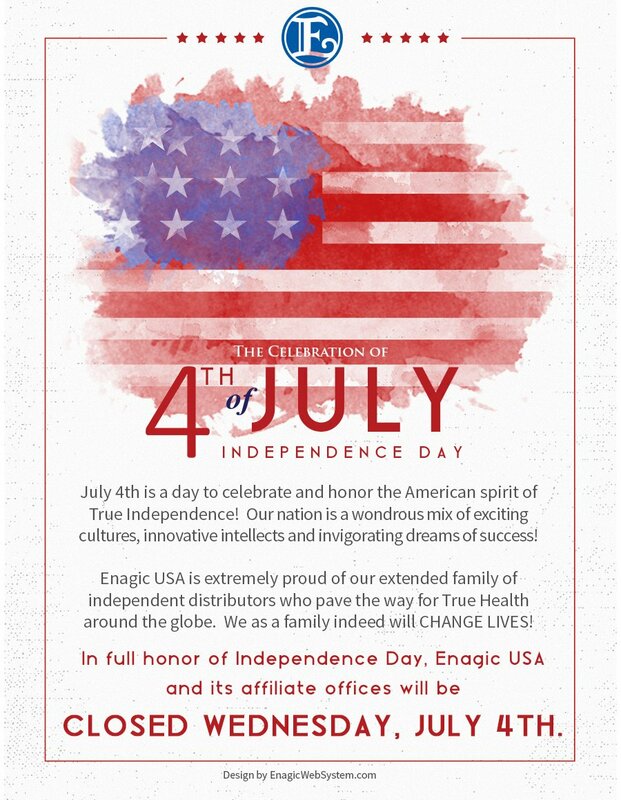 Enagic USA and its branch offices will be closed Wednesday, July 4th in honor of Independence Day and will resume normal business operations Thursday, July 5th. 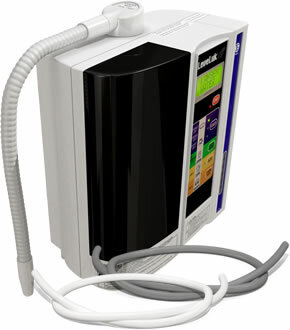 Enagic USA prides itself on its deep and abiding relationship with its distributor base. Our distributors are more than business partners and brand ambassadors; they are valued as field counselors. 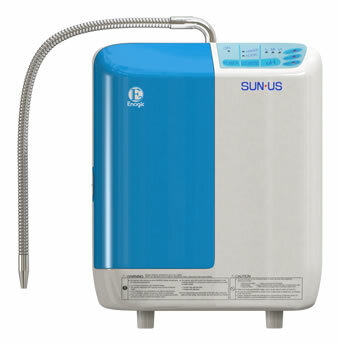 When Enagic announced that it was ceasing production of the SunUs line of Kangen Water® ionizers, many felt the idea was both premature and unnecessary. That degree of passion displayed by our valued distributors is the hallmark of Enagic loyalty. 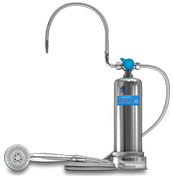 Therefore, effective today, Enagic USA is proud to announce that the SunUs model will be back in production and available to order! We look forward to this win-win decision and take this opportunity to express to our entire distributor base: We VALUE you, HONOR you and APPRECIATE you. 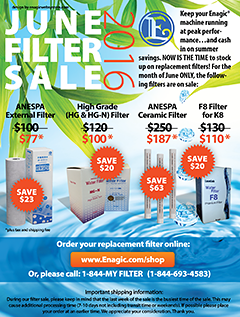 Our original Enagic filters are both designed and manufactured according to the strictest of quality standards. 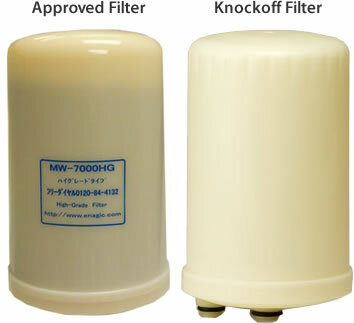 To that end, both safety and health quality can not be assured using a knockoff filter. 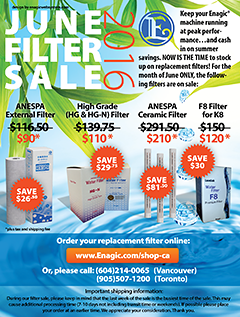 As well, our own Enagic warranty doesn't apply if a non-Enagic filter is used. Please be careful of knockoff companies, especially in regards to radioactive concerns. Without the official Enagic lettering shown, the filter is a knockoff. When Distributors make exceptional contributions to the Company, they become eligible for Shoreikin Awards. Factors demonstrating exceptional contributions include, but are not limited to, outstanding sales efforts and remarkable sales group organization. Shoreikin Awards may differ in name in order to limit the eligible group (eg. The Title Incentive, 6A Group Award, 6A Stepup Award, 6A 8-Level Award and 6A2-3 and Above New Incentive Award) but they are all awarded at the sole discretion of the Company. Shoreikin Awards are not paid automatically and will differ based on the overall efforts of our Distributors. Any Distributor subject to an Administrative Hold and/or Disciplinary Action will be ineligible for any Shoreikin Award. Our Hong Kong office will be closed Saturday, June 23rd in honor of the Tung Ng Festival. 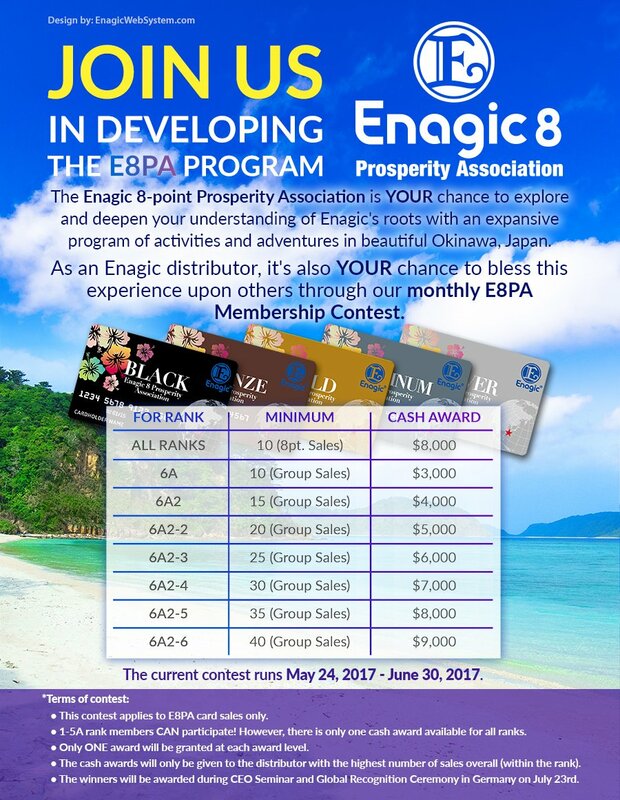 The patented Enagic 8-Point Compensation System has dramatically improved the financial health of people around the globe. It remains a vibrant, effective tool to use to this day. Yet, when people either misunderstand or misuse the compensation system as an enticement, problems ensue. Enagic takes very strongly its responsibility to uphold the highest ethics. Furthermore, as a representative of the Direct Selling Association (DSA), we feel that "check waving" and "financial promises" are both unethical and deceiving. We ask strongly that our distributors refrain from ALL check waving and income claims. There is no middle ground on this issue. We need your full and empowered cooperation to protect the company image as well as the business potential for our valued distributors. 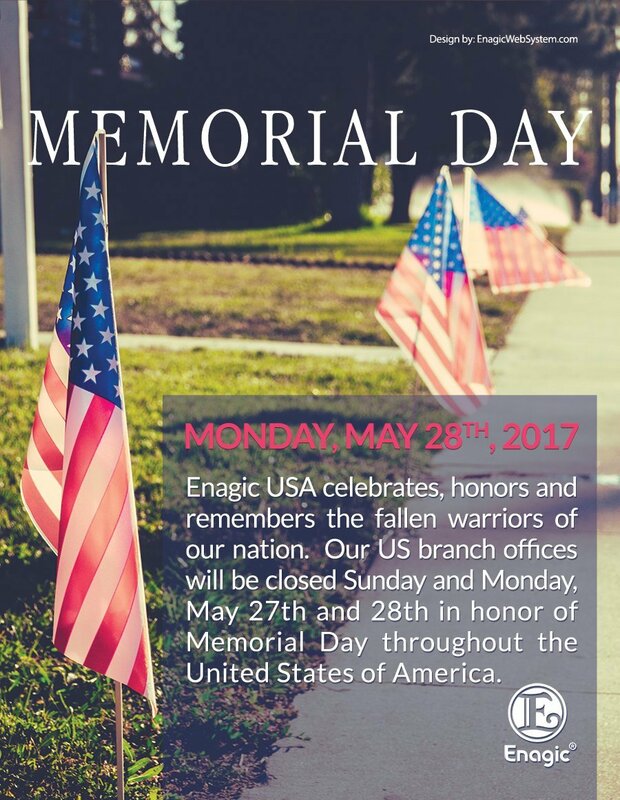 Our Enagic USA branch offices will be closed Saturday, May 26th through Monday, May 28th in honor of Memorial Day. We will be open for business from Tuesday, the 29th onwards. Please join us in honoring those United States warriors who have given the ultimate sacrifice to their country. As of May 26th, we will no longer accept applications for the purchase of the Sunus model as inventory will have been depleted. We thank you for your understanding and cooperation. 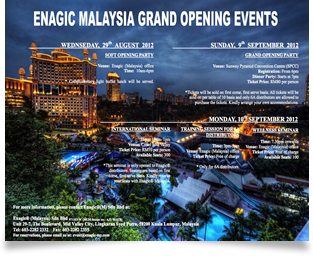 The Enagic Vision expands globally with the Grand Opening of our newest office in Singapore. Our Korea office will be closed Monday, May 28th (in honor of Buddhism Day) and Wednesday, June 6th in honor of Veteran's Memorial Day. Our US branch offices will be closed Saturday, May 26th, through Monday, May 28th in honor of Memorial Day. Summer is fast approaching and people are thinking about how to fit into their swimsuits again. One thing we do not recommend is using 11.0 pH water as a method for weight loss or other health maintenance protocol. Strong Kangen Water® (11.0 pH) is not for ingestion and only to be used as a green cleaning solution. We're pleased to announce and welcome you to the GRAND OPENING of our newest Singapore office on May 15th, from 7pm at the Ritz Carlton Hotel. Admittance fee is $40/person. EWS Annual Sale is GOING ON NOW! We want to give you the opportunity to SIGN UP FOR EWS today & receive 14 months service for the price of 10! This annual promotional sale will only be available until May 28th, so don't delay! Equip your business with the tools you need to succeed, and enjoy 4 full months FREE! We would like to provide an official statement that the "Global XTS" Platform, owned and operated by Cheri Tree, is neither endorsed nor sponsored by Enagic®. 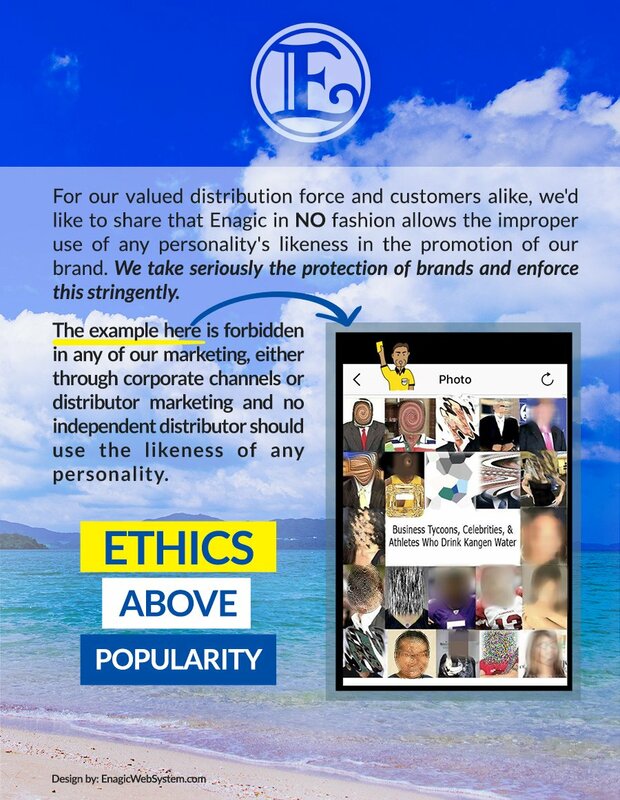 We regret any confusion caused by the unauthorized use of Enagic® trademarks, logos and other corporate materials. 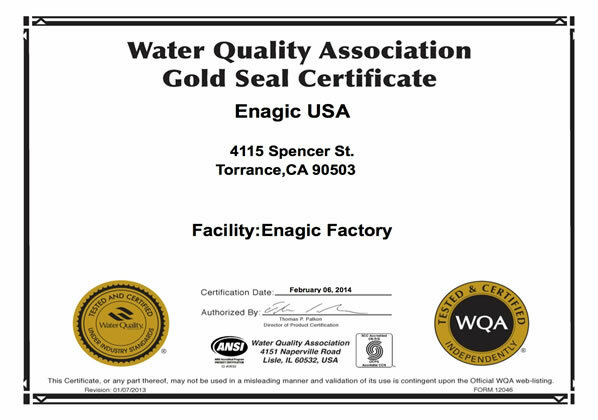 Thank you for helping us make Enagic® the world leader in quality water ionization. We value your hard work, and you can trust that our long-standing commitment to compliance, excellence, and true health will make Enagic® the reputable Gold Standard for decades to come. Preserve and Protect YOUR Health! YOUR health is a precious thing and you've made the right investment with Kangen Water® and Enagic. Enagic values YOU so has offered a distributor-only insurance plan that protects you as an individual. Invest in your health and your ongoing business capacity by securing this excellent, individual insurance policy. Enagic pays SHOREI-KIN (Encouragement Incentives) instead of bonuses. 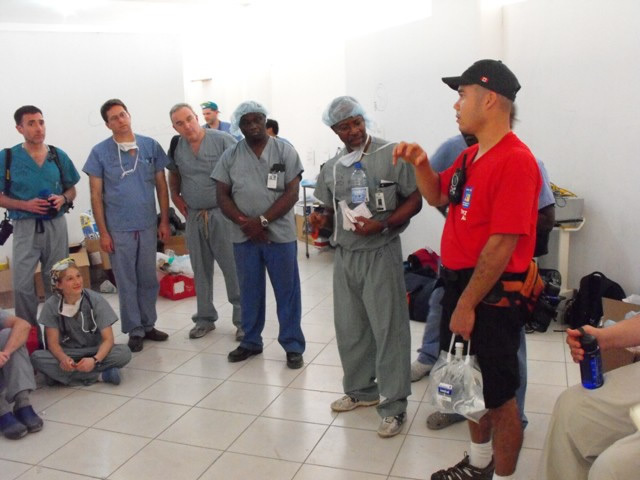 The company's philosophy is that SHOREI-KIN exemplifies the mission of expanding True Health. The reduced monthly qualification is your opportunity to support your network partners and help spread the Kangen Water® brand and image! Please note that there are no "partial" quarterly qualifications. 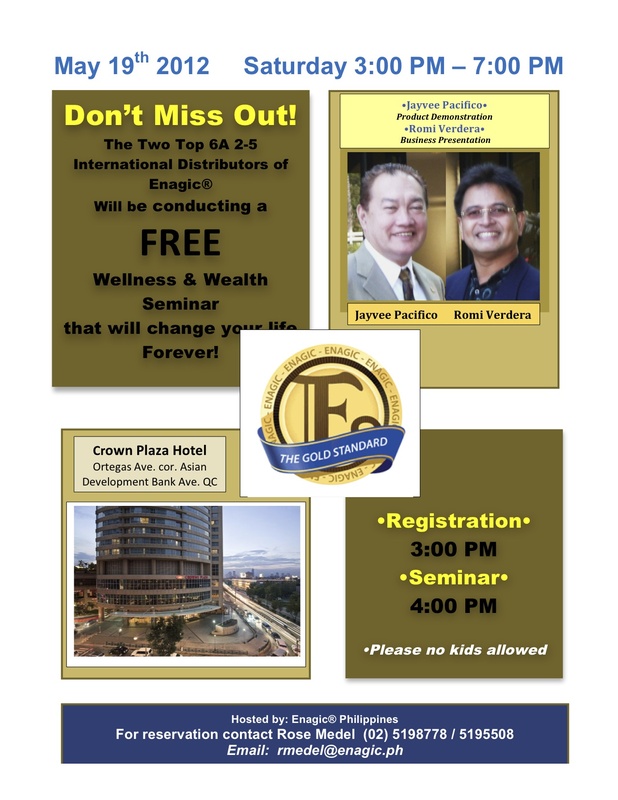 Join the TOP TWO 6A2-5 distributors from America, Jayvee Pacifico and Romi Verdera in the Philippines, Saturday, May 19th for high-level training and insights into the Kangen Water® Revolution! Where has YOUR Kangen Water bottle been? Kangen Water® is spreading GLOBALLY! Our original blue Kangen Water® bottles are being seen in some AMAZING locations. Spread the word! We're looking to see where YOUR KW bottle has been on the planet! 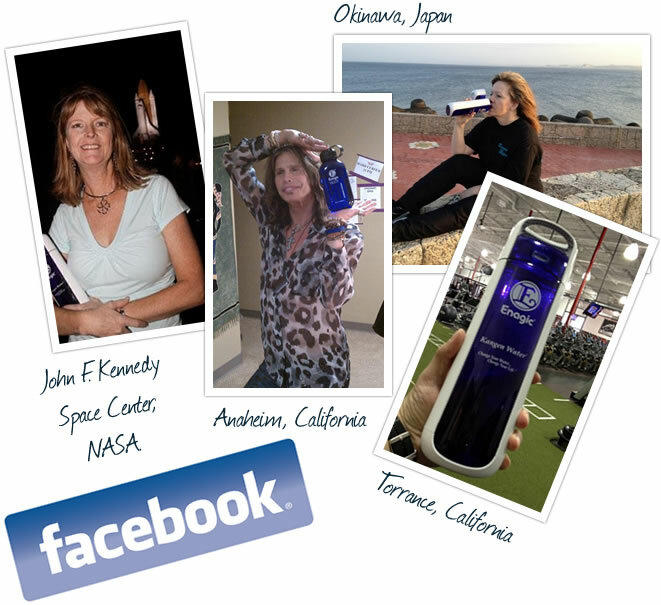 Email us your picture(s) showing your Kangen Water® bottle to pr@enagic.com and be sure to include where it was taken. Then, look for YOUR picture on our Facebook site. Do you know anyone who has an Enagic machine in Trinidad? 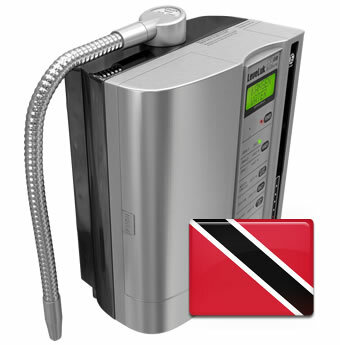 Enagic's Corporate Technician will be in Trinidad from May 7th to May 10th 2012. Cost: $35.00 US dollars to deep clean, plus additional fees for other services. Our Philippine office will be closed Tuesday, May 1st in honor of Labor Day. Our Singapore office will be closed Tuesday, May 1st and Wednesday, May 2nd in honor of Labour Day and Vesak Day, respectively. 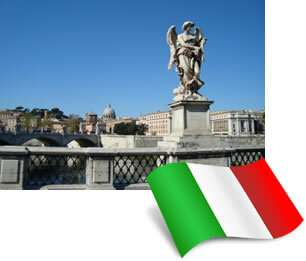 Our Italian office will be closed Tuesday, May 1st in honor of Il Primo di Maggio. Our Hong Kong office will be closed Tuesday, May 1st in honor of Labor Day. Our Australian office in Sydney will be closed Wednesday, April 25th in honor of Anzac Day. Are you in the Social Kangen Media Family? If not, you're missing out on MEGA(bytes) of information! Our Facebook posts are growing by leaps and bounds and our Twitter feed is riding the Kangen Wave! 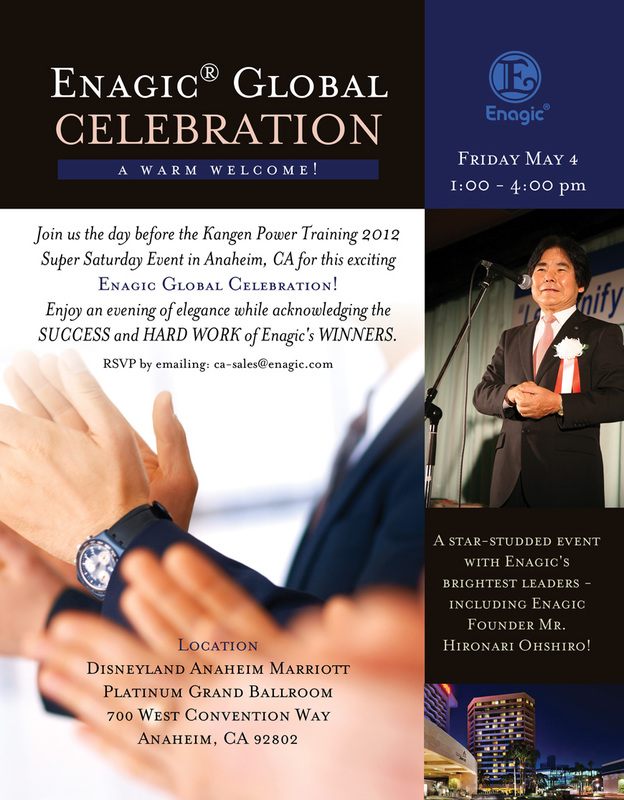 Join Mr. Takuo Kitagishi, VP of Enagic USA on Sunday, April 22 for his first American seminar. Were you aware that the office of Singapore (with a population of over 5 million people!) is now open? 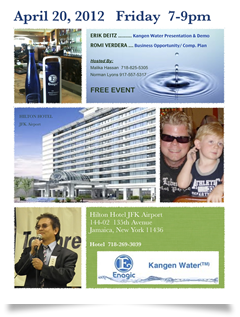 Kangen Water® expands globally! 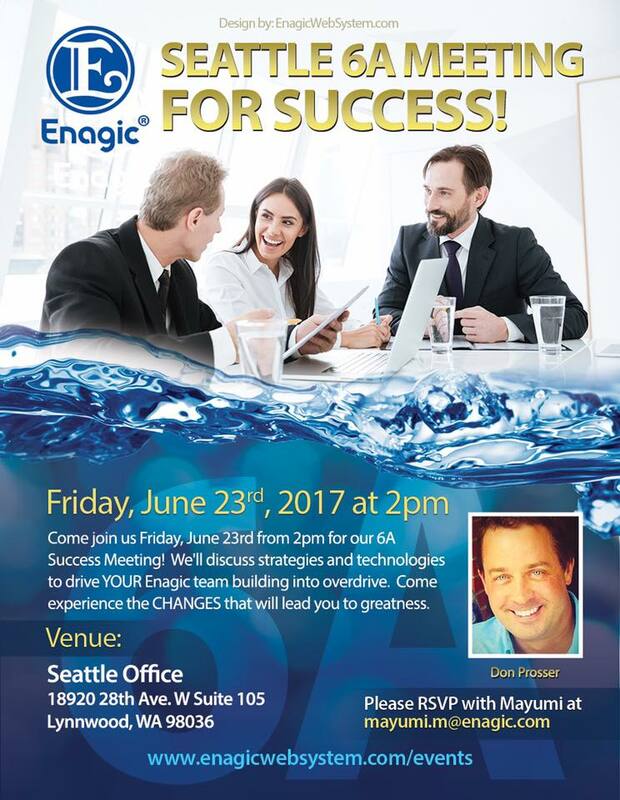 Join superstars Erik Deitz & Romi Verdera on the evening of Friday, April 20th for expert training in the ways of Kangen Water®. 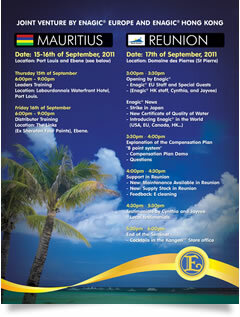 THE event of 2012; the largest gathering of Enagic distributors globally. 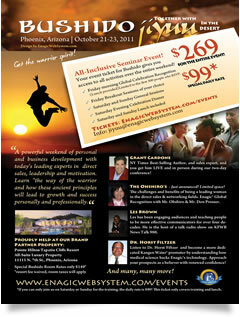 Come learn, enjoy and become empowered by the over 3,000 people who plan to attend this monumental event. Held May 5th in gorgeous Southern California, this is YOUR chance! 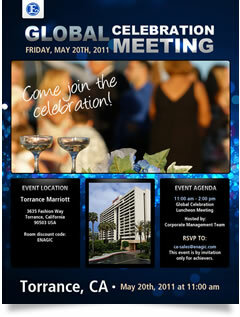 Come celebrate with the WINNERS of Enagic and learn from the very best in the field. Our Mexico branch office will be closed April 5th and April 6th in honor of their national holidays. A new 5-language Platinum SD501 has been released and is ready for sale! 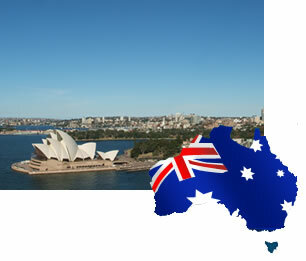 Our Australia Office will be closed April 6th and 9th, 2012, in honor of Australian Easter Holiday (local time). "NOW I know the heart of Enagic!" "Can I just stay here in Okinawa?" These are just a few of the responses folks had to the most recent Pilgrimage to Japan. Our most recent trip departed last Wednesday and lasted for five blessed days. With over 350 people from close to 40 countries in attendance, the trip spanned Okinawa and Osaka, Japan. 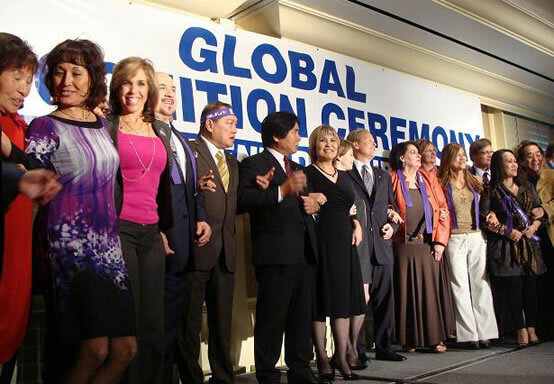 Designed to support the firm's "LET'S UNIFY" theme for 2012, it brought together people of all races, ages and genders to celebrate the success of Kangen Water® globally. Participants from areas around the globe arrived in Okinawa, Japan, the birthplace of the Founder, on Thursday, March 15th. Staying at the beautiful Laguna Garden Resort, our adventure began with scrumptious food and gorgeous surroundings. As Okinawa has a mildly-temperate environment year-round, the sun was shining and the beaches were glistening! On Friday, the 16th. tours were arranged for our group, which commanded some six full-size commercial buses. The original home of our Founder, Mr. Hironari Ohshiro, was a big hit with folks. Stepping inside the modest home, one could well-understand the very frugal and caring attitude that pervades Enagic. 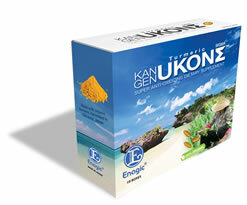 As well, a tour of the Enagic Kangen Ukon® factory was eye-opening. Participants were allowed to see the cultivation process that goes into the manufacture of Enagic's original Ukon. With the spring season just commencing, it won't be long before the Spring Ukon makes its way into production. A gala party was held on Saturday, the 17th upon the grounds of the future Enagic resort in Sedake. High up on the hill overlooking the crystal waters of Okinawa, distributors from around the world were entertained by traditional Okinawa song and dance. With top leaders from around the globe, it was also a moment to commemorate the dedication and perseverance of our half a million distributors. It was also a time to enjoy some golf on the exclusive Enagic course! That same evening, a magnificent 71st Birthday Party was held for Mr. Ohshiro at the Oyama Metro restaurant, right above the company's Aroma hot spring. It was a wonderful opportunity to celebrate the life of a man dedicated to spreading the Message of Compassion. In fact, many distributors from around the world brought presents and well-wishes. The night ended with quite a few laughs. Sunday found our group jetting off to Osaka, Japan to tour the Enagic factory. 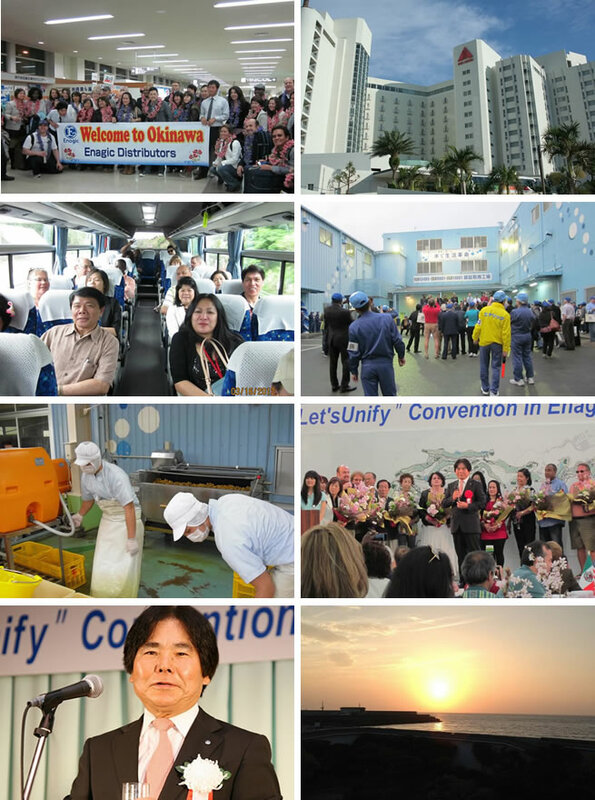 Distributors took the opportunity to see the ISO standards that Enagic is famous for, to listen to talks by factory personnel and to celebrate at a location few are afforded the opportunity to enter. Monday morning was the conclusion of our gala pilgrimage, but it certainly wasn't the end. 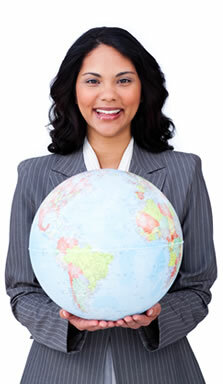 Many, many distributors split up to travel to all parts of the globe to spread the Enagic message. With lifelong friends made, our event was certainly a life-altering experience. 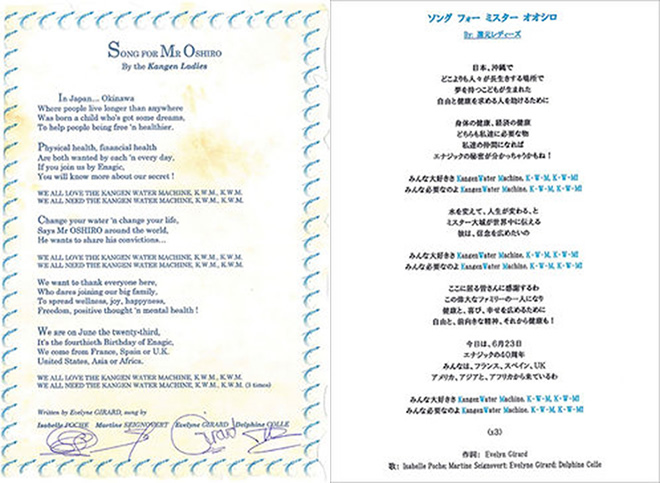 For those who attended, a hearty otsukare-sama-desu (good job!) and for those who look forward to coming with us NEXT year, mensore (welcome!). We welcome you to join us in what has become the most meaningful and invigorating tour within Enagic; the Pilgrimage Home to the birthplace of Enagic! The Enagic Hong Kong office will be closed Wednesday, April 4th in honor of the Ching Ming Festival, open Thursday, April 5th, and then closed Friday, April 6th through Monday, April 9th in honor of Easter Holiday. The office will also be closed Saturday, April 28th in Honor of Vesak, the Buddha's Birthday. Enagic Philippines office will be closed on Thursday, April 5th through Monday, April 9th in honor of the Easter holiday and Day of Valor. Enagic Singapore office will be closed on Friday, April 6th through Sunday, April 8th in honor of the Easter holiday. 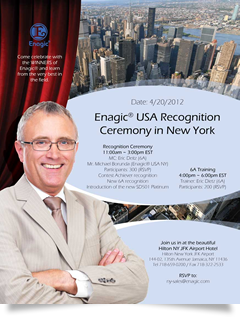 Enagic USA is pleased to welcome Mr. Takuo Kitagishi as the newly-assigned Vice President effective on March 1, 2012. 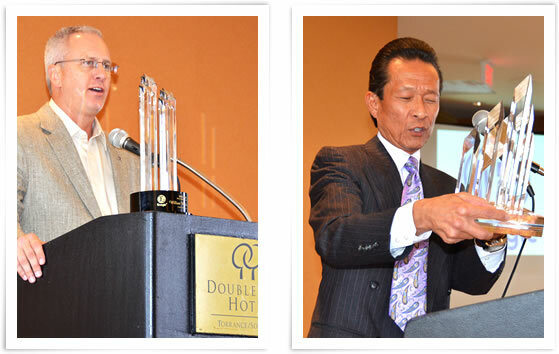 With a deep and abiding knowledge of Kangen Water®, originally Mr. Kitagishi introduced Kangen Water® to our president, Mr. Ohshiro a couple of decades ago. In addition, the following managerial promotions are announced. Effective March 1, 2012, we are pleased to announce our support of the LET'S UNIFY message by making Mr. Takashi Fukuda the Director of National Sales. All branch managers will report directly to Mr. Fukuda as he works to raise sales throughout North America. We send him our support! Also, Mr. Don Prosser will transition into his new role as Director of Public Relations. Don will endeavor to polish the image of Enagic as he strategizes with Mr. Ohshiro on the developing role of Enagic distributors. Raise the flag, Don! 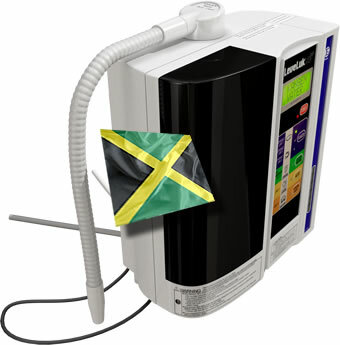 Do you know anyone who has an Enagic machine in Jamaica? We regret any confusion caused by the unauthorized use of Enagic® trademarks, logos and other corporate materials. Please also be sure to visit our approved vendor list when in question as to whether a certain marketing material is provided by an approved resource. Mr. Gray is employed by one of our competitors in the water ionizer industry. The discerning buyer should scrutinize the alleged objectivity of his site and materials. 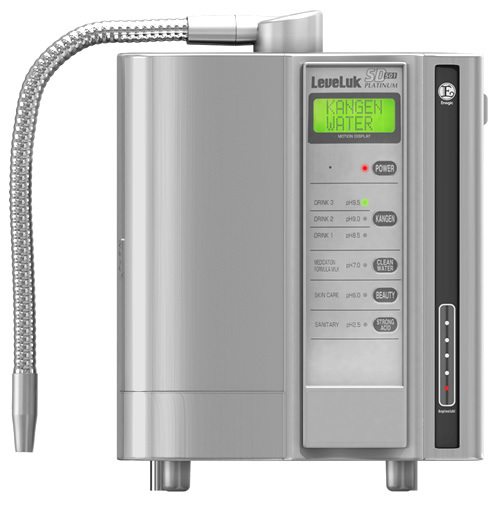 Our LeveLuk Series Operational Manual specifically states that pH 11.5 and pH 2.5 waters are not for consumption. This is also stated in our other materials such as "Advantages of Using Electrolytic Water". These materials are available on our website and hard copies are available upon request. 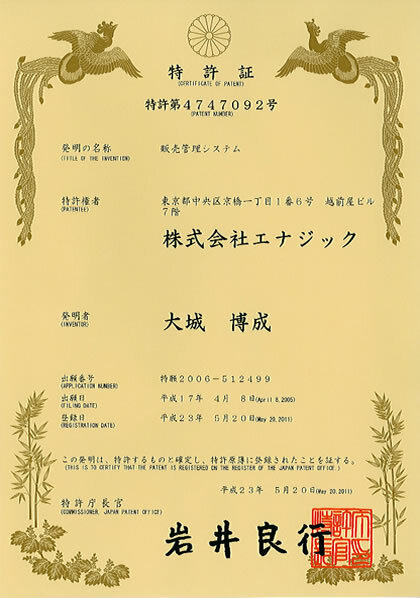 Our products are manufactured in Japan under the strictest standards. Initially, our products were only available in Japan and all enclosed materials were in Japanese. 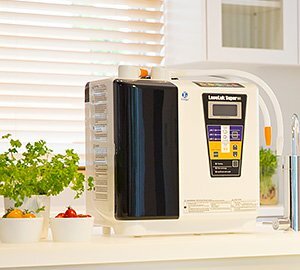 Due to the quality of our products, customers throughout the world sought out genuine Kangen Water® which can only be produced by our machines. In our wish to satisfy this incredible demand, a sentence in our Operation Manual was mistranslated and incorrectly stated that gases fill the room. This has since been corrected to read "when producing Strong Acidic Water, please make sure the room is well ventilated and avoid prolonged breathing of the vapors". Strong Acidic Water is recommended for use as a "green" cleaning solution. In an abundance of caution, we placed the preceding warning for all our clients who may be particularly sensitive. The "calcium adding port" is not for use in the United States. This was meant for use in Japan as their source water lacks the necessary minerals to properly ionize water. Calcium sulfite is non-soluble. It is presently used in 90% of all cartridge filters on the market and its sole purpose is to remove chlorine from source water. As an added safety feature, our machines employ "hot protect" settings so that hot water does not compromise the machine's filtering and ionizing capacity. The makers of all cartridge filters employing carbon technology advise that hot water should never be run through the filters as it may cause damage to the filter and the system. We have always relied on the deliberative and discerning nature of our clientele to carefully weigh the materials available and make the appropriate choice for themselves and their families. 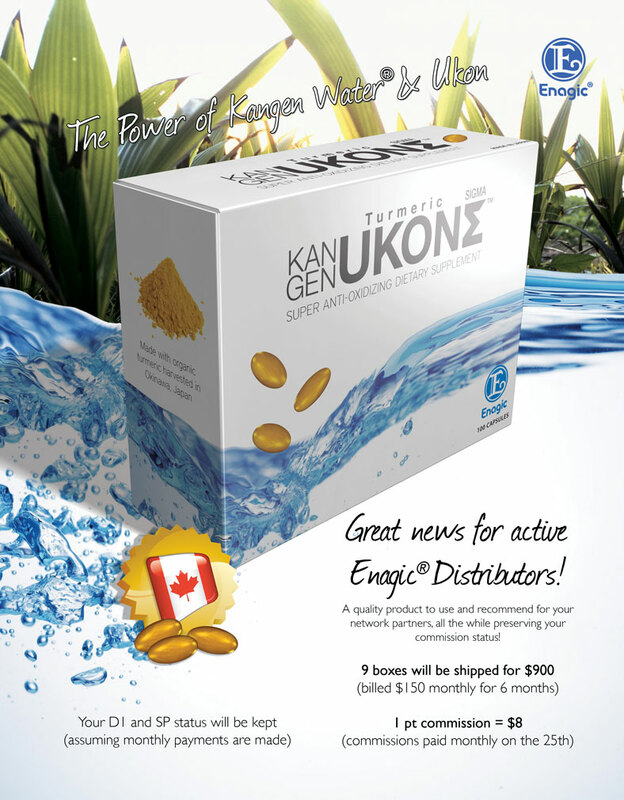 We believe that choice will always be Enagic® products that produce genuine Kangen Water®. Please forward any comments or questions to compliance@enagic.com. 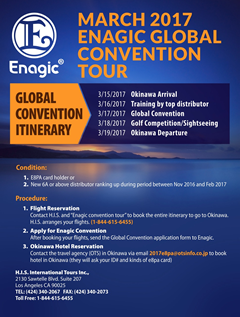 Are you going to sunny Okinawa on the Enagic Success Trip? Dinner at the Ooyama Metro Restaurant to celebrate Mr. Ohshiro's 71st Birthday! Hey Tweeters - we've got a challenge for you! 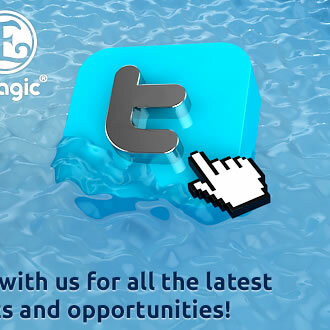 Let's make Enagic Kangen Water a trending topic on Twitter. 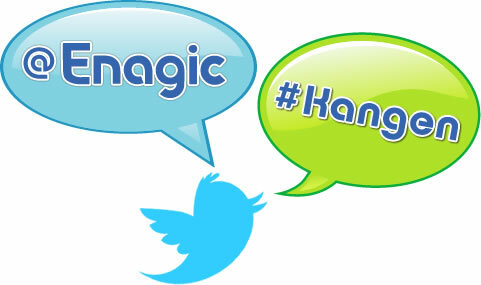 We want to see who can include #Kangen and @Enagic in the most Twitter posts within the next 48 hours. The winning Tweeter will receive a very special prize, so get creative and have fun! On your mark, get set.....Tweet! 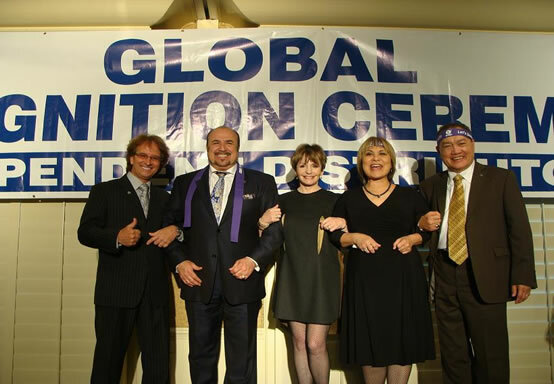 Enagic's Global Recognition Ceremony took place last Friday, January 27th 2012 - and it was a tremendous success! Mr. Ohshiro made a surprise appearance to join the celebration of new title achievers and discuss the motivational 2012 slogan: "Let's Unify!" Leaders shared their expertise and knowledge, and everyone agreed that if we work hard towards a common goal, we can achieve great things together. 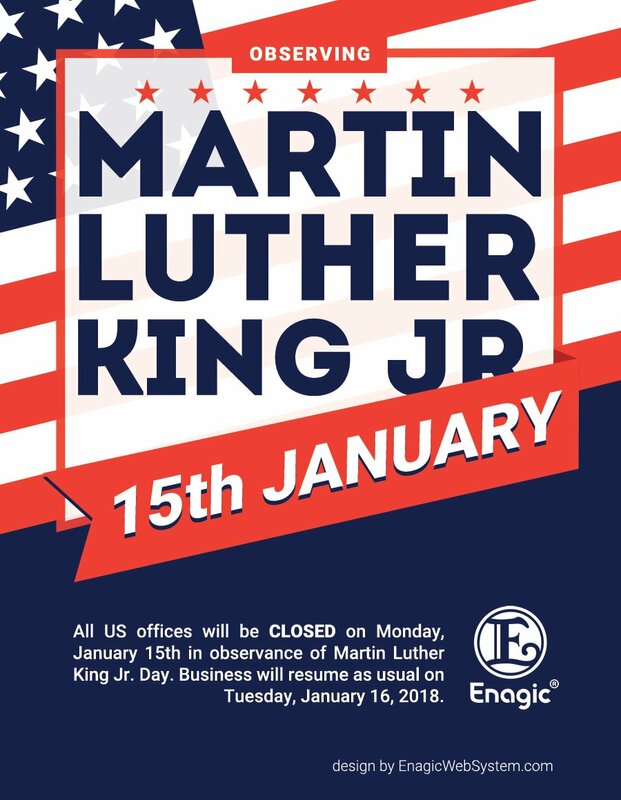 Enagic USA, Inc and its affiliate offices will be closed on Monday, January 16th in observance of Martin Luther King, Jr. Day. 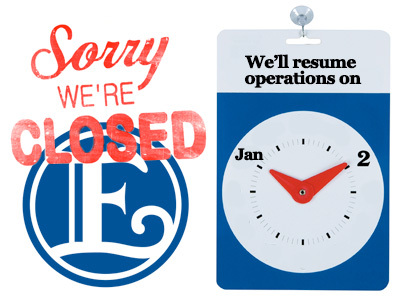 Enagic USA, Inc and its affiliate offices will be closed on Monday, January 2nd. Offices will reopen on Tuesday, January 3rd. 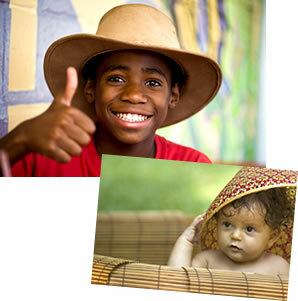 Watch the video to learn how direct selling is making the world a better place. Enagic USA, Inc and its affiliate offices will be closed on December 24th through December 26th in observance of Christmas. Offices will reopen on Tuesday, December 27th. 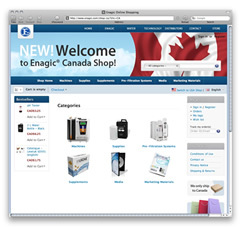 After much excitement and anticipation, the Enagic Canada Web Shop has opened! Now Enagic customers and distributors in the Great North can order machine supplies, marketing materials, an upgraded Enagic machine, and more on the Enagic corporate website. We encourage all our Canadian customers to take advantage of this convenient and user-friendly online service - just in time for the holidays! 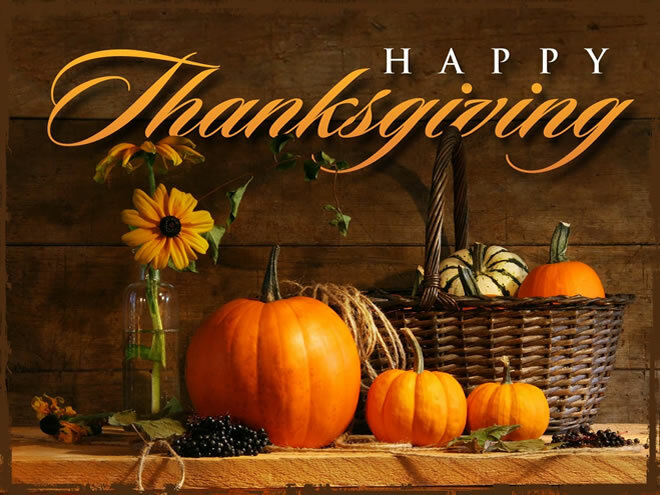 Enagic USA, Inc and its affiliate offices will be closed on November 24th through November 27th in observance of Thanksgiving. Offices will reopen on Monday, November 28th. We Invite you to Okinawa and Japan! Enagic USA and Enagic Canada, and their affiliate offices, will be closed September 3rd through September 5th in honor of Labor/Labour Day. 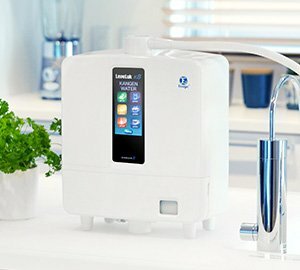 Starting NOW, commercial enterprises can lease an Enagic machine that produces the clearest, purest, and best-tasting water on the planet! 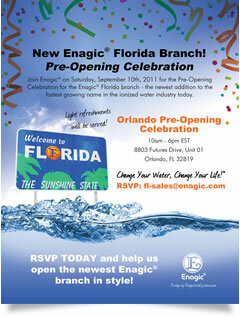 Join Enagic on Saturday, September 10th, 2011 for the Pre-Opening Celebration for the Enagic Florida branch - the newest addition to the fastest growing name in the ionized water industry today. 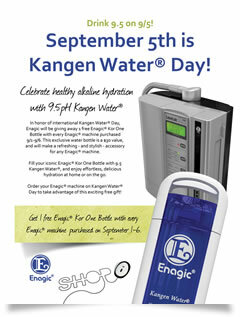 September 5th is Kangen Water® Day! 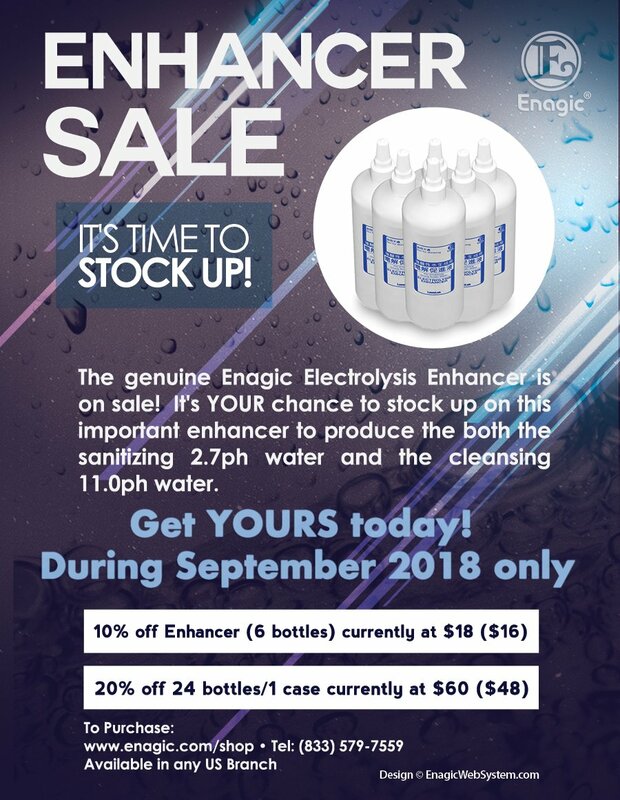 In honor of international Kangen Water® Day, Enagic will be giving away 1 free Enagic Kor One Bottle with every Enagic machine purchased 9/1-9/6. 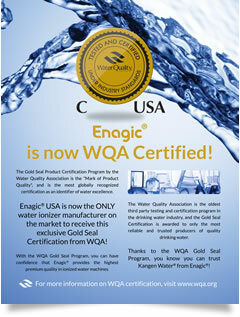 Enagic is now WQA Certified! The Gold Seal Product Certification Program by the Water Quality Association is the "Mark of Product Quality", and is the most globally recognized certification as an identifier of water excellence. 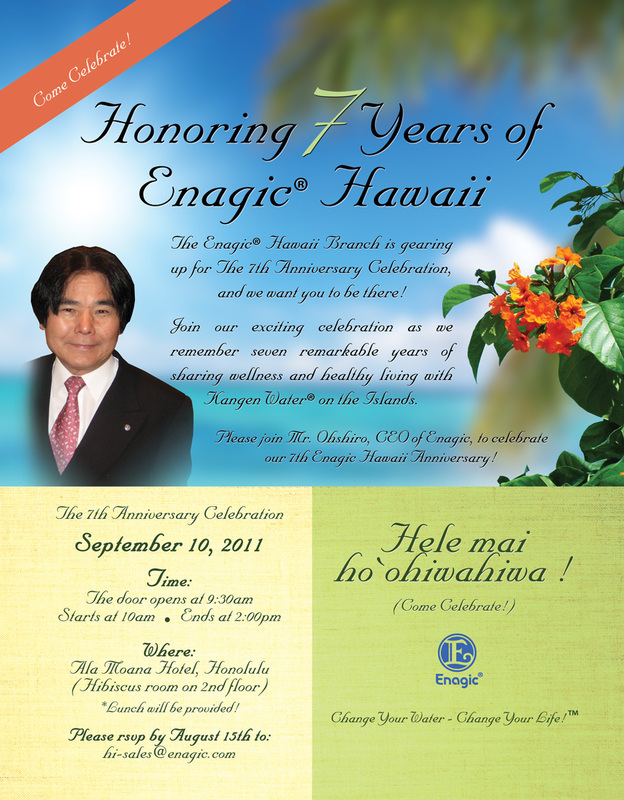 The Enagic Hawaii Branch is gearing up for The 7th Anniversary Celebration, and we want you to be there! 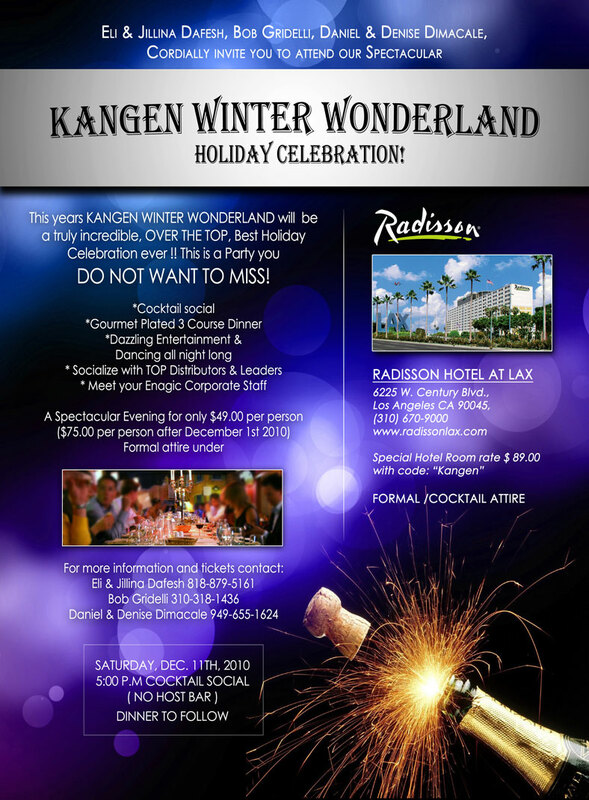 Join our exciting celebration as we remember seven remarkable years of sharing wellness and healthy living with Kangen Water® on the Islands. Hele mai ho`ohiwahiwa ! - Come Celebrate! We have reached the maximum number of attendees for this event. Join the Celebration in Torrance! 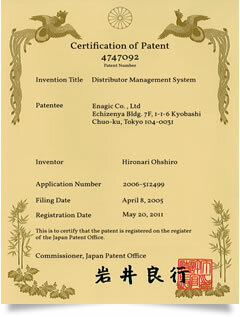 Enagic was recently granted exclusive trademark status for the ingenious 8-Point Business Model. This great achievement ensures that Enagic has established a cutting-edge business model that is unparalleled in the market today. The Certification of Patent was awarded May 20, and now it's time to celebrate! This event will also be the Global Recognition Ceremony for August. 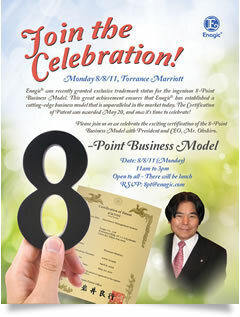 Enagic is celebrating the exclusive trademark status of the 8-Point Business Model in Tokyo. Here is the event information for our distributors in Japan. The California Sales Tax Rate will decrease by 1% effective July 1, 2011. Please refer to the link for the rate of each jurisdiction. 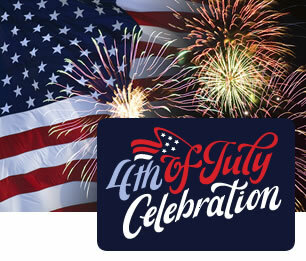 Enagic and its affiliate offices will be closed July 2nd, July 3rd and July 4th in observance of Independence day. 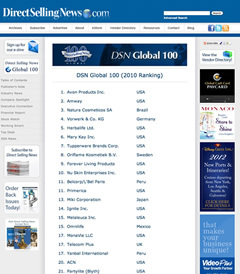 Enagic has been recognized in the Top 100 of Direct Selling News Global Rankings! This Appearance cleaning includes the replacement of the white and grey hoses. Come see the NEW Kangen Water® Shop across the border in Ontario, Canada. 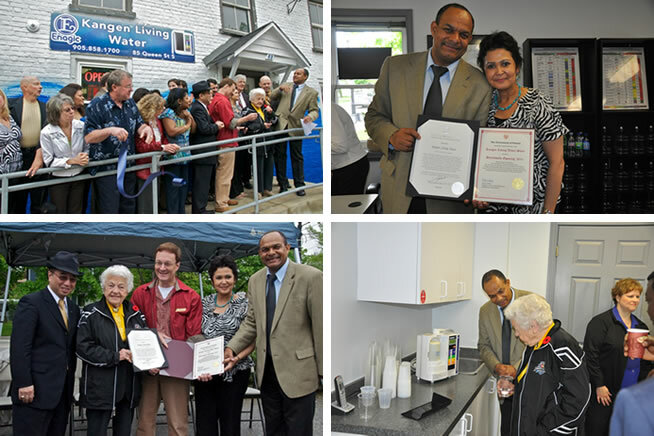 Distributor and former track and field Olympian athlete Freddie Williams has opened a Kangen Water® store in Mississauga, Ontario in the quaint village of Streetsville. Freddie and his wife, Daphne, are thrilled to offer a shop that provides demonstrations and information sessions for their community. The exciting grand opening of this Mississauga store was May 28th. Mayor Hazel McCallion was in attendance to show her support and present an award to Freddie and Daphne for contributing to the community's environmental health. For demonstrations, visit the new Kangen Water® Shop on Wednesdays at 7pm or Saturdays at 3pm. 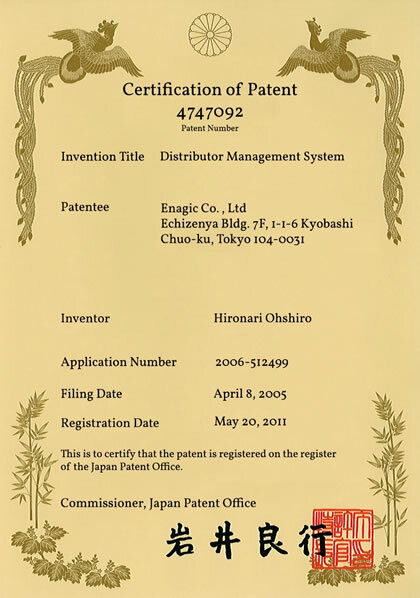 Enagic's 8-point business model has been granted exclusive trademark status. 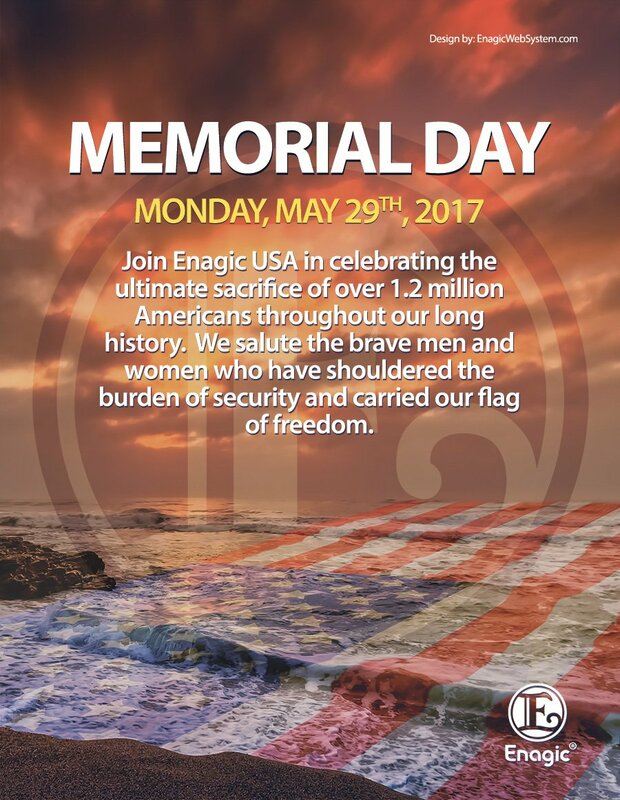 Enagic USA and all of its branches will be closed on Monday, May 30 in observance of Memorial Day. 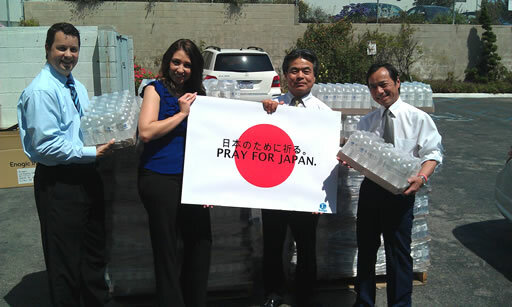 As the current water supply in the area devastated by the earthquake and tsunamis is contaminated, Enagic bottled pure water for the people of Japan to drink. As our machines are unable to be used at the present time, it's most important to get clean, drinkable water to the people in the affected areas as soon as possible. 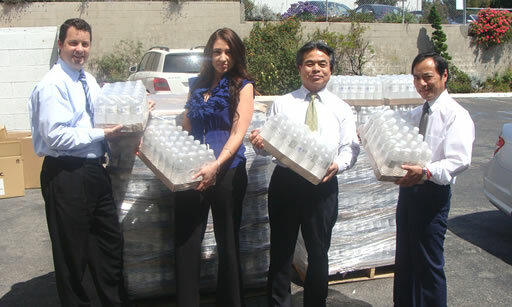 Donations from our distributors and partners helped fund the bottling and distribution of this water. Four 40 ft containers were sent which contained over 120,000 bottles that were sent to the affected areas. We hope to send another shipment soon. Your support and call for your continued empowerment is greatly appreciated. Enagic's energy expands to the European Union! Orders shipped to an Illinois address; if the order is processed in IL it will be charged a 9.5% tax rate. Orders processed in any other branch will be charged a 6.25% tax rate. 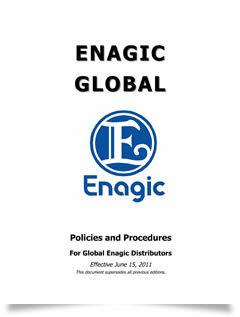 Effective April 01, 2011, given the supplemental changes, the newly stated articles below have been added to the Enagic Policy and Procedures for Global Enagic Distributors Article 9. 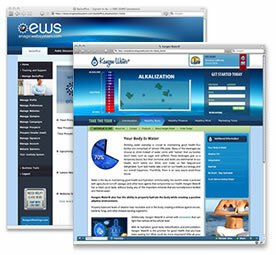 Distributors are prohibited from creating any independently-designed website relating to the Enagic business or using any non-EWS current websites. All distributors must receive prior authorization from Enagic USA, Inc. by submitting all promotional products such as DVDs, CDs, Brochures, Flyers etc prior to their use. Distributors who violate any of these new Enagic regulations will be subject to commission suspension and/or termination of distributor status without prior notice. The Compliance Department at Enagic has researched and found numerous medical, therapeutic, and income claims including promotional tools and products on the distributors' independently designed web sites. These new policies have been implemented for the purpose of protecting distributors who take the Enagic business seriously. Your understanding will be greatly appreciated. 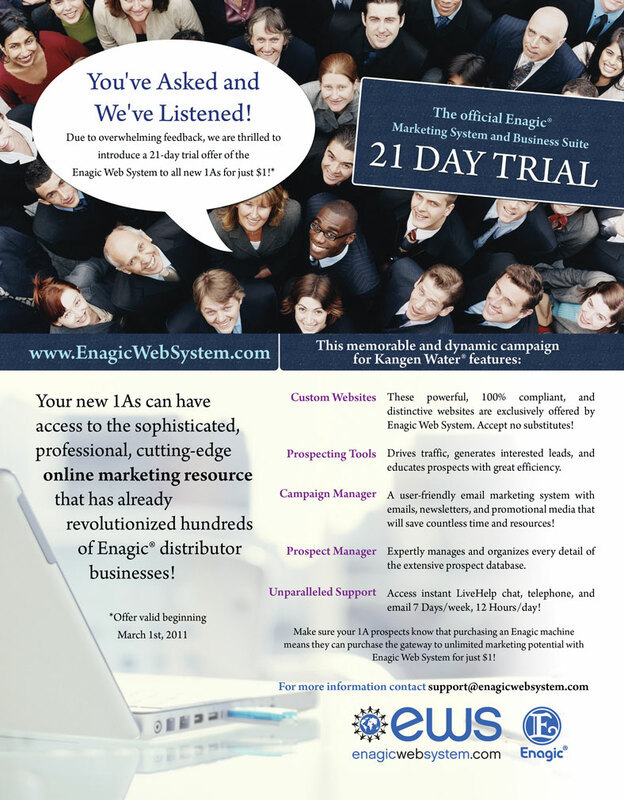 All distributors who are switching from their old websites and newly subscribing to EnagicWebSystem.com will be offered a 21 day trial by clicking the link below. 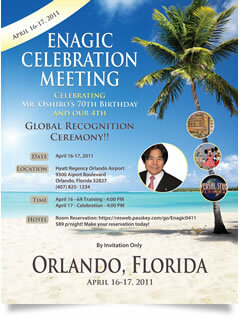 Enagic Celebration Meeting - Florida! Thank you so much for your concern over the recent catastrophe to strike Japan. As the situation becomes more transparent, day by day, we learn of the extreme loss of life and destruction of multiple cities across the Japanese islands. Rest assured our factory and Japanese operations are fine. Mr. and Mrs. Ohshiro are fine but of course worried about friends and colleagues. While the country as a whole comes to grips with the horrific state of affairs, please share your prayers, in your own personal manner. We appreciate your continued support, valued loyalty and empowered prayers. Your concern and empathy for our business partners, family members and associates in Japan truly touches our hearts. So very many distributors and Kangen Water® supporters have called and written to us asking how they can assist. Please look for additional information concerning Enagic's humanitarian relief fund to be announced in the very near future. Our business operations in Japan are running smoothly. 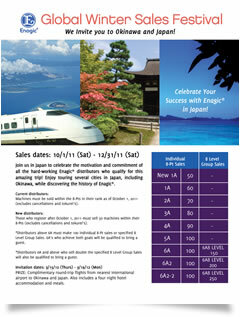 Our exports from Osaka, Japan have not been negatively influenced and Enagic employees in Japan are reporting to work. As you can imagine, a very palatable sense of pain continues to encompass the entire country of Japan. Your continued support, well wishes and prayers are very much appreciated. Donations are currently being collected at all Enagic offices. As you are aware, the northeastern region of Japan was hit by a devastating 8.9 earthquake on March 11th, triggering the largest tsunami waves ever experienced in the region. Our entire Enagic family is distraught and grieves for the families impacted by this, with loved ones lost or missing. 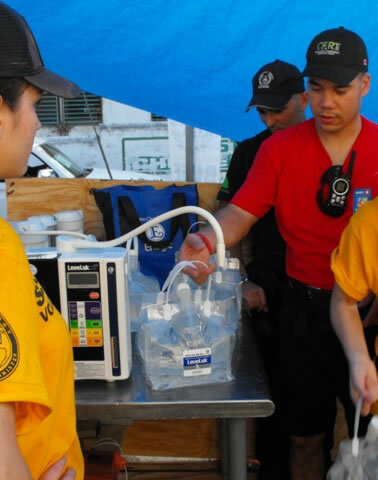 You may send a donation directly to Enagic USA by check, money order or cash and we will route this through the appropriate NPO's here in Los Angeles. 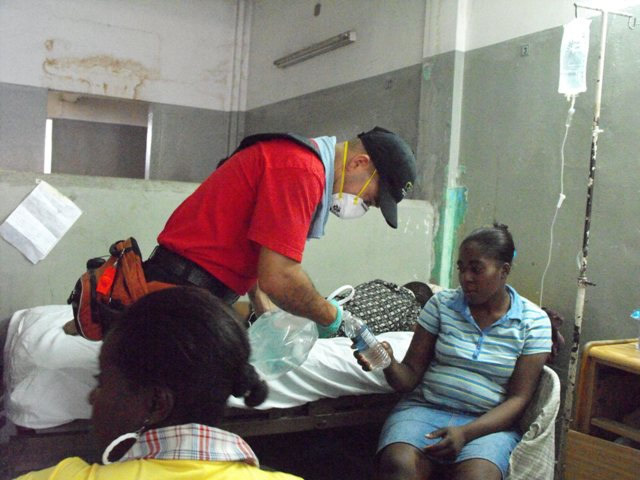 Thank you for your love and concern for those grieving and suffering from this catastrophe. Please take this opportunity to review the firm's policy on NO MEDICAL CLAIMS here in the Policies and Procedures (Reference page 9, section 8(i)). There is a zero tolerance policy. If a distributor does not follow the no-medical claim policy as listed in the P&P above, the distributor will be immediately be subject to termination proceedings. We ask for your continued cooperation on this very important point. The Power of Kangen Water® and Ukon! 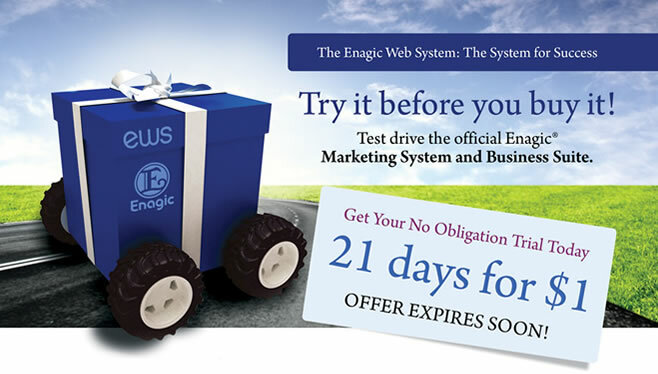 21 Day Trial with the Official Enagic Marketing System and Business Suite. Upgrade and SAVE! Maximize Your Enagic Ionizer with the NEW Filter. 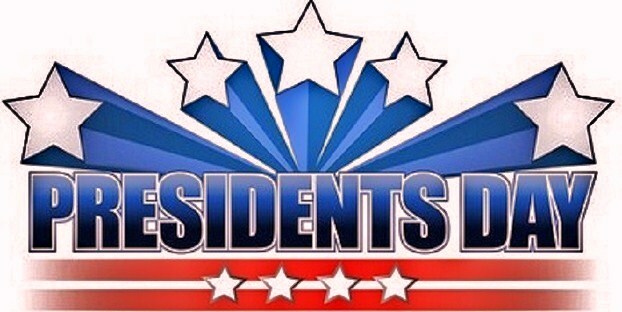 ENAGIC and its affiliate offices will be closed Monday, February 21st in honor of President's Day. USDA recommends drinking "water instead of sugary drinks." Take hold of the power of your tap water to be instantly converted to healthy Kangen Water®. The Enagic Hong Kong office will be closed February 3rd - 7th. It will resume its normal hours again on February 8th. 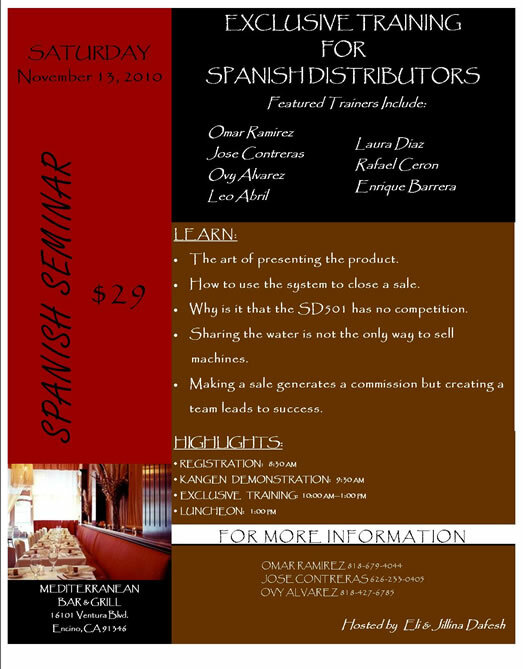 Seating is limited so get your SPANISH SPEAKING team and guests to this Demo & Training. 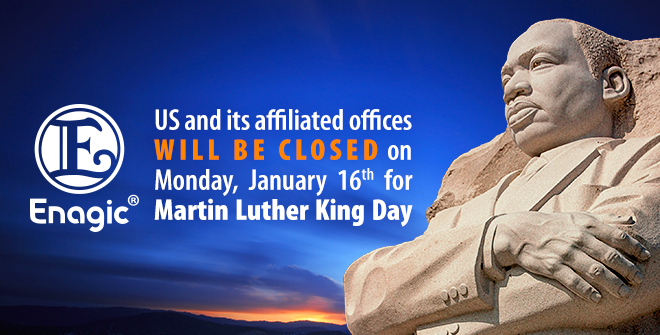 Enagic USA and all of its branches will be closed on Monday, January 17th for Martin Luther King Jr. Day. 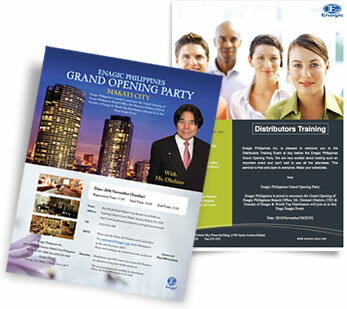 This brochure is your daily affirmation and reminder that there's no greater career fulfillment than being an Enagic Distributor. Keep one to read every morning to remind yourself of the true goals and values Enagic represents. This includes YOU... click here for details! Bill Drevyanko 6A is named Enagic's Most Valuable Distributor of 2010 and honored with a MVD trophy at the first-ever Producers' Meeting in Los Angeles. Daniel Dimacale 6A12-2 admires his trophy as he achieves the exclusive title of Enagic's Global 8-point Top Producer for 2010. Check out more pictures from the January Producers' Meeting on the Enagic Facebook page! Happy New Year to our Valued Network! 2010 ended as a fantastic year thanks to the amazing efforts of our distribution force. In particular, the Fast Track To 3A campaign resulted in 454 distributors achieving the rank of 3A throughout December, creating a new sales record for North America. In addition, upon reaching a new global sales record of 5,000 units sold, the firm was able to pay out the first installment of our Global Incentive. Throughout 2011, the Fast Track To 3A, Global 8-pt Challenge, and Local 8-pt Challenge will continue. Our previous 6A Meetings were reorganized as Producers' Meetings, allowing 1A-5A active distributors to mingle with their invited 6A network partners. The first Producers' Meeting, held on January 7th at the Doubletree Hotel in Torrance, CA, saw an amazing 250 active distributors in attendance. 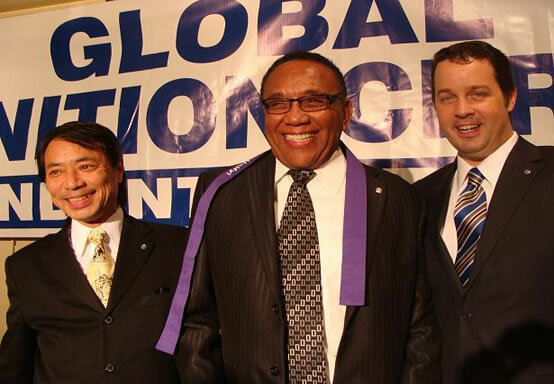 What's more, to propel Enagic's global initiative, two of Enagic USA's sales managers have been transferred overseas. 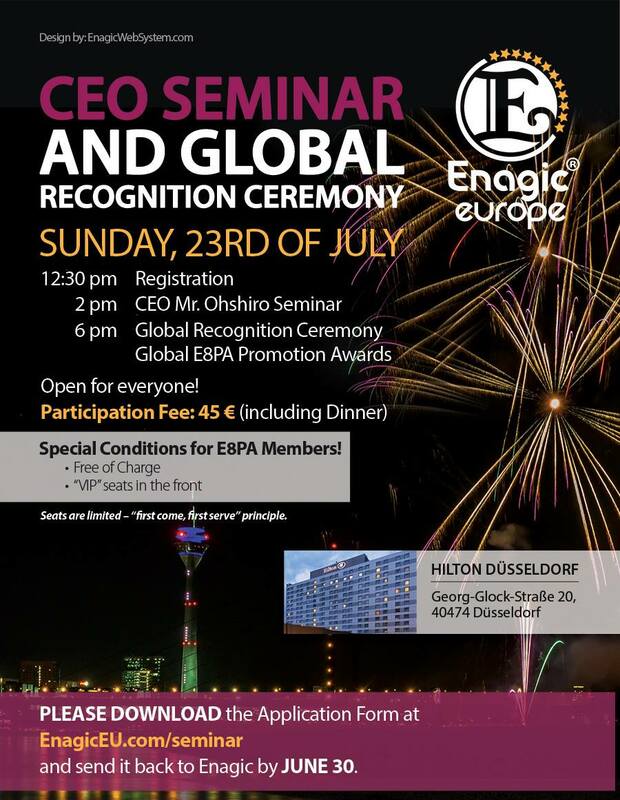 Tomo Takabayashi, who previously served as Enagic USA's National Sales Manager, will take on the responsibilities of European General Manager. Jack Hong, who previously served as Enagic USA's Chicago Sales Manager, will assume the position of General Manager of Enagic Korea. As we adapt and continue moving forward, we look forward to another successful and exciting year in 2011, united with our entire distribution force. 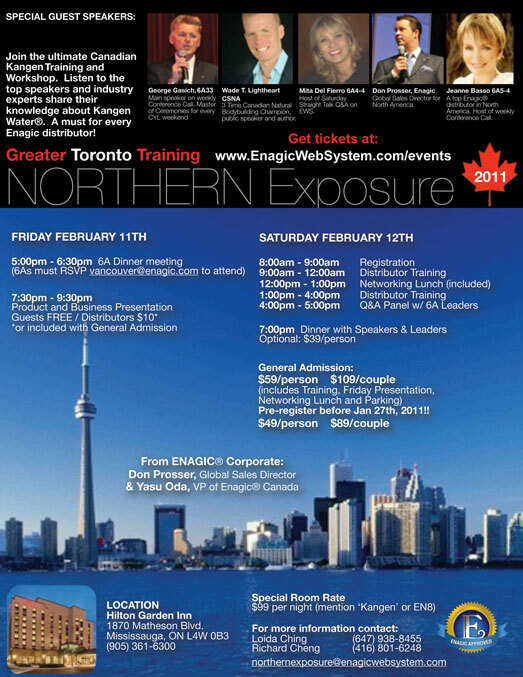 Please contact Enagic Canada ASAP, if you want to attend the meeting! Enagic USA and its affiliate offices will be closed on Monday, January 3rd in honor of New Year's Day 2011. Effective tomorrow, January 1st, 2011, our firm will charge appropriate sales tax for all states charging sales taxes. These taxes vary according to the address, zip code and tax jurisdiction appropriate to the client. Please use the following webpage to calculate the appropriate tax for your client orders. Please also share this information with your downline network partners. The entire management and staff of Enagic USA wish you a prosperous and healthy 2011! 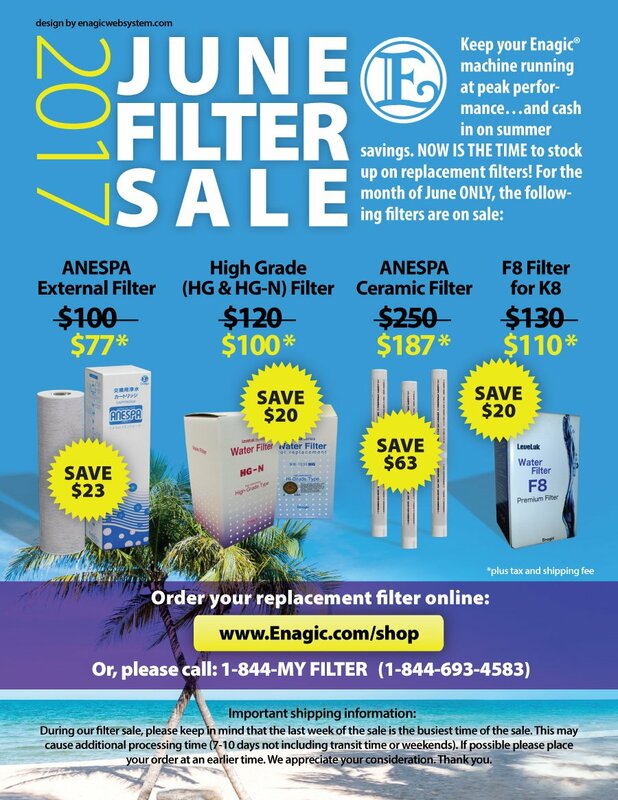 There are only 3 DAYS LEFT to purchase filters on sale! 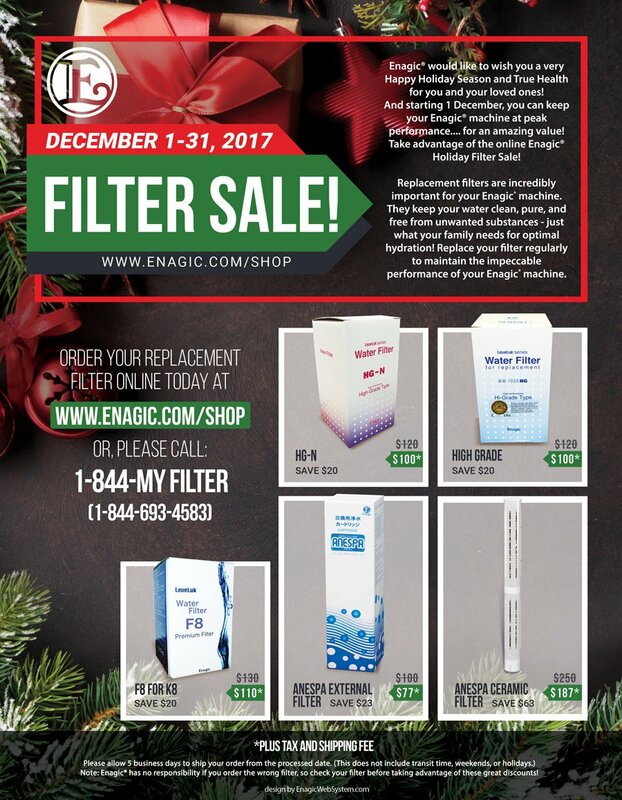 The Holiday Filter Sale ends December 31st! 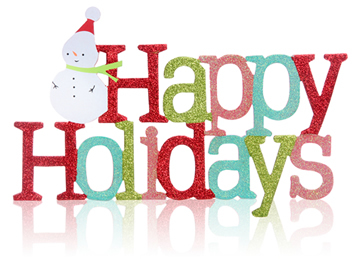 Enagic US and its affiliated offices will be closed December 24-26 in honor of the holiday season. 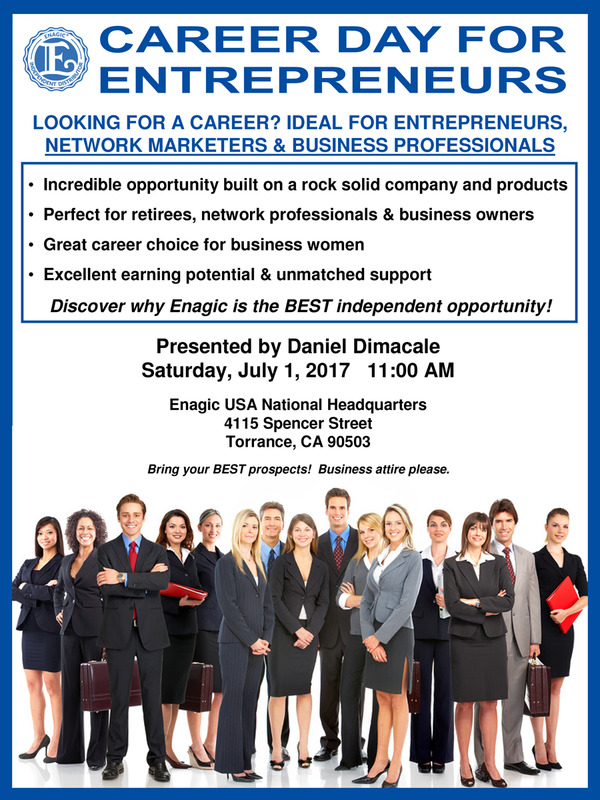 This is a great opportunity to learn about the business side of being an Enagic distributor that will get you started. You will also be able to ask any questions that you may have. 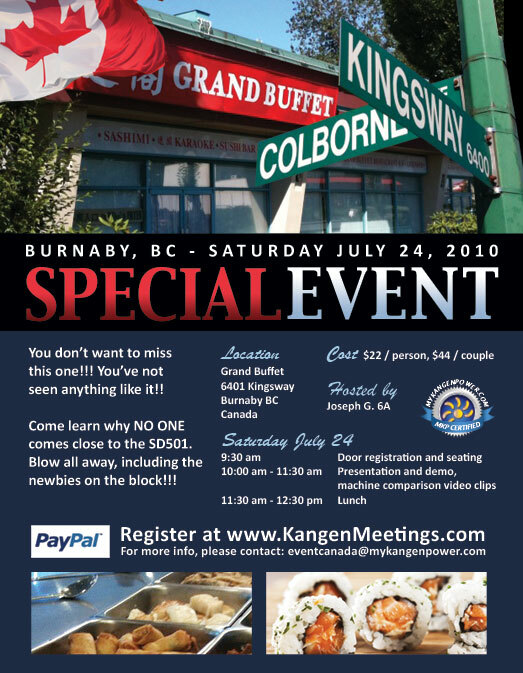 Join the ultimate Canadian Kangen Training and Workshop. 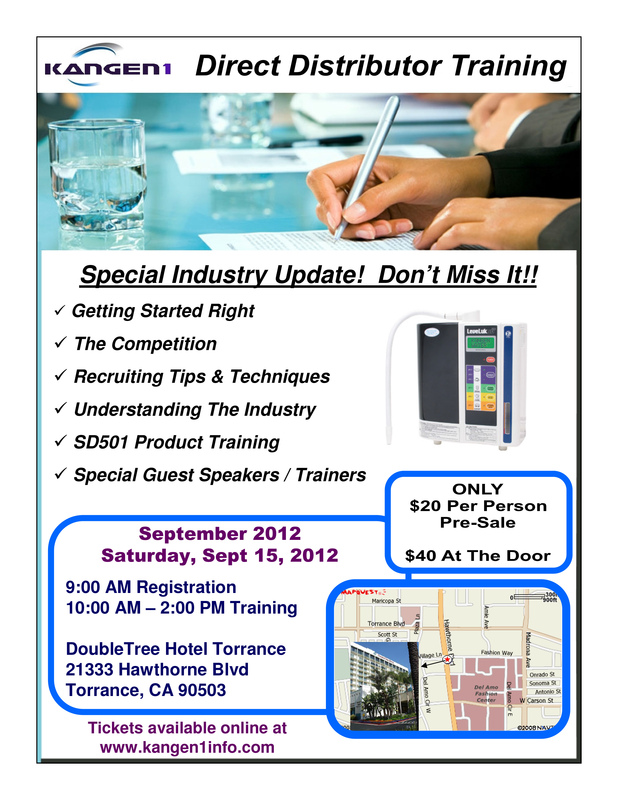 Listen to the top speakers and industry experts share their knowledge about Kangen Water®. A must for every Enagic Distributor! 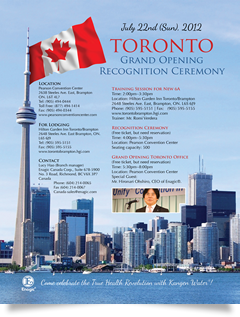 Our new Enagic® Korea branch will be open for business on December 15th, 2010. 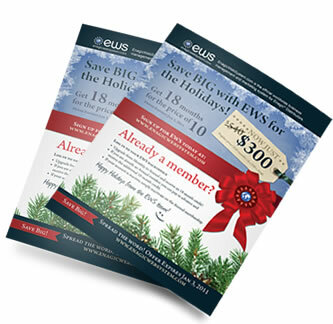 Save big with EWS for the Holidays! 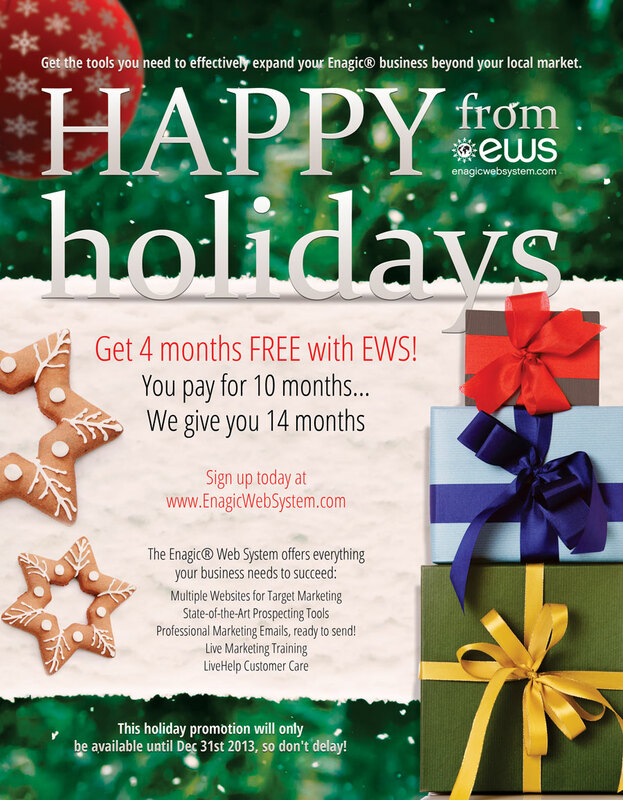 The holiday season is upon us and EnagicWebSystem.com wants to help you celebrate. For a limited time, we are offering our annual plan at an unheard of price! Between December 4, 2010 and January 3, 2011, you can purchase 18 months of service for the price of 10. What a savings! 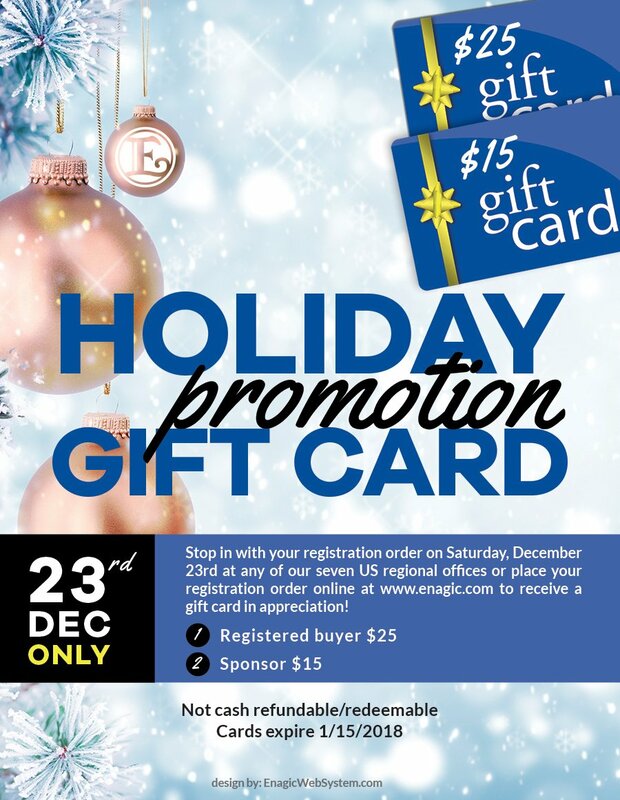 You'll enjoy your holidays even more knowing you've saved a bundle on your website and have an additional 18 months of service ahead to continue to build your Enagic business. Happy Holidays from the EWS team! Our firm has been charging sales tax on the various branch offices that we have opened. However, due to growing sales, our firm will charge sales tax for all 50 states effective January 1, 2011. The tax amount of each state will be available by entering any zip code in our website. 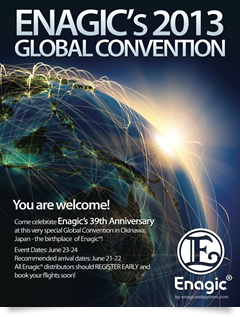 Enagic's "Fast Track to 3A Campaign" has been wonderfully successful; spawning 150 new 3A distributors globally. This has represented a magnificent success and serves as a brilliant example of distributor achievements. As a result, twenty-seven new 6A leader distributors and four new 6A2 senior leader distributors have been born. 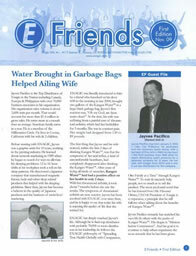 For additional details, please reference the November issue of E-Friends . As the "Fast Track to 3A Campaign" continues through the month of December, a resounding chance is presented to both new distributors and existing distributors alike. 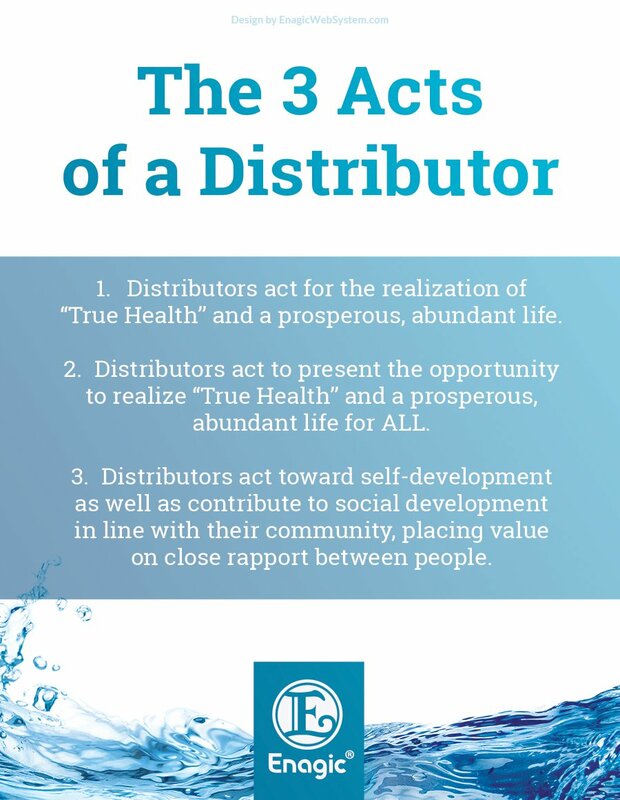 We encourage our network partners to return to the origin of our firm's inception: that of the fundamental 8-pt standard commission program that drives our global expansion of Kangen Water®. As the firm's regular 8-pt commission program permeates our endeavors, starting in December of is year, we are pleased to announce the expansion of a Local 8-pt Contest. Throughout the United States, Canada and Mexico, divided amidst six regional areas, monetary rewards for the top five 8-pt commission earners will be presented. For detailed information, click here. In addition, our Global 8-pt Contest will continue uninterrupted. In November of this year, our ENAGIC EU (European Union) operations celebrated a new sales result of over 500 units sold monthly. In other oversea operations, the firm's Philippine office celebrated its grand opening on November 28, with approximately 700 guests in attendance. Here within the US, December is celebrated as an important holiday season. The entire staff, management and executive team of ENAGIC USA wish our entire extended distributor family a wondrous holiday season and shall pray for your continued good health and success. Come and see why thousands of satisfied people are pouring in each day! Come and speak to people in your community. on Saturday, December 11th, 2010 in Los Angeles! 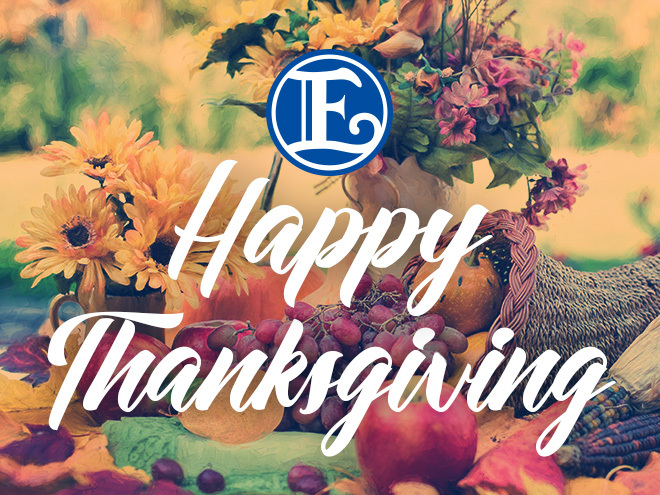 All five branches of Enagic USA will be closed from Thursday, November 25th to Sunday, November 28th. on Thursday, November 11 and will reopen on Friday, November 12. It is necessary to maintain your machine on a regular basis in order to sustain its maximum effectiveness. Learn how to on the new. 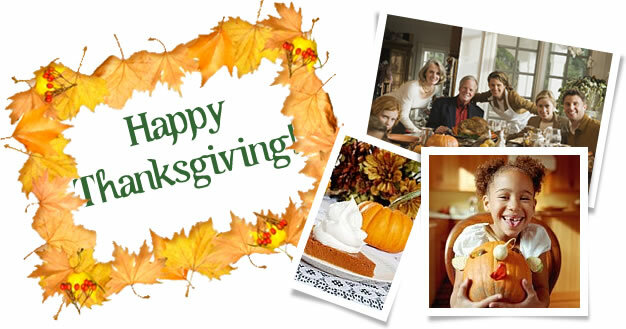 Enagic Europe GmbH will be closed on Monday, November 1 for "Allerheiligen." Enagic de Mexico will be closed on Tuesday, November 2 to observe the "Day of the Dead." Welcome for Meet & Greet and Powerful Distributor Training in Australia! 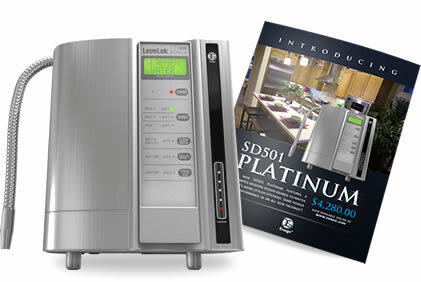 The brand new SD501 Platinum will go on sale this week. Be one of the first to purchase this incredible machine! on Monday, October 11th for Columbus Day. 5pm PST on Monday, October 11th. The Philippines office will be closed for business on Friday, September 10th. If your contact information is not up to date, please send us your email address and other contact information as soon as possible. You have the option to send us this information via email, fax, or mail. We thank you and appreciate your cooperation. 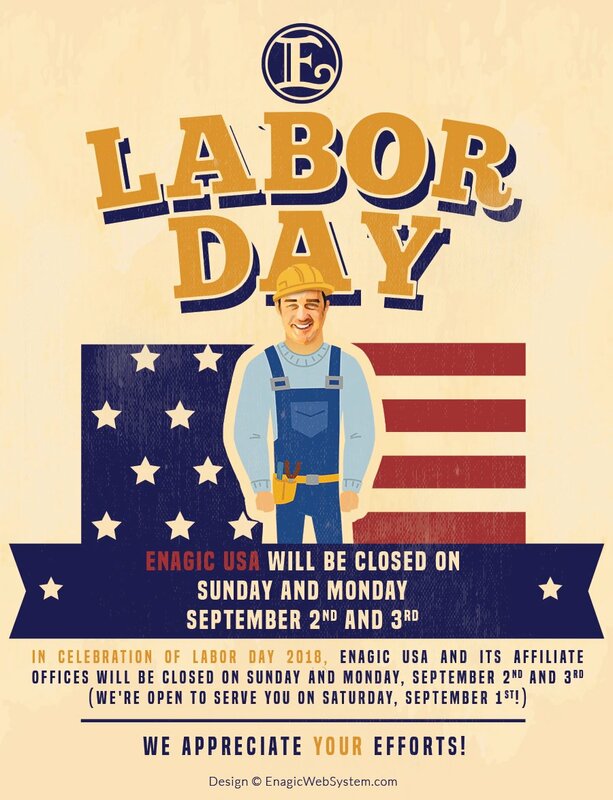 Enagic USA HQ and its affiliate branch offices will be closed Monday, September 6th for Labor Day. The Torrance HQ office will be open this Saturday, the 4th, to process orders. 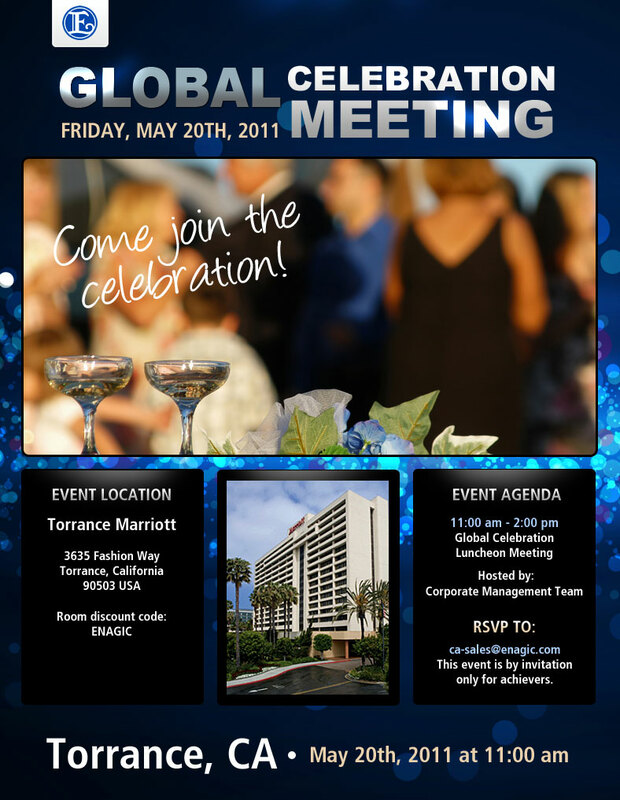 Join in the celebration of Enagic's First Annual Global Training! The Enagic Italy office building will be closed and not able to answer phones until August 20th. However, they will be receiving emails sosales-italy@enagic.comfor questions. Thank you. 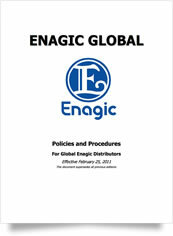 Article 36a was added to Enagic's Policies and Procedures document. Please make sure to download or review the new material. 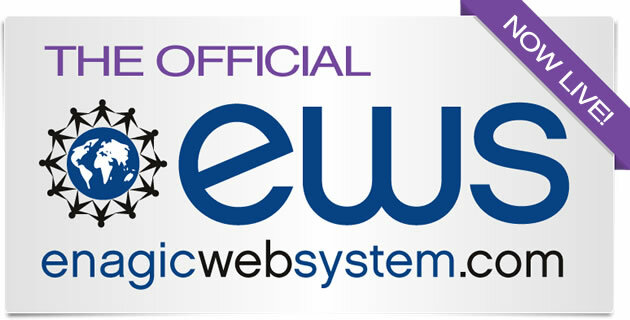 Enagic Web System (EWS) - Launches Aug. 1st! 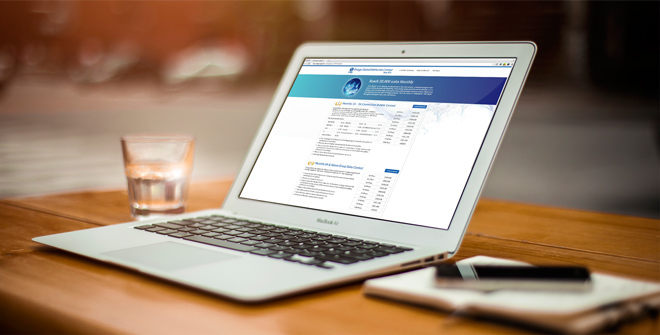 Effective August 1st, 2010, Enagic Global Headquarters is pleased to announce the long-awaited release of its premium independent distributor replicated website system! 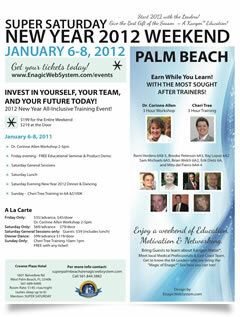 As many of you know, Enagic's web initiative has been in development for several months. 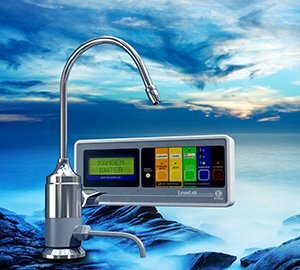 This monumental effort has been underway to ensure that all distributors can effortlessly broadcast their promotion of Kangen Water with a centralized, unified presentation. Enagic implemented this web initiative internally in its commitment to maintain the integrity of its own distributor database. The Enagic Web System (EWS) secures its global image and protects every interest to continually expand the worldwide marketplace. This pre-approved, innovative web system will provide its distributors with the highest quality, cutting edge business tool so they can successfully and efficiently market their business. The Enagic Web System will equip distributors with incomparable and limitless options to professionally and comprehensively promote their own Enagic business. 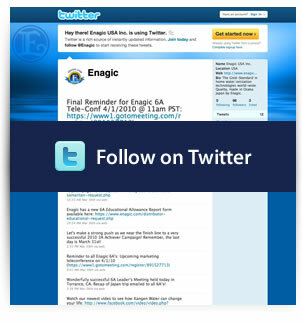 Enagic has exceeded every expectation with this new, powerful and progressive web system. Enagic Web System - unparalleled distributor support. 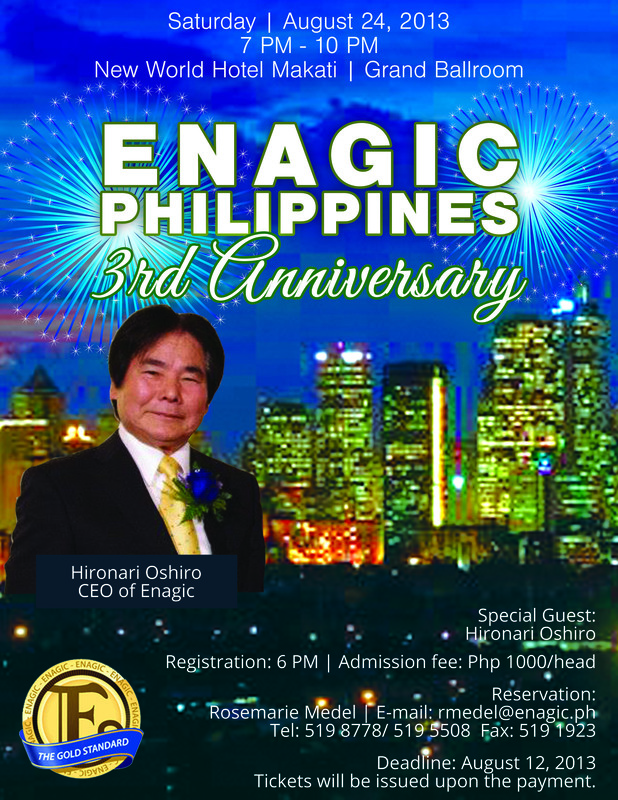 Enagic keeps expanding globally and is pleased to announce that the new Philippines Branch is now officially open for business. 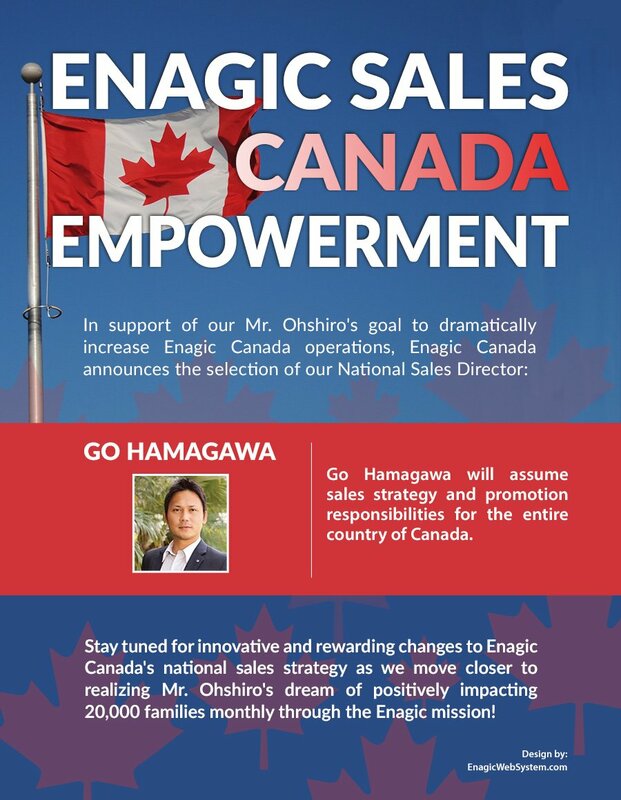 Enagic USA is proud to announce the promotion of Gotaro Hamagawa to the position of West Coast Sales Manager effective August 1, 2010. Mr. Hamagawa has extensive experience with the firm's information and technology centers and brings to bear a solid understanding of Enagic's core philosophies. 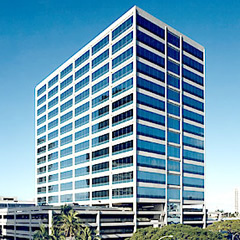 Positioned at the firm's Los Angeles sales office, he can be contacted at ca-sales@enagic.com. Mr. Takumi Nagaoka has returned to Japan on urgent family matters. 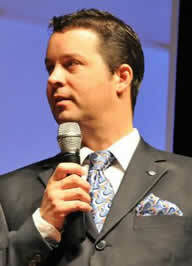 His Texas Sales Area Manager will be filled by Mr. Tom Nuebel from August 2nd onward. He can be contacted at tx-sales@enagic.com. Get ready for a Fabulous Friday at Enagic Corporate in Torrance, California! JIYUU Attendees - head on over to the "Samurai Social" at the Crowne Plaza, Redondo Beach, at 7:00 p.m., and continue the flow! *Please bring your JIYUU PayPal receipt for entry to the "Samurai Social." Come take a tour of Enagic Corporate & see incredible demos and informative seminars! Look what we have lined up for YOU! 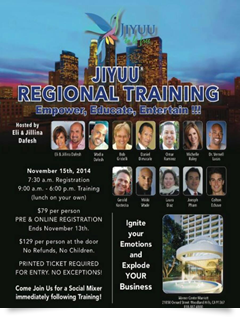 Special FRIDAY Agenda for ALL Enagic Distributors and JIYUU Training Attendees! Enagic USA and all of its US branches will be closed from July 3rd-July 5th. Normal business hours will resume on Tuesday, July 6th. Please enjoy your July 4th weekend! 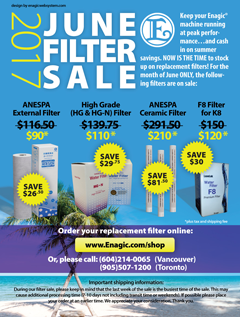 Enagic Canada will be closed on July 1st and will resume normal business hours on July 2nd. 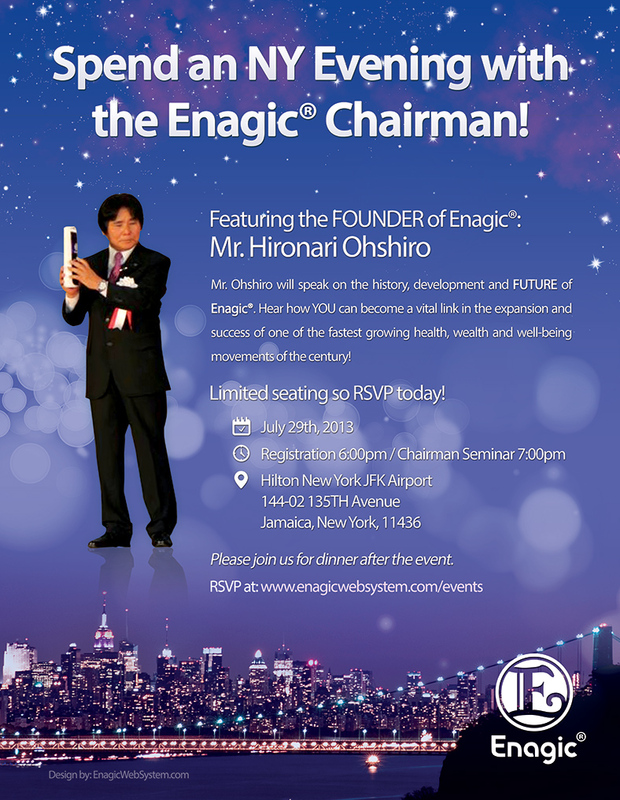 Don't miss this special event from July 16-18 that will feature Enagic's Top Producers and honored guest and CEO of Enagic, Mr. Hironari Ohshiro. Register today! 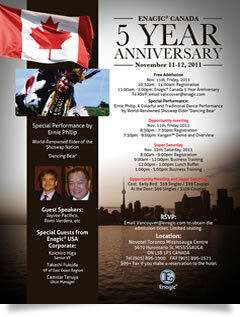 Enagic Hong Kong 5th Anniversary! 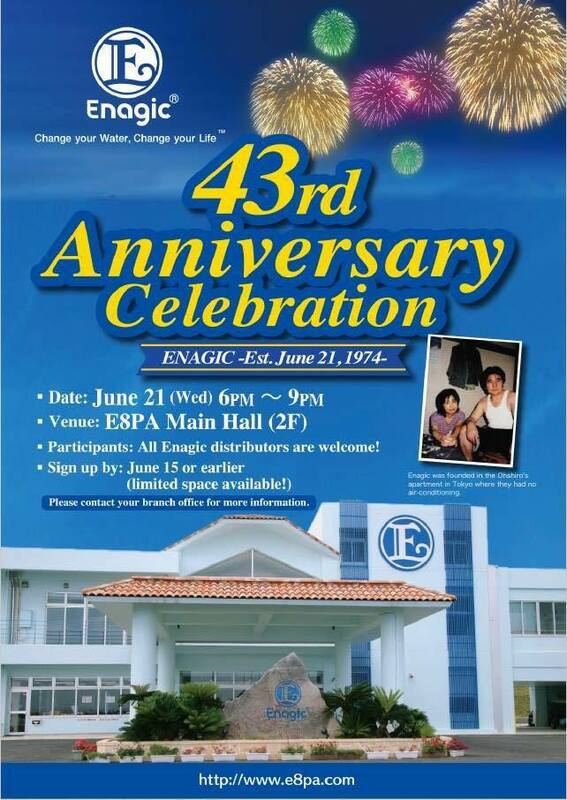 Enagic HK has been set up for 5 years. Enagic HK and our C.E.O. Mr. Ohshiro would love to see all Distributors at our 5th Anniversary Party. Please join us for the exciting event. Location, time and additional information is found on the flyer! From March 15 to 20, a group of top distributors from the United States and Asia visited Japan, traveling to various places. The Purpose of this journey was to discover the roots of Enagic Spirit. The Ukon XB Cancellation Request Form has been updated. Effective June 1, 2010, distributors (both individual and corporate accounts) will be granted only ONE name change per ID number. Thank you for your cooperation. 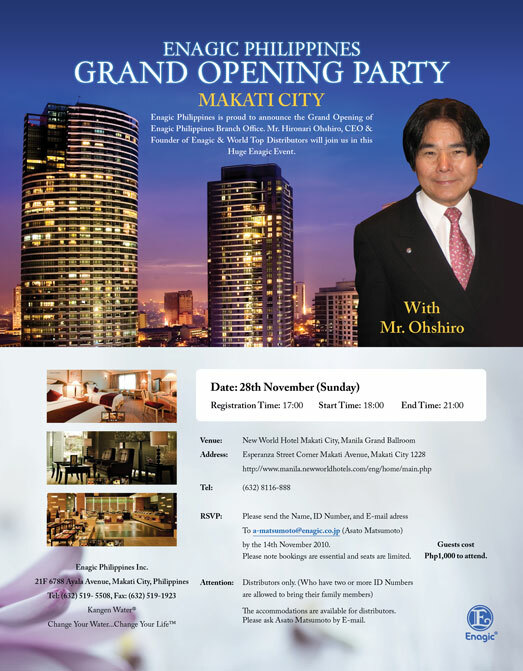 Enagic Australia and Mr Ohshiro would love to see all distributors at our Grand Opening Party. Please join us for an exciting event and a motivational speech from Mr Ohshiro. Fax: 02-9878-1200 by 4th June. Please note bookings are essential and seats are limited. So please RSVP early to avoid disappointment. Up lines please RSVP for their down lines. Please RSVP Name and ID# for each person who will attend. Doors close at 11:45, you may not be able to enter after this time. 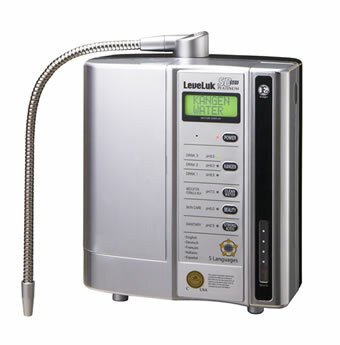 The LeveLuk Portable is available online at the Enagic shop. 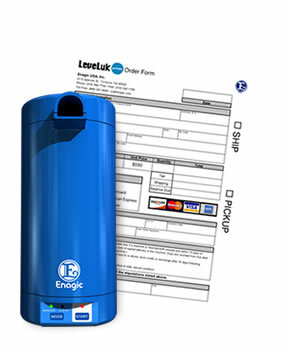 You can also fill out the new LeveLuk Portable order form (also available on the document download page) in advance and send it to your nearest Enagic plaza. 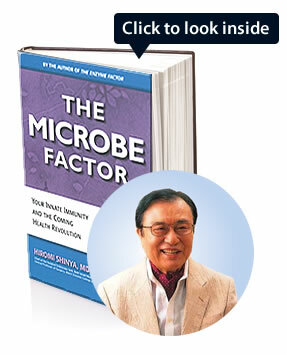 Enagic USA is pleased to support the promotion of world renowned gastrointeralogist Dr. Hiromi Shinya's newest book, The Microbe Factor. 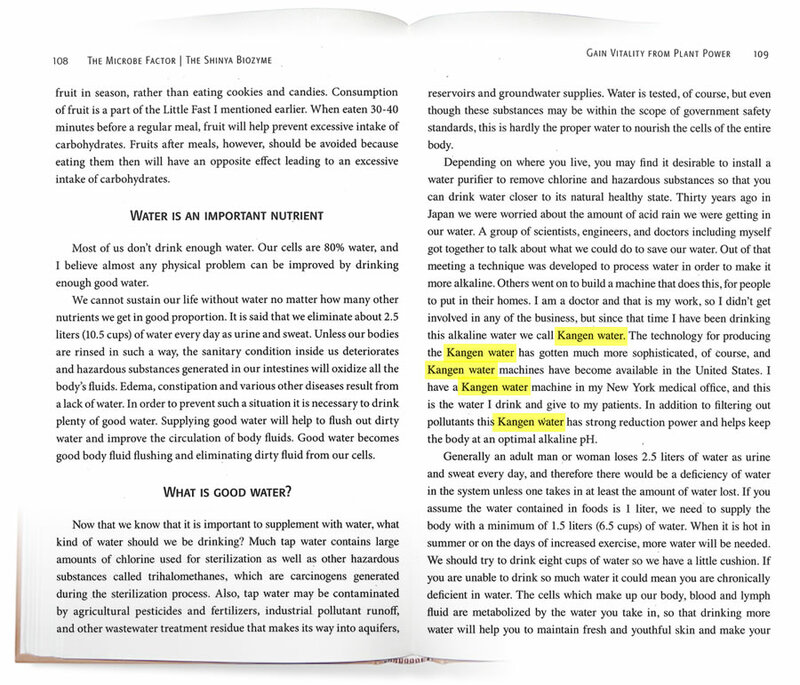 In his follow-up to his bestseller, The Enzyme Factor, he explains the merits of drinking Kangen Water. 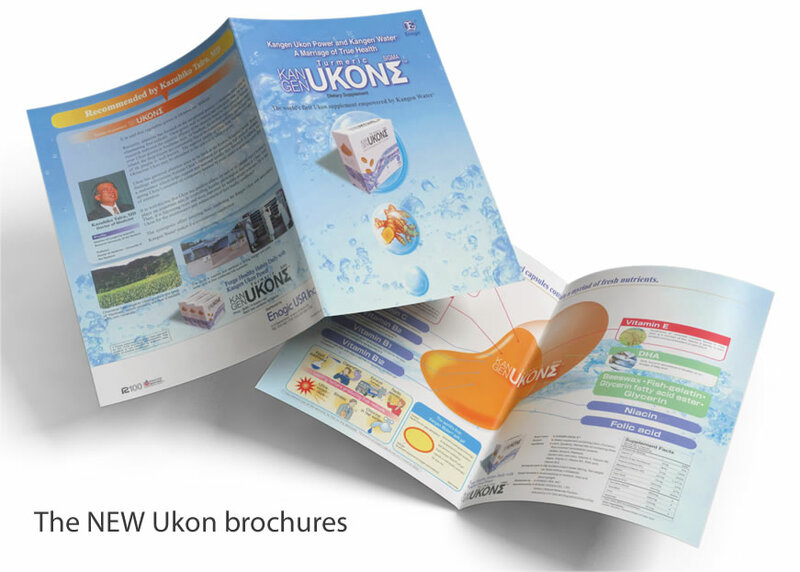 The NEW Ukon brochures are now available! 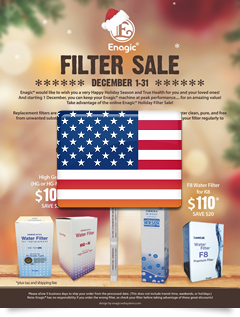 Feel free to drop by any Enagic plaza across the US for purchase. The brochures will also be available to you online soon. 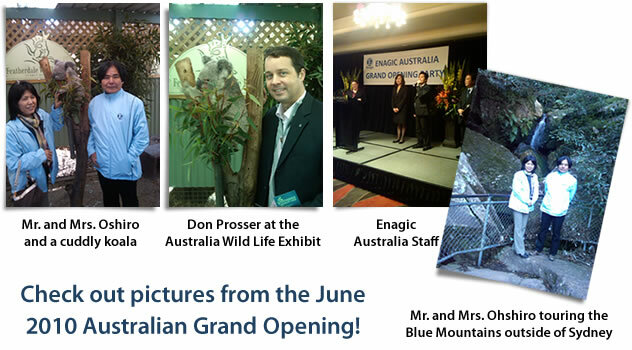 Enagic will require Tokurei (Good Samaritan) distributors to purchase a "Tokurei Starter Kit"
Enagic is pleased to announce the opening of our office in Sydney, Australia officially set for May 10th. A Grand Opening ceremony will occur in mid-June. Updated USA Sales Area Map for download! Effective immediately, all Florida sales will now report to the New York office, and no longer the Texas office. Takumi Nagaoka as the Texas Sales Manager! 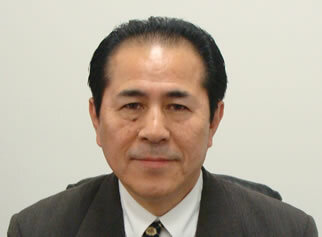 Enagic USA is pleased to announce the nomination of Takumi Nagaoka as the Texas Sales Manager effective April 1st, 2010. 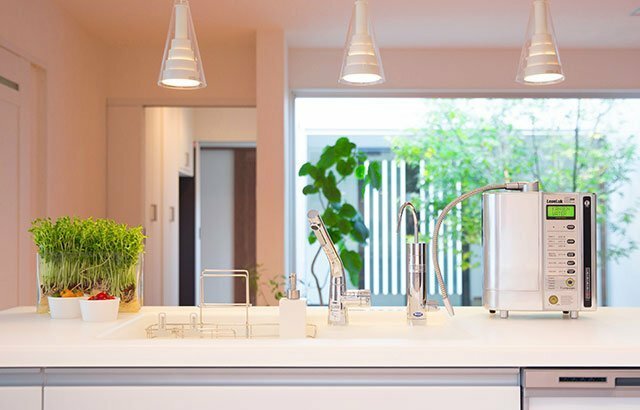 Mr. Nagaoka brings with him a varied global experience having worked in operations at the Enagic Japan Head Office in Tokyo as well as sales at the New York branch office. Mr. Nagaoka will assume sales responsibility for the Texas sales area stretching from New Mexico east to Florida. 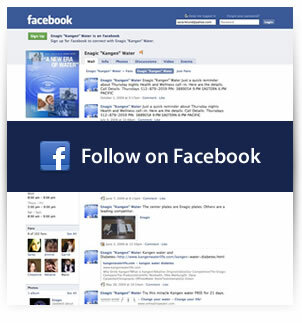 Enagic is on Facebook and Twitter! We are making a strong push as we near the finish line to an extremely successful 2010 3A Achiever Campaign. Let's also encourage those close to accomplishing this impressive feat to reach the goal, as their hard work will be rewarded generously! Remember, the last day of the campaign is March 31st. As one door closes, another one opens. We are pleased to announce the start of a new 3A Achiever Campaign for our EU distributors starting April 1st! 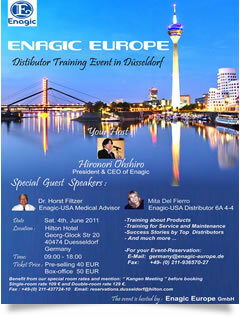 Enagic is dedicated to empowering the European market by spreading True Health overseas in a dramatic way. What better way to celebrate the opening of our brand new office in Italy than to motivate the field with the implementation of the proven 3A campaign! 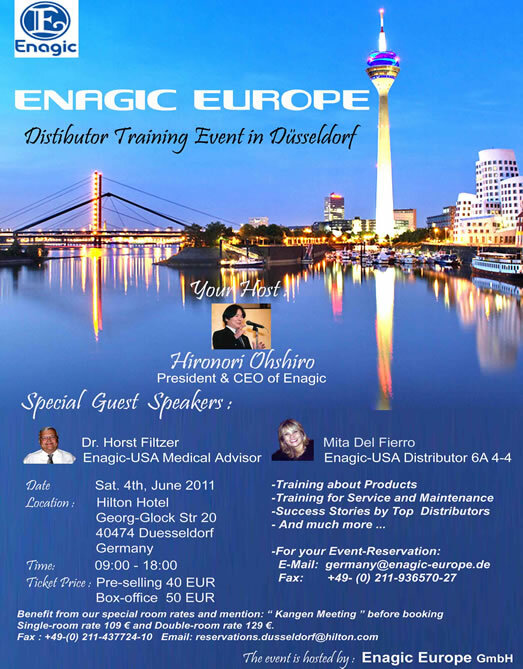 For more details, please contact germany-sales@enagic.com where they can answer all your questions about sales in the EU. Congratulations to all the new 3As and here's to your continued success. Let us continue to spread compassion locally and globally! Whether you are on vacation, or on the run, you always want your Kangen Water® within reach. 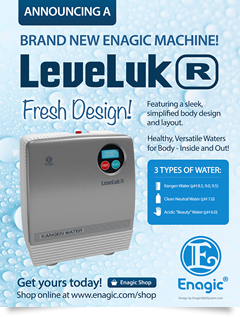 Based on this popular belief, Enagic USA is happy to introduce the new Leveluk Portable. Now wherever you go, you can easily enjoy your Kangen Water®. 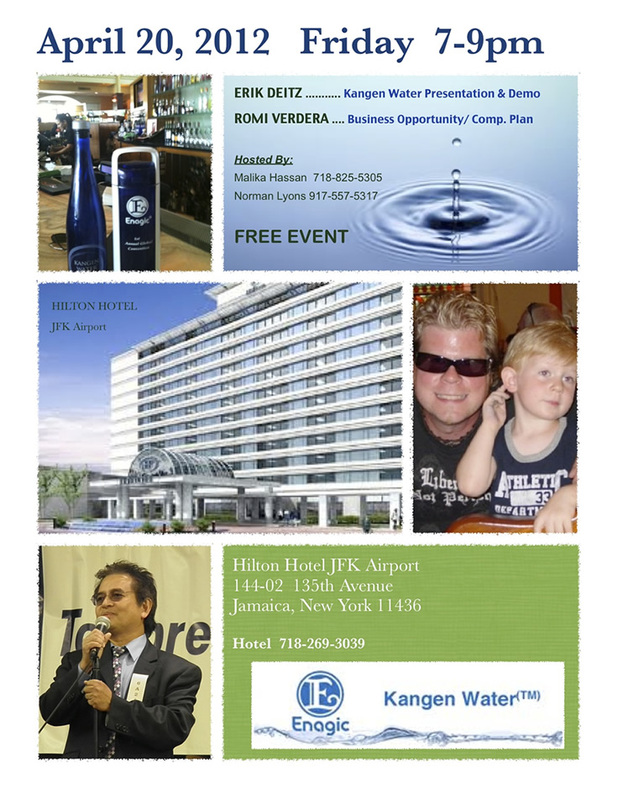 Portable Kangen Water® for the World! 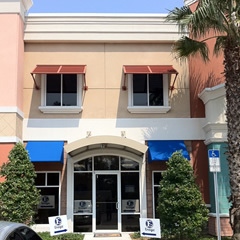 Enagic USA announces development and expansion of its newest information center! Enagic is taking proactive steps to increase communication with distributors and make more information easily accessible. 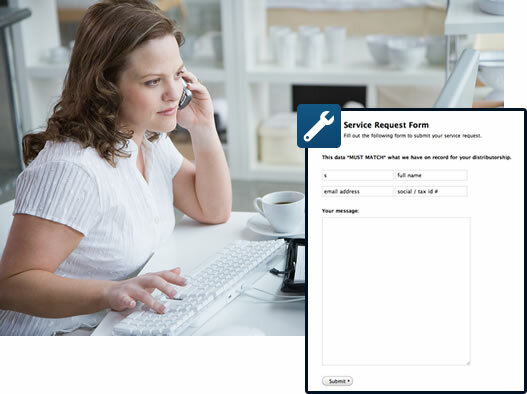 From genealogy reports to thank you calls to filter re-orders, EIC is dedicated in providing the highest level of customer service to our users and distributors. Enagic USA is committed toward the philanthropic support of UNICEF, a world-renowned humanitarian organization dedicated to child survival and development, gender equality and childhood protection. In the highest spirit of true human compassion, a portion of our profits is donated to UNICEF annually, all in the hopes of positively influencing the lives of children throughout the world. A new return policy has been put into place that is easier to understand and extends the timeframes! You may now request your genealogy online and receive it via email within 2-3 business days! 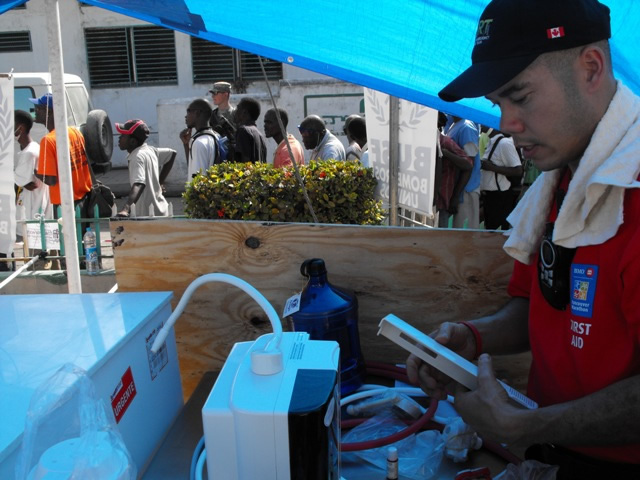 At the end of January, Enagic sent vital supplies and Kangen Water® machines to the people of Haiti, overcome by the devastation of the massive earthquake. 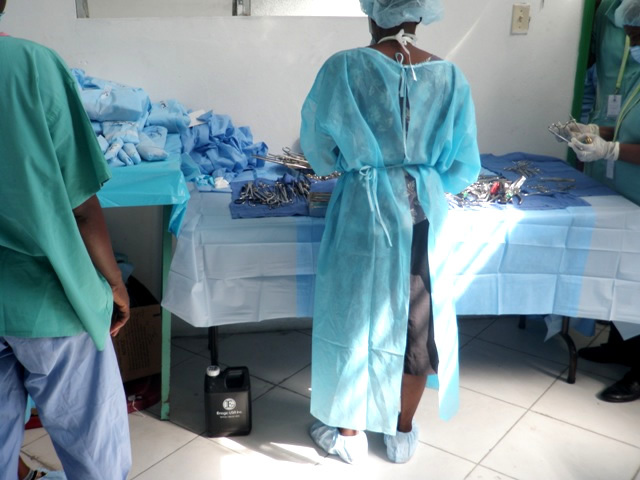 These supplies were implemented at one of the major hospitals in Haiti where numerous people were able to partake of Kangen Water®. Enagic USA is pleased to announce the formation of its proactive Marketing Division. Don Prosser has been nominated to serve as the Director of Marketing. The Marketing Division will aggressively lead Enagic's expansion into the direct sales field of electrolysis water generators. 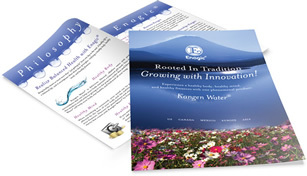 Enagic's proprietary Kangen Water® is the world leader of alkaline water generators globally. Enagic feels that until this time, the image of a "bonus" within its marketing and award system has been misunderstood. The corporate philosophy and strategic vision behind these incentives and awards is in fact based on the actual generation of sales volume. The firm's promotional materials and sales pamphlets will be revised to reflect these positive changes. Any distributors possessing current promotional materials will be able to return these to the firm with new materials swapped for no charge. We ask for your cooperation during this positive and exciting period of improvement! The Income Verification Form has been added to the document download page. Comments about any inaccuracies in regards to the 1099 you have received. Reference: Enagic USA issues 1099 reports to individual distributors earning in excess of $600 annually as perIRS regulations. Corporations do not receive 1099's as per IRS regulations. The unit must be shipped to the buyer's home or work address. A work address must be verified by showing proof of employment. Any other type of alternate shipping address will not be accepted. Only the buyer can pick up the unit, no exceptions. A valid ID must be shown to the Sales Office Staff. Single payment sales are not subject to these rules. These rules are effective as of Dec 7th 2009. 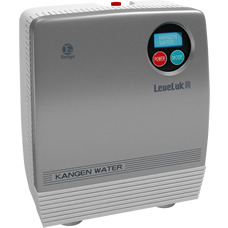 Recently, we have received some inquiries regarding utilizing other filters manufactured by other companies for our Leveluk Series of Kangen Water® machines. 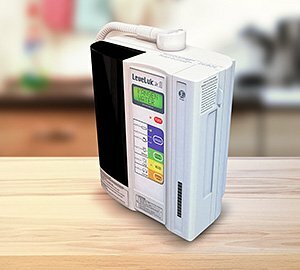 Our water filters are exclusively manufactured for our Leveluk series in our Osaka, Japan factory, which is authorized to manufacture medical equipment by the Japanese Ministry of Health, Labor and Welfare. 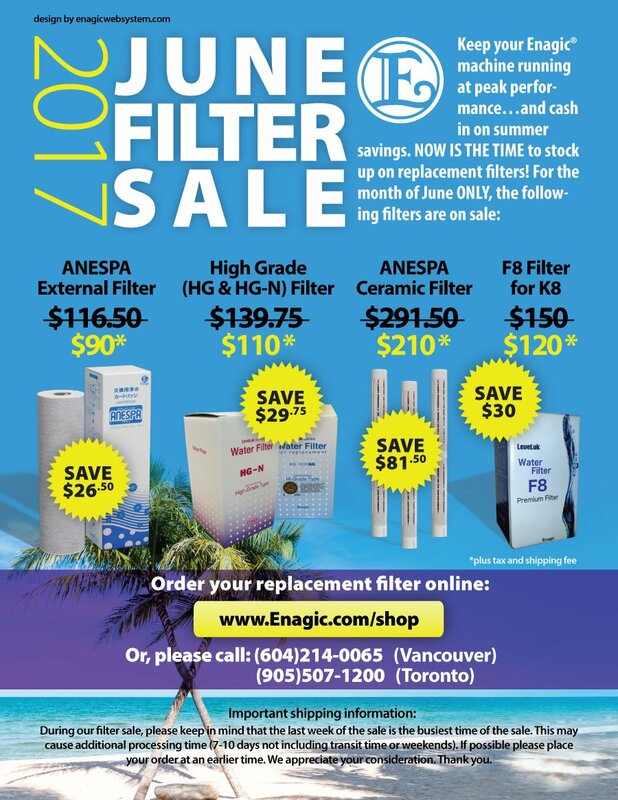 These filters are then exclusively distributed by the Enagic Group only. We have never certified any other factory or company to manufacture our water filters or out-sourced the filter production. In such case as a malfunction occurs to the machine or the presence of impurities in the water is detected without using our specialty filter, we will not assure either the quality or the warranty. 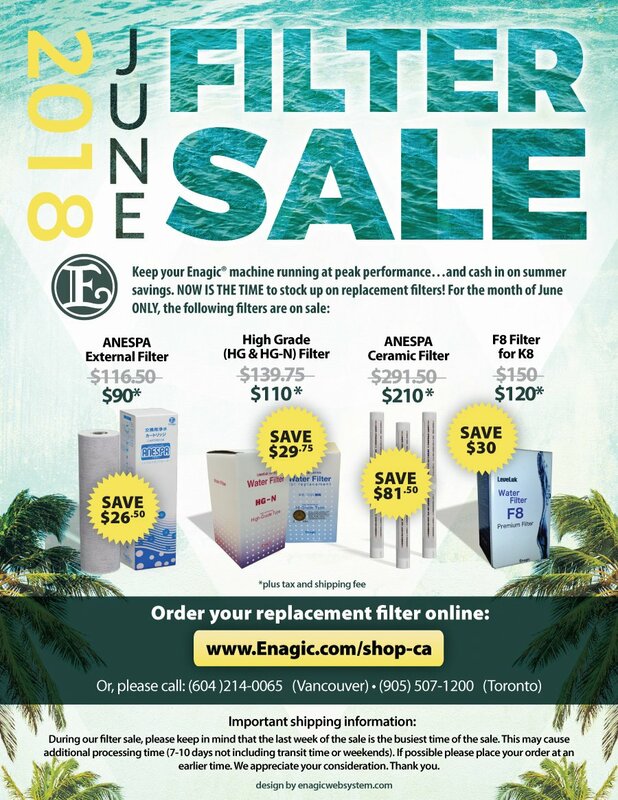 Please ensure that you use our specialty, genuine filters which have the Enagic Logo on top in order to produce the highest quality KANGEN WATER®. We are proud to introduce to you, our E-Friends newsletter!! 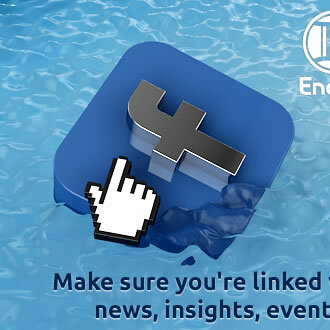 E-Friends is created as a tool for our distributors to keep up with current events and new announcements. You will be able to read very interesting stories about distributors who use and distribute our products, see pictures from Enagic events, and receive motivational advice. We also include very detailed questions and answers from our own Medical Advisor Dr. Filtzer. Each month will be better than the next, so don't miss out!! It is well known to the company, as well as our Distributor Network, that there have been scores of internet websites created by our competitors that attack and criticize our company, Enagic. They have existed as long as we have been in operation and have been quite unfounded, ignorant and more or less relatively harmless. Our policy is to expand our business with honor and fairness with our competitors in this quickly-expanding global market. 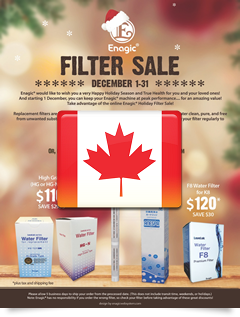 In spite of the less than honorable ethics and business practices used by our competition, Enagic will continue be the premier and paramount manufacturer of water ionizers and health supplements in the world. 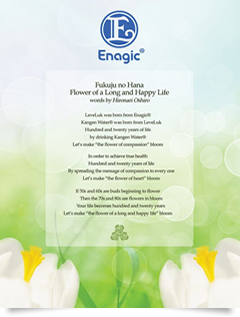 Staying true to the philosophy of President Ohshiro will ensure that Enagic will continue its rapid growth and amazing success for decades to come. 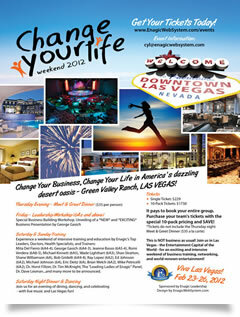 Tickets are still available for the January 29-30th CYL Event. CEO & President of Enagic, Mr. Ohshiro will be attending this event!! So, don't miss this event! Tell your friends, neighbors and your team!